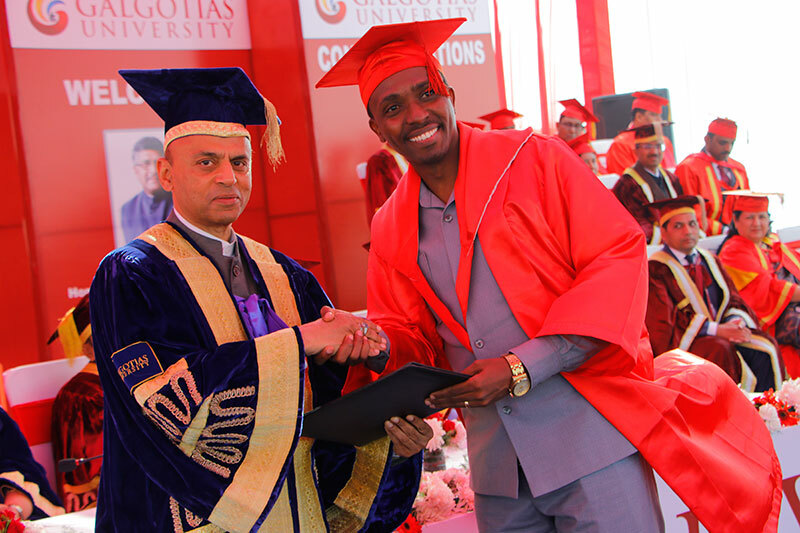 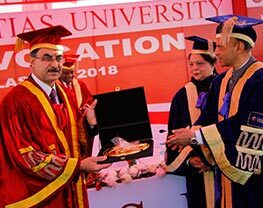 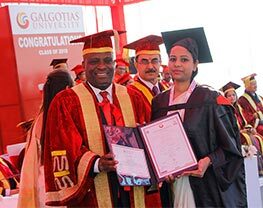 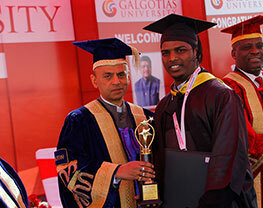 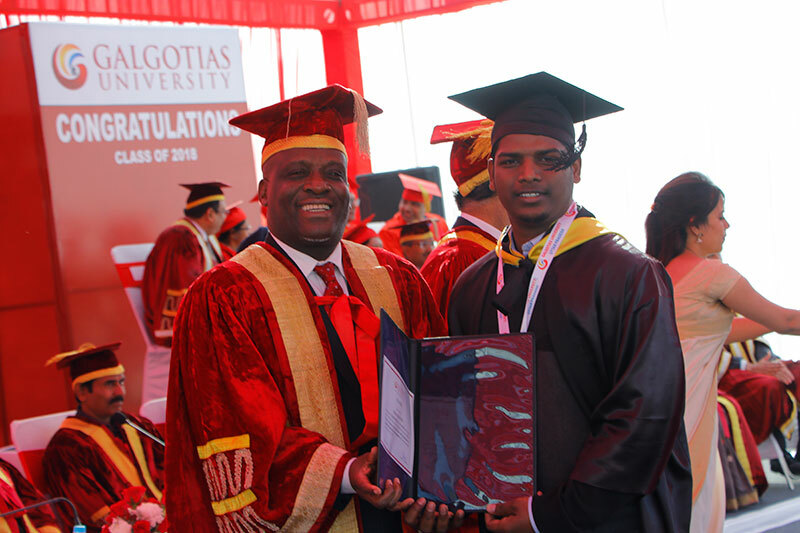 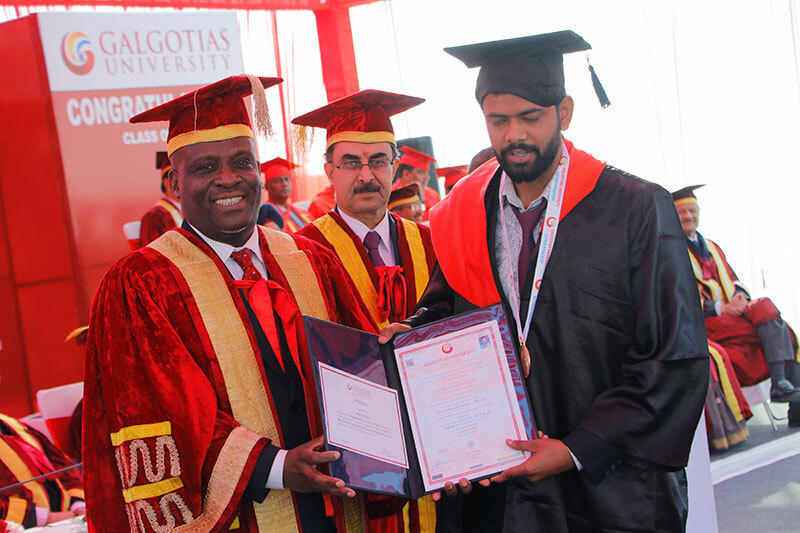 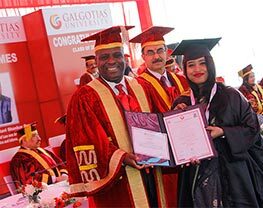 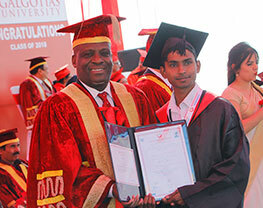 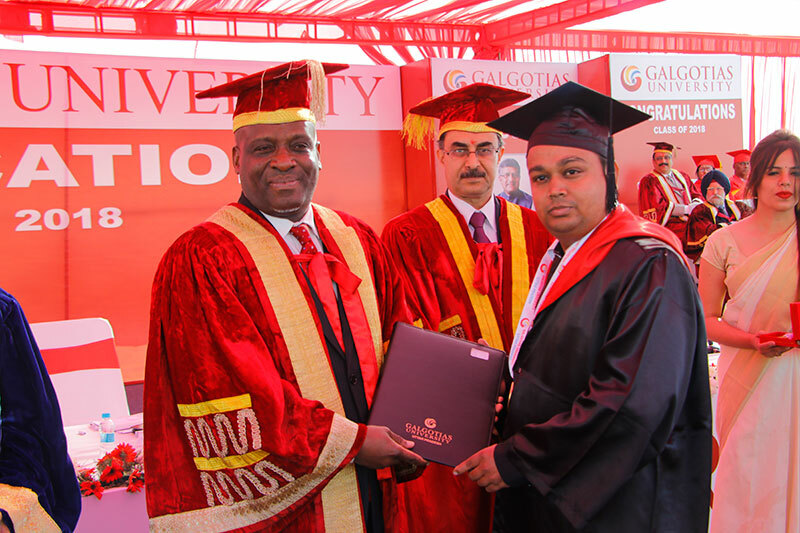 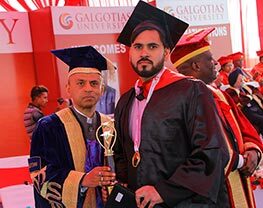 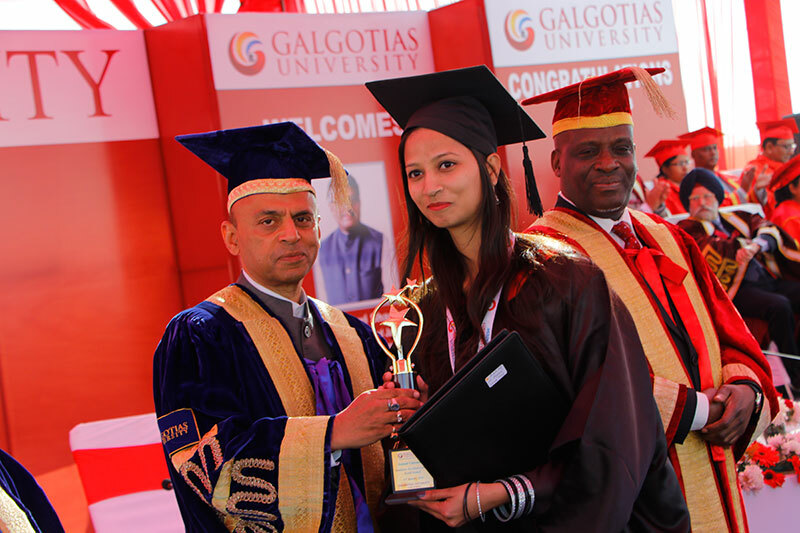 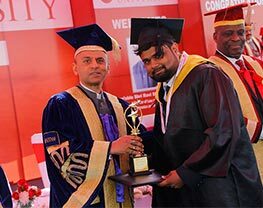 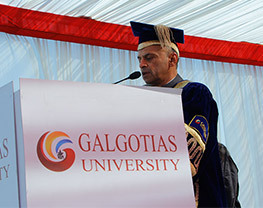 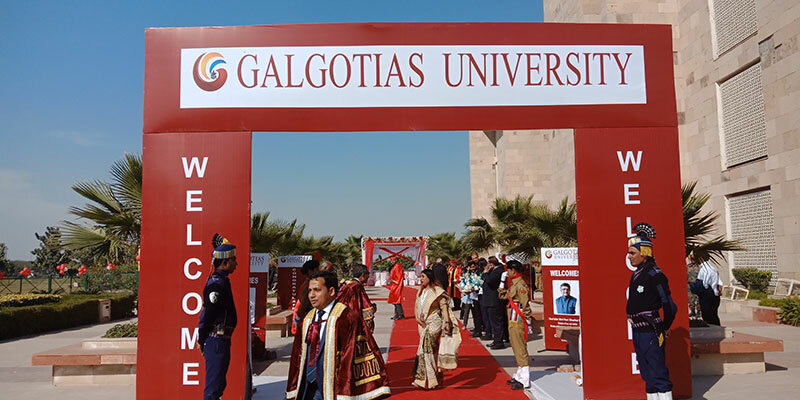 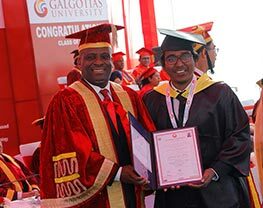 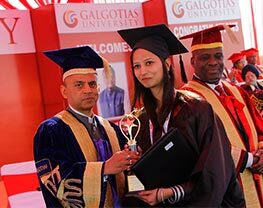 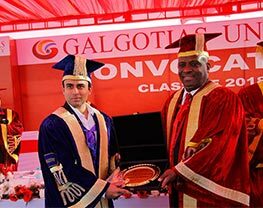 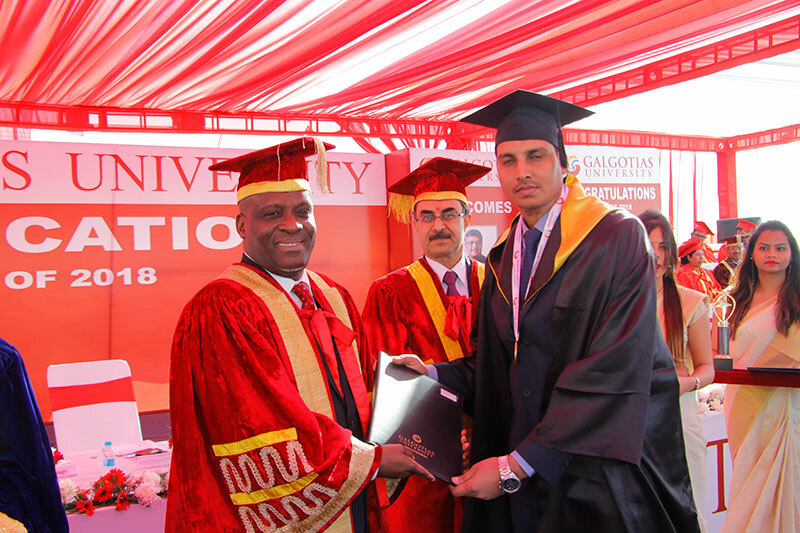 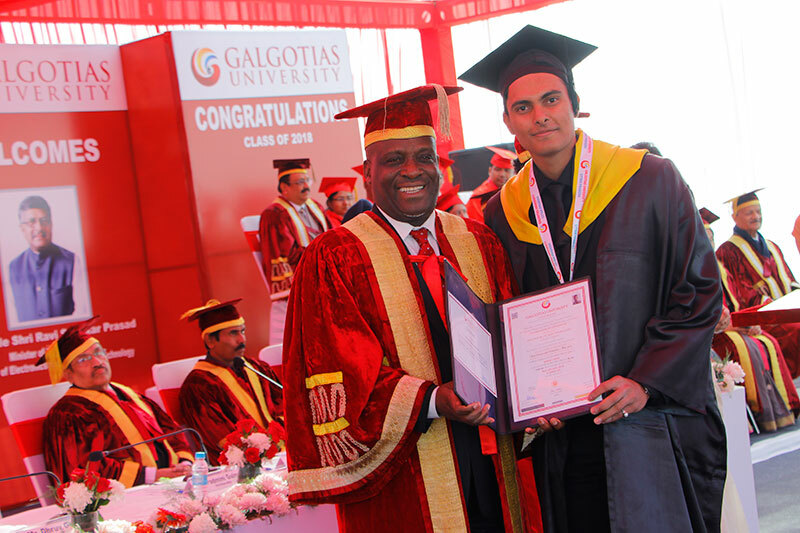 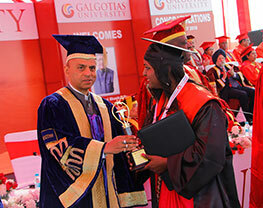 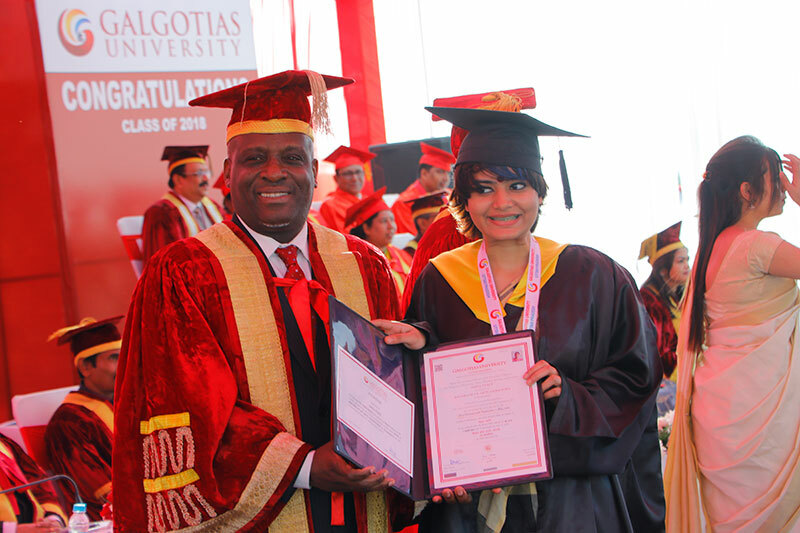 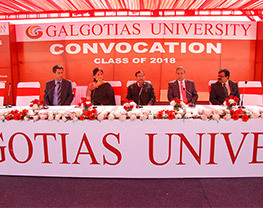 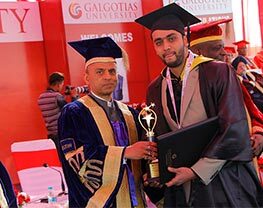 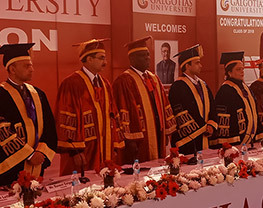 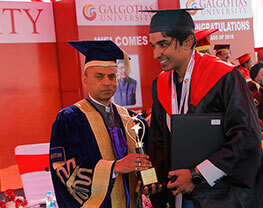 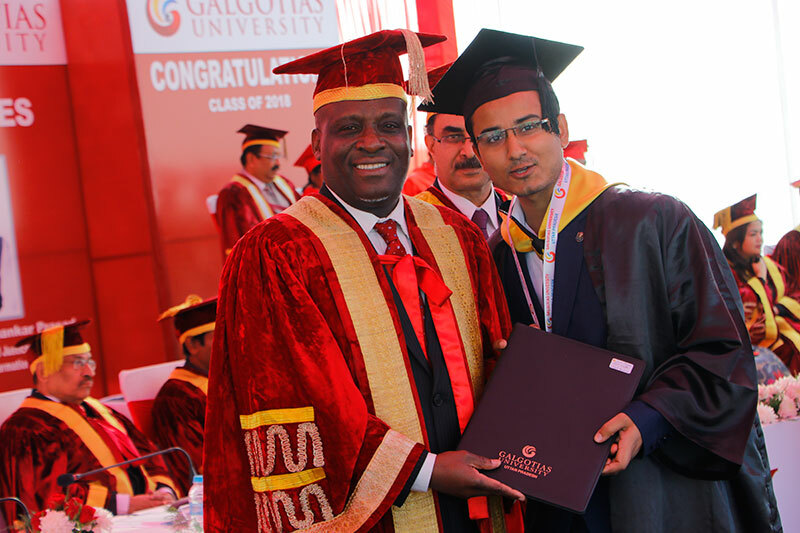 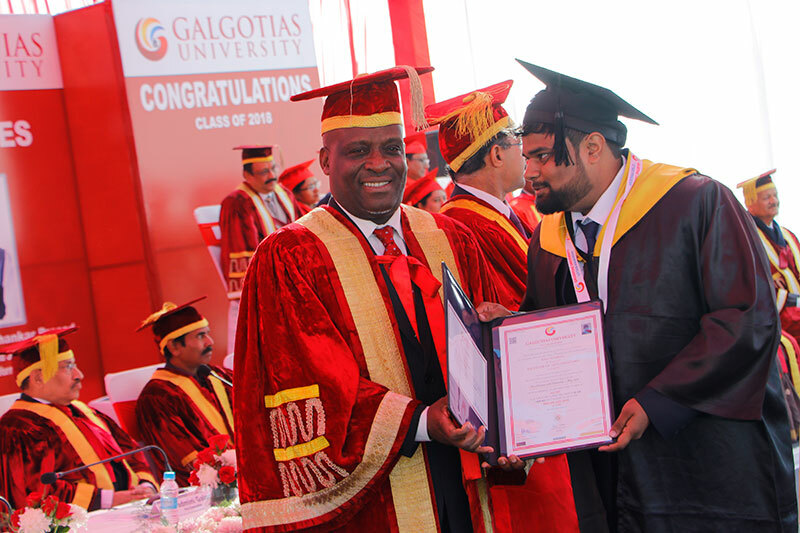 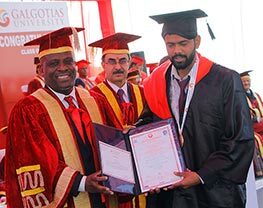 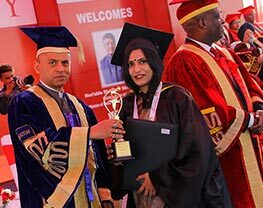 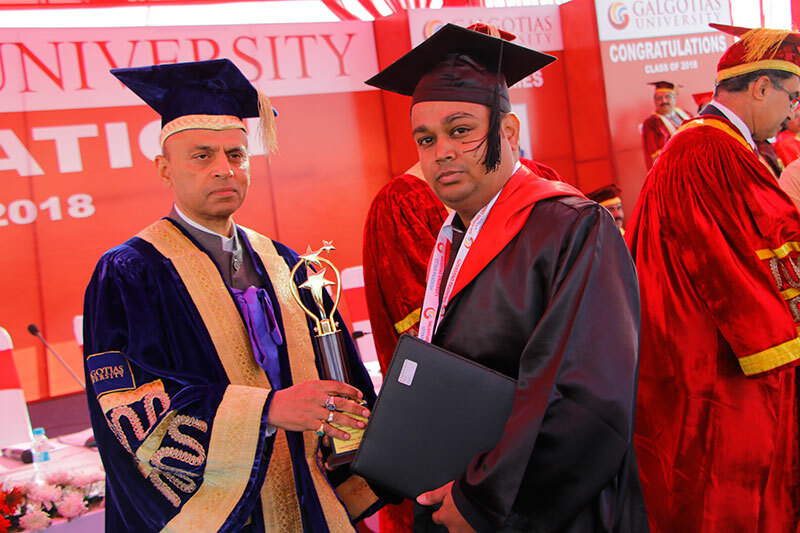 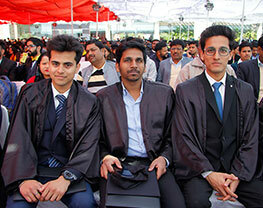 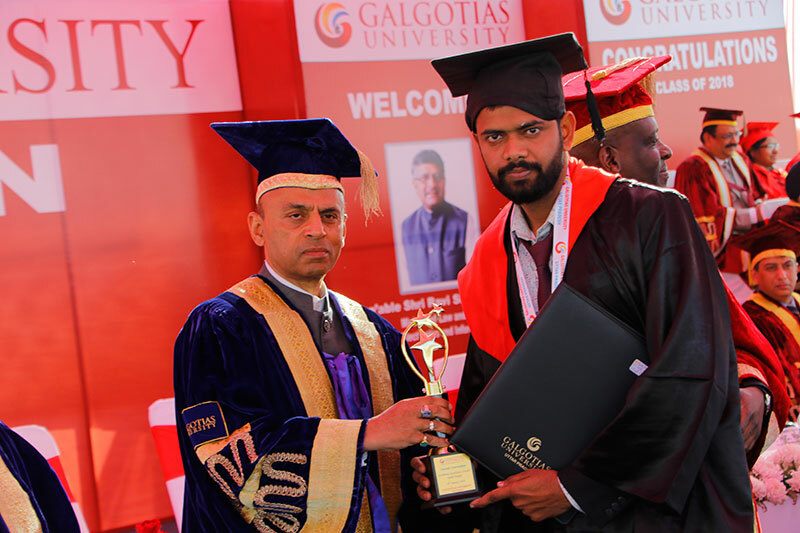 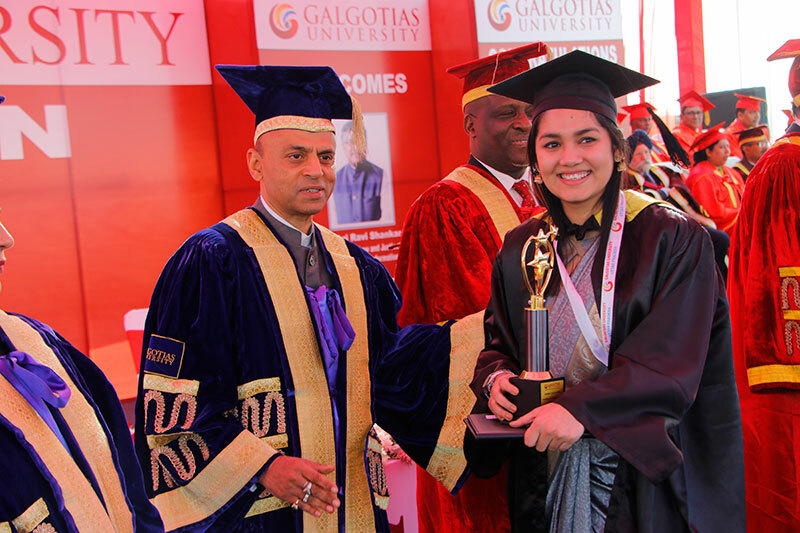 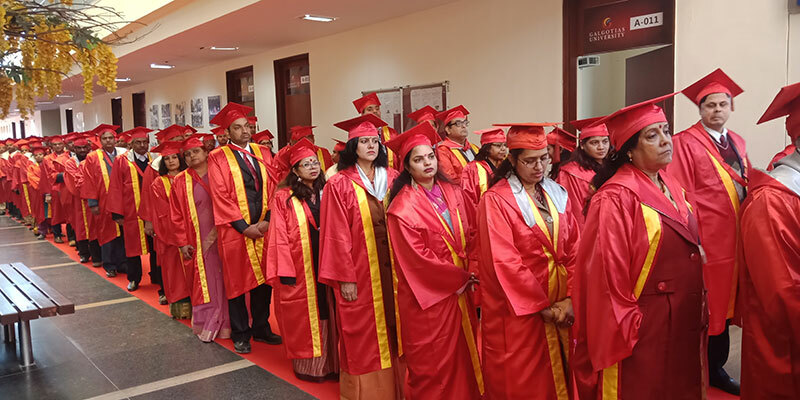 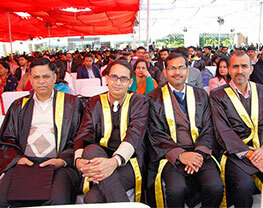 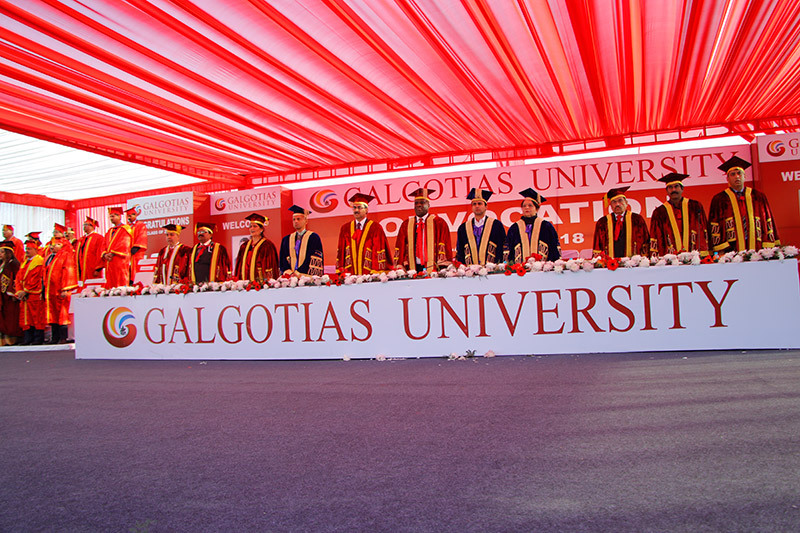 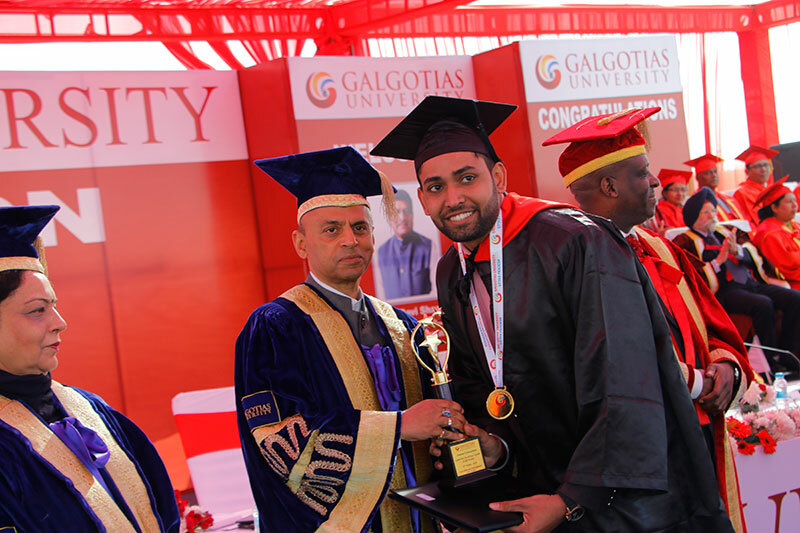 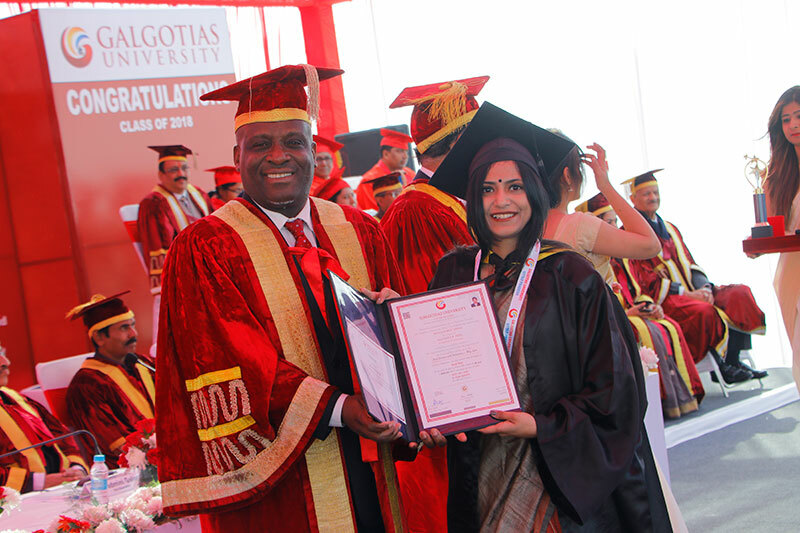 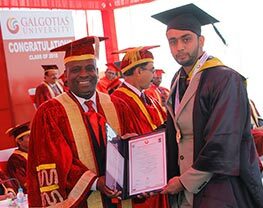 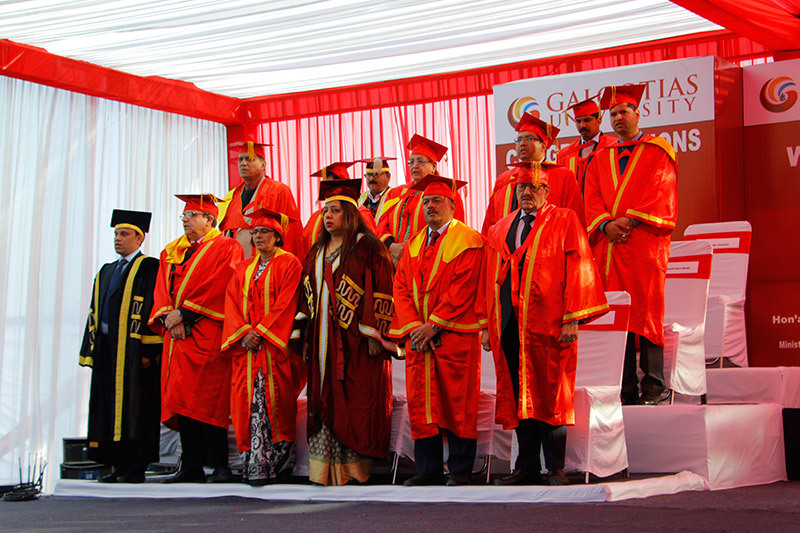 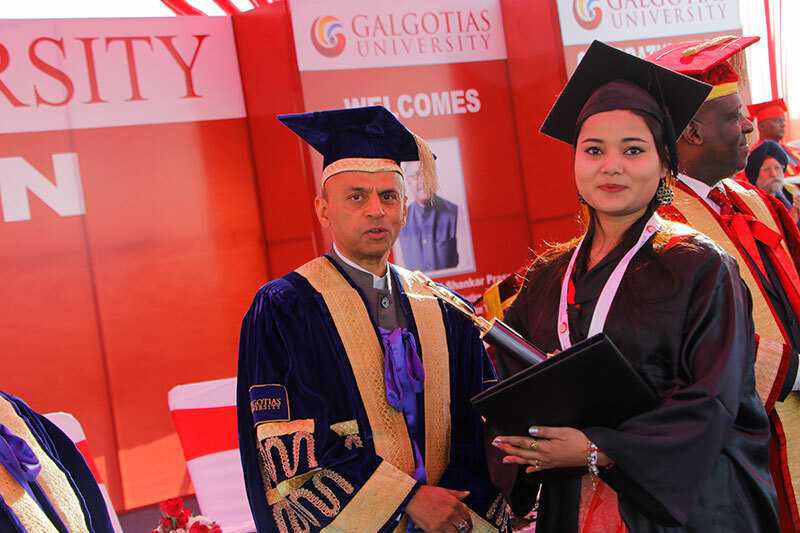 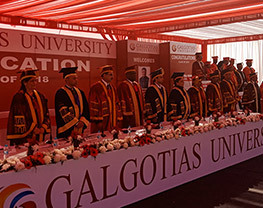 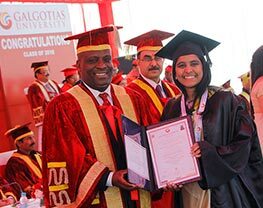 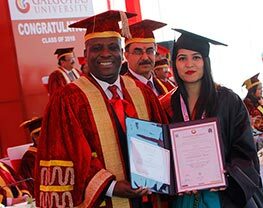 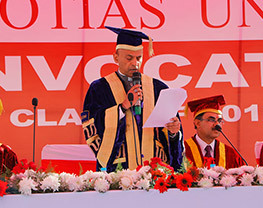 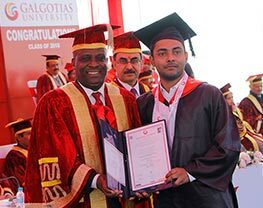 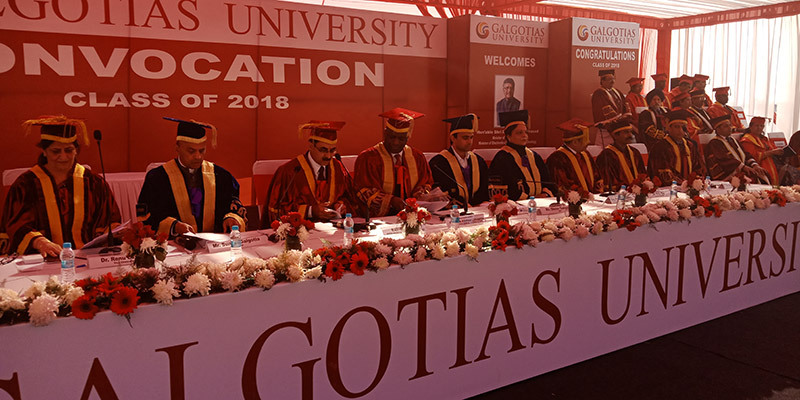 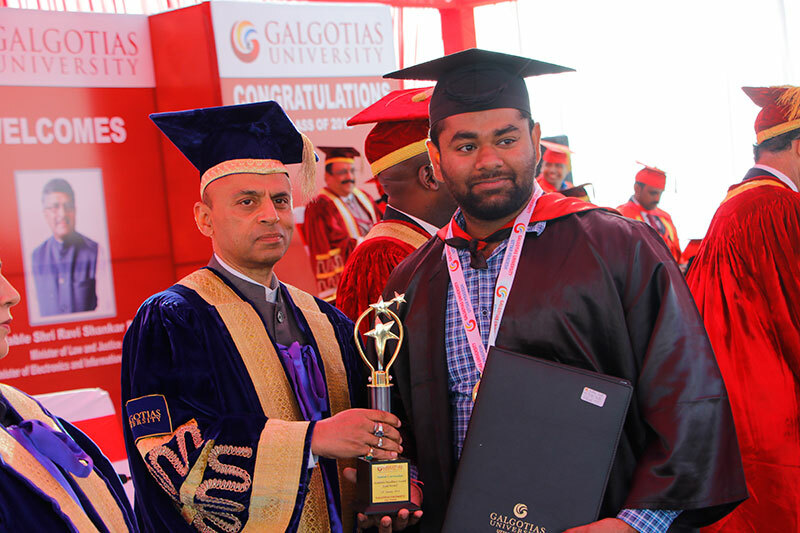 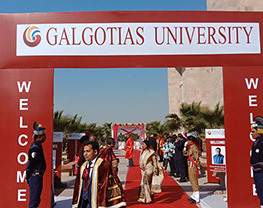 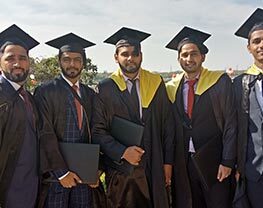 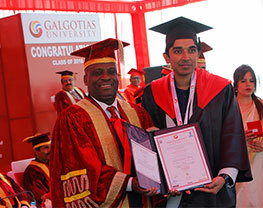 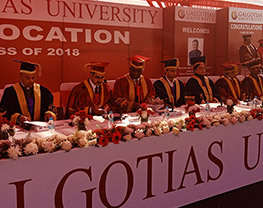 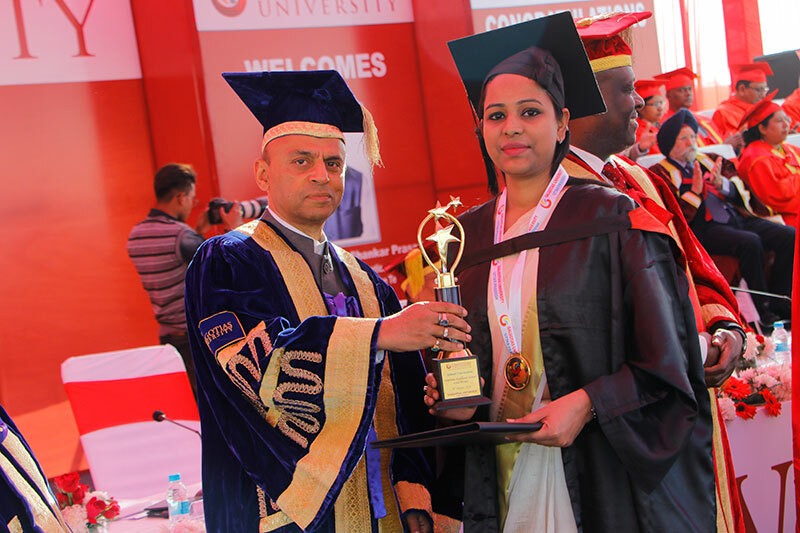 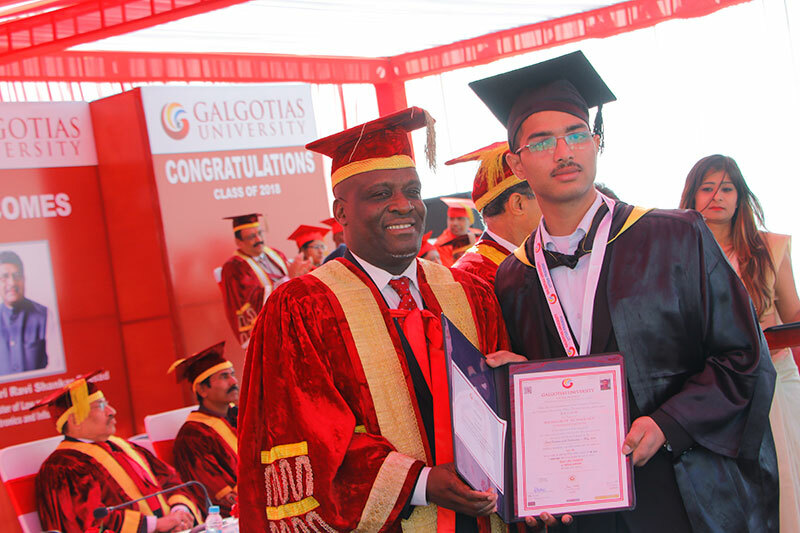 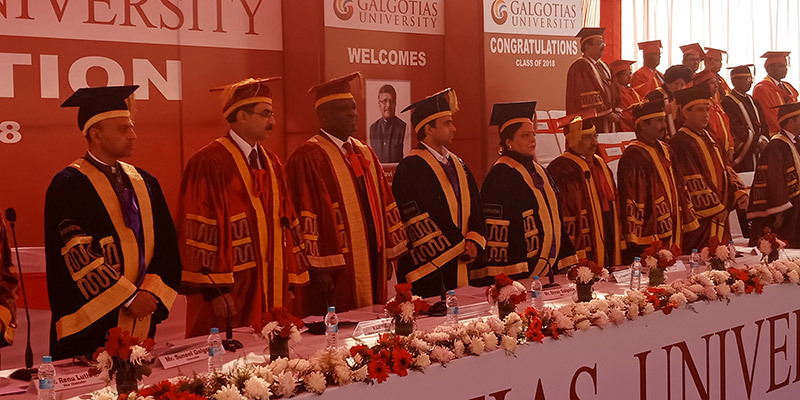 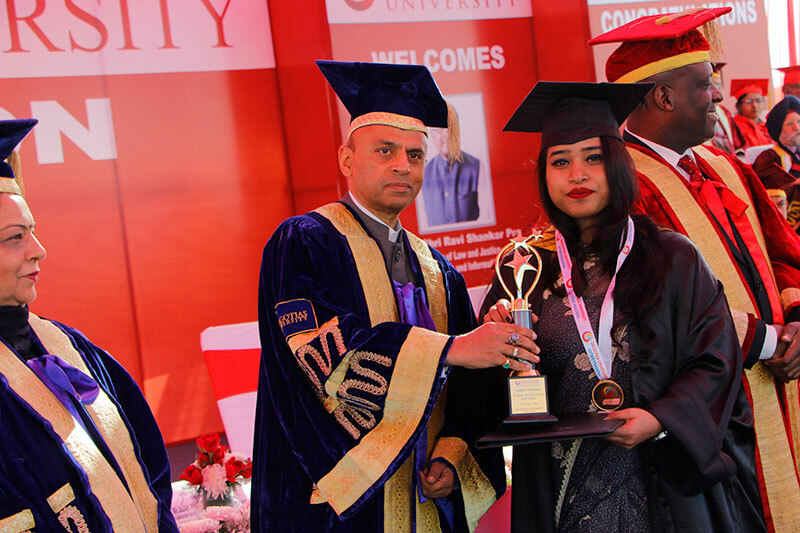 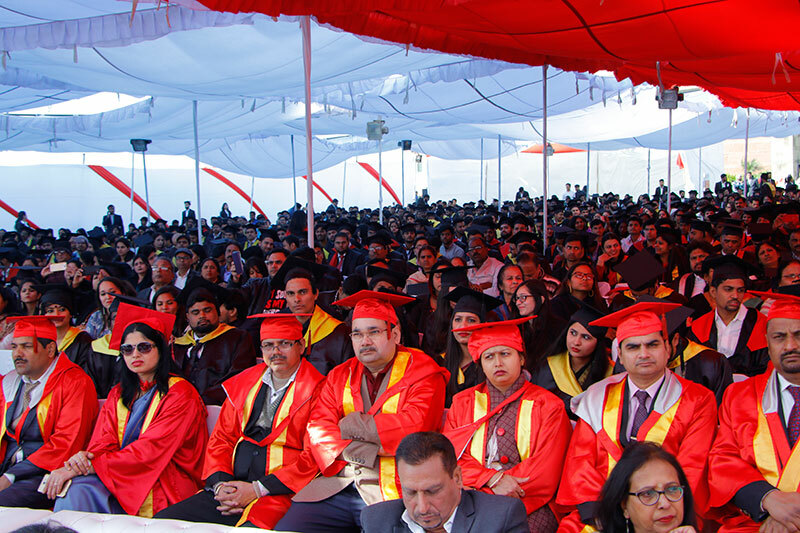 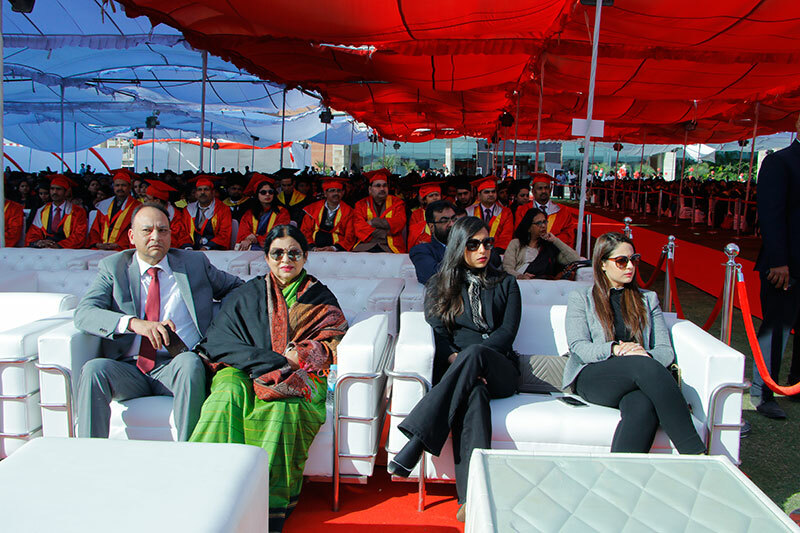 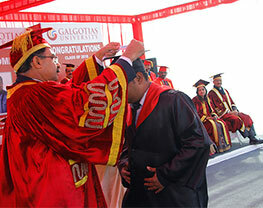 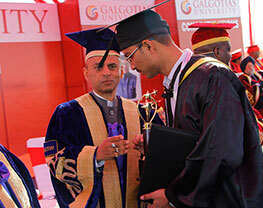 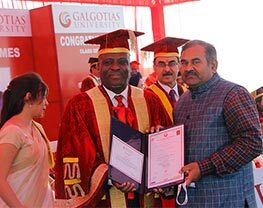 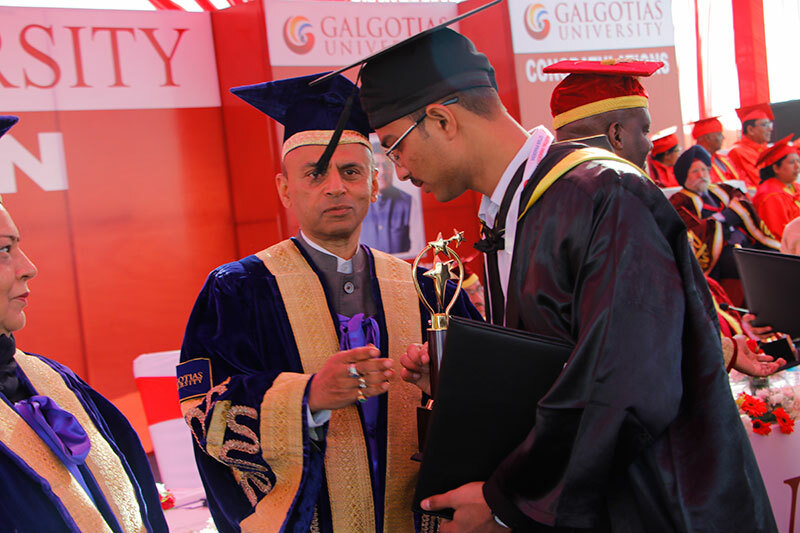 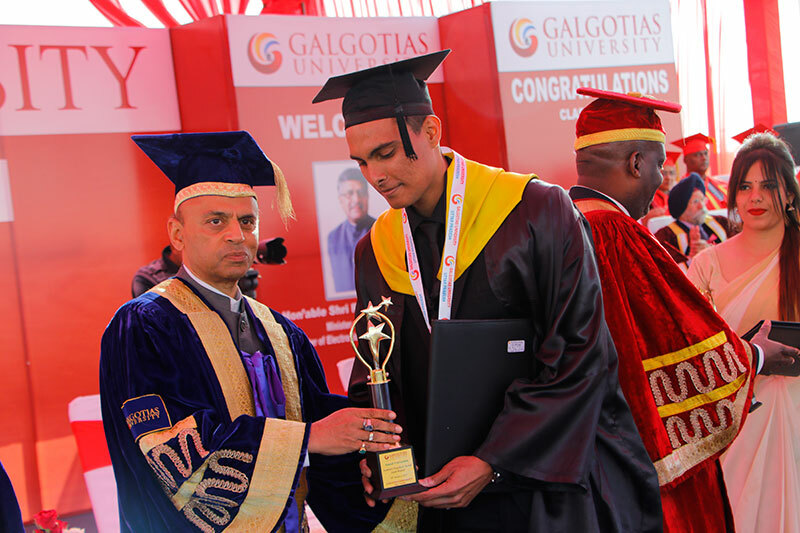 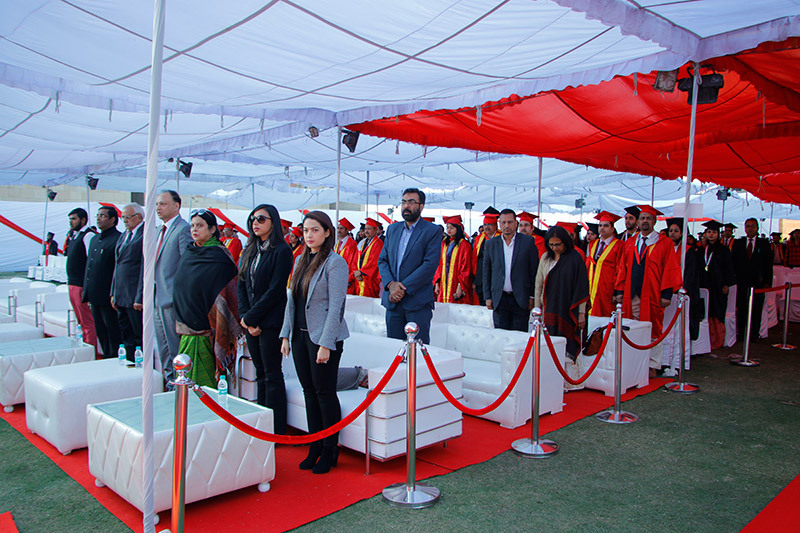 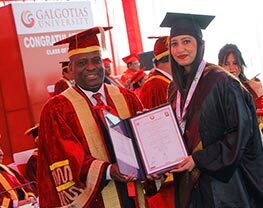 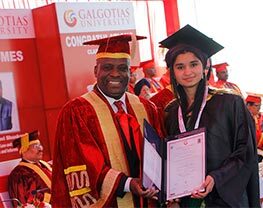 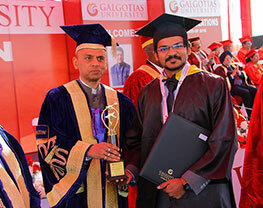 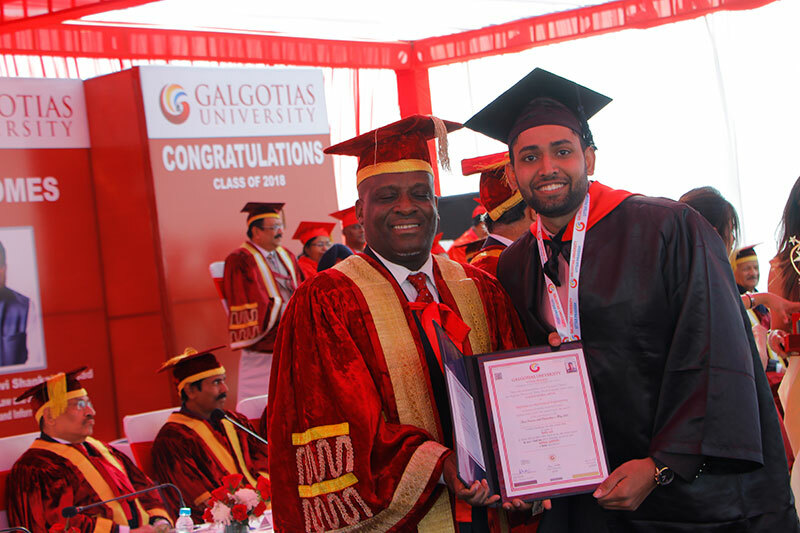 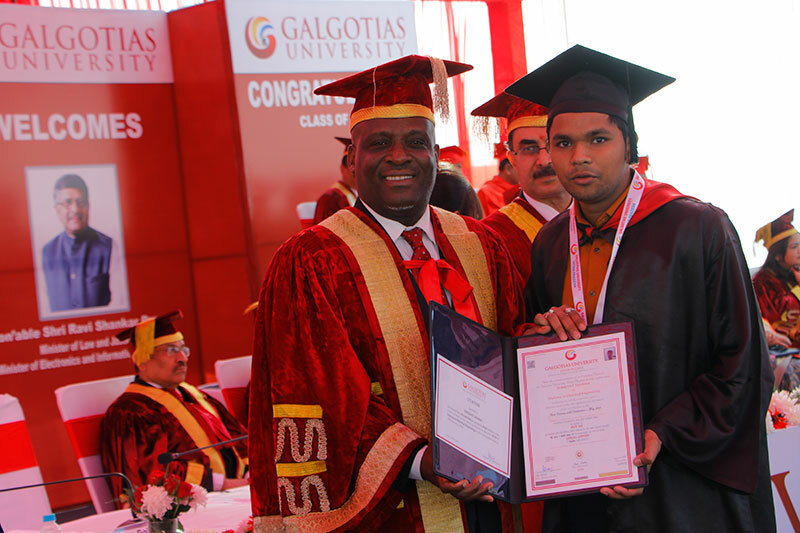 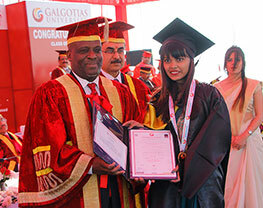 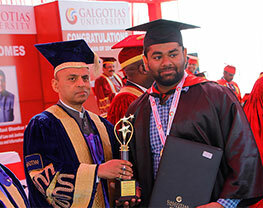 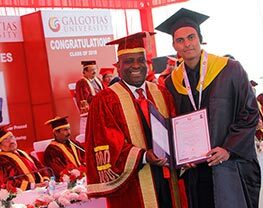 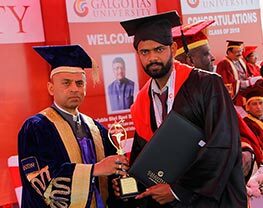 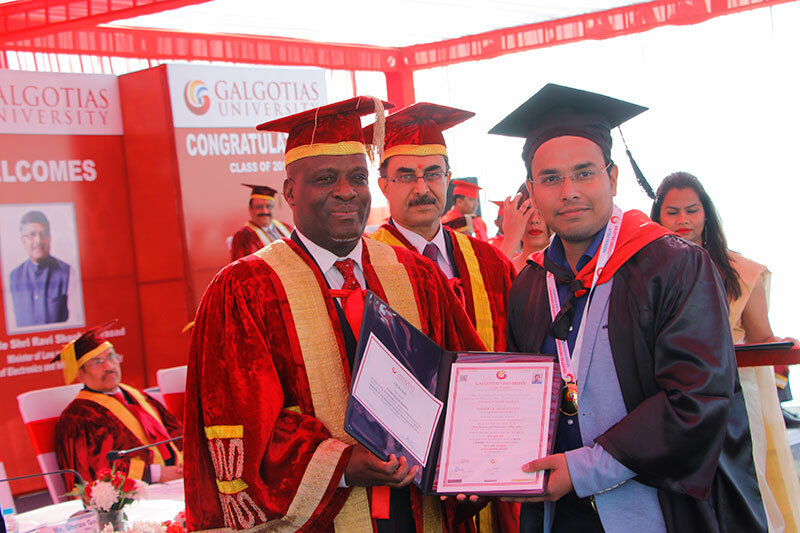 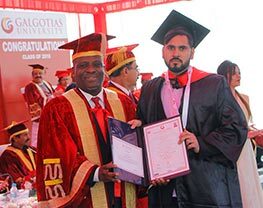 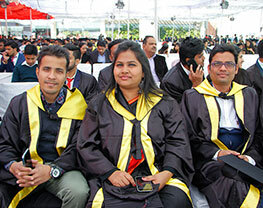 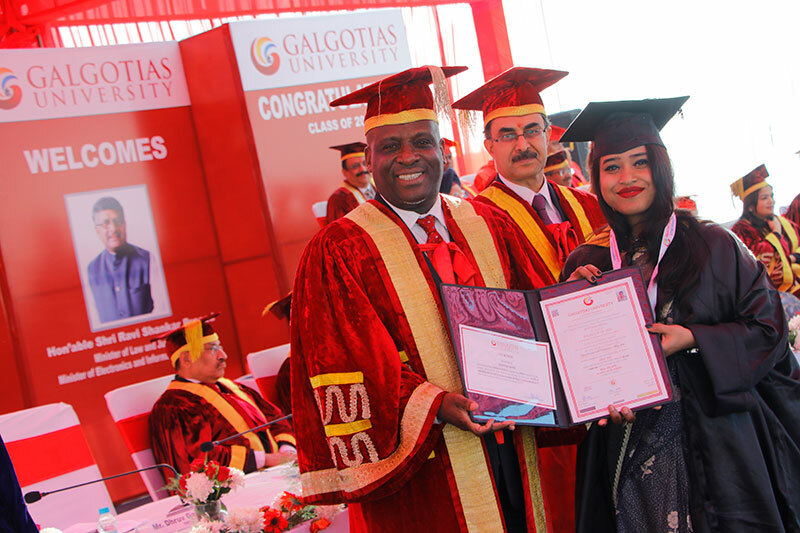 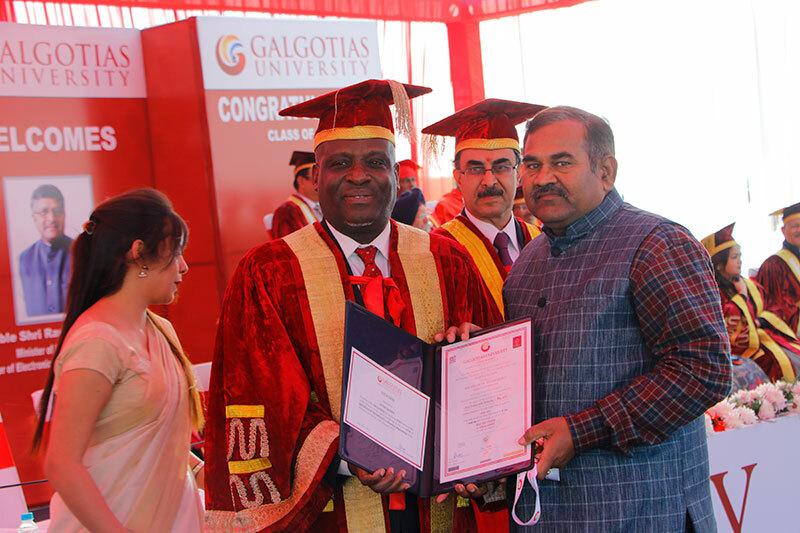 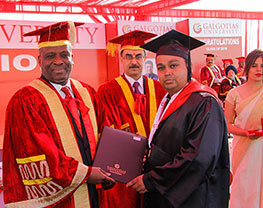 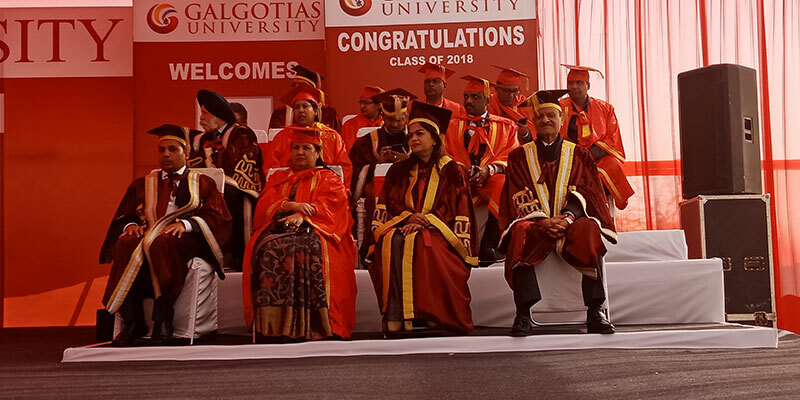 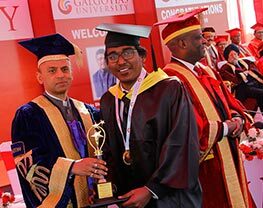 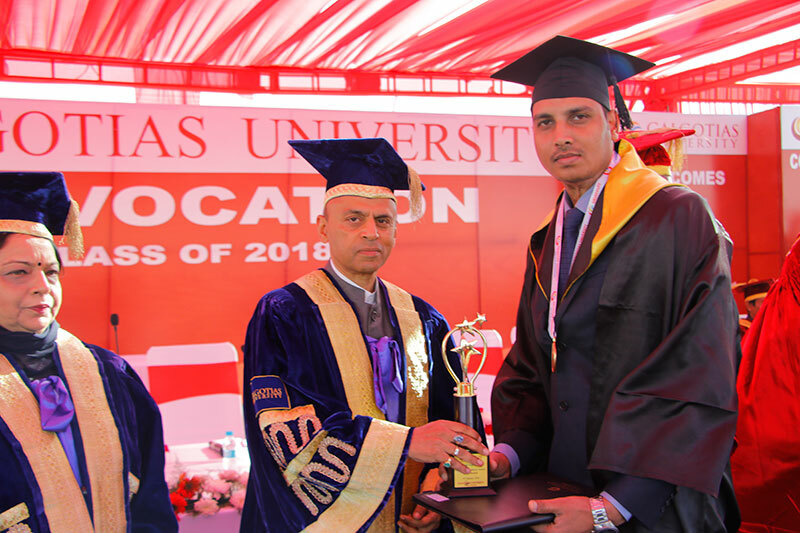 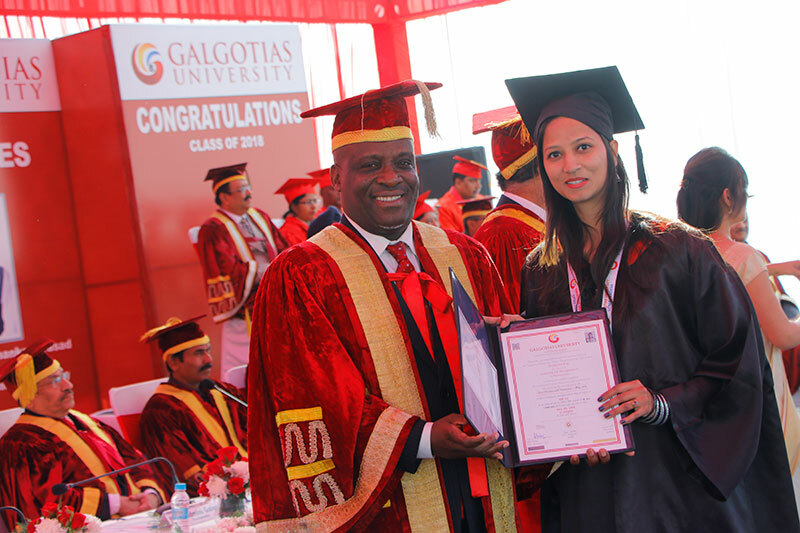 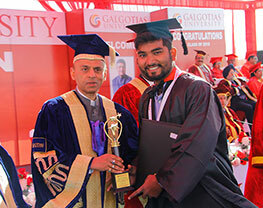 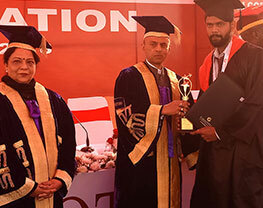 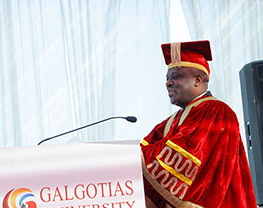 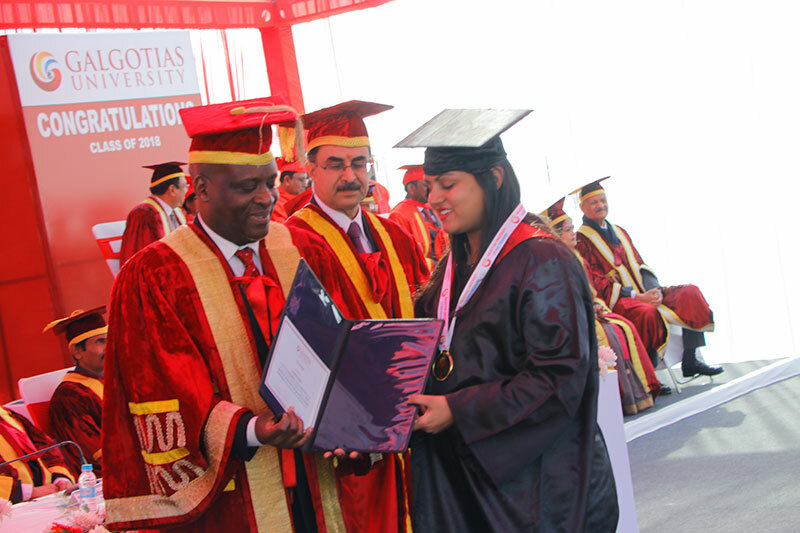 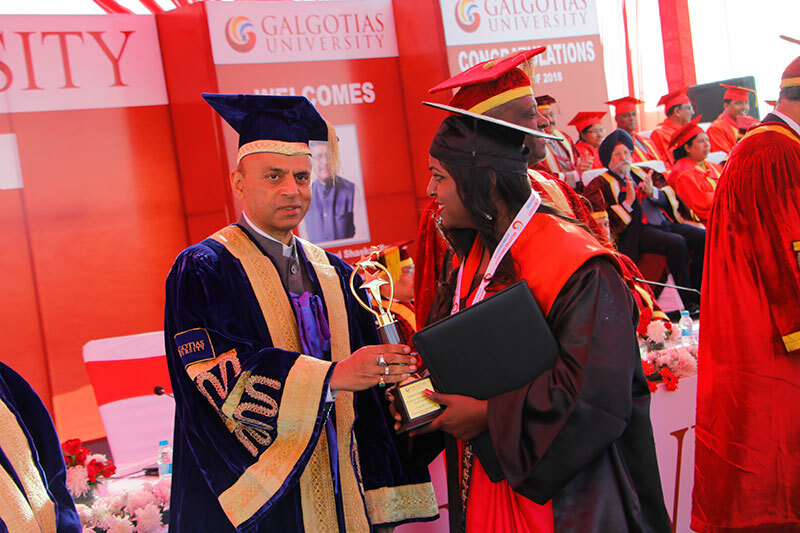 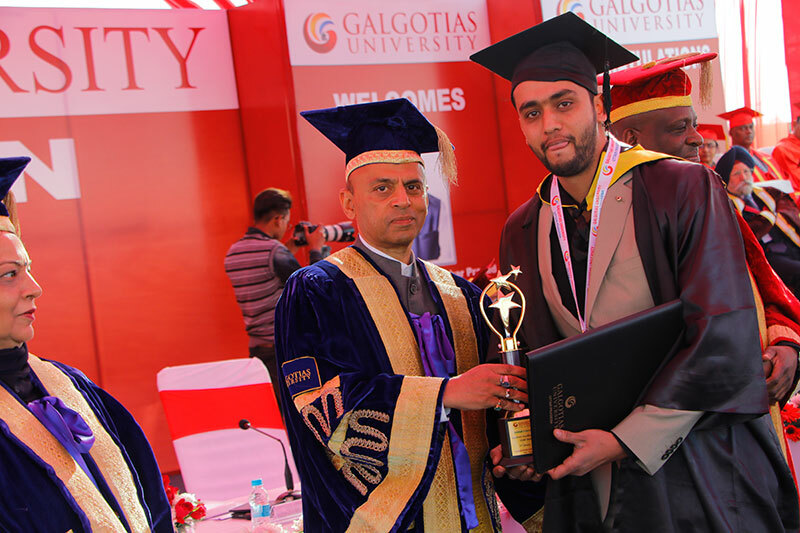 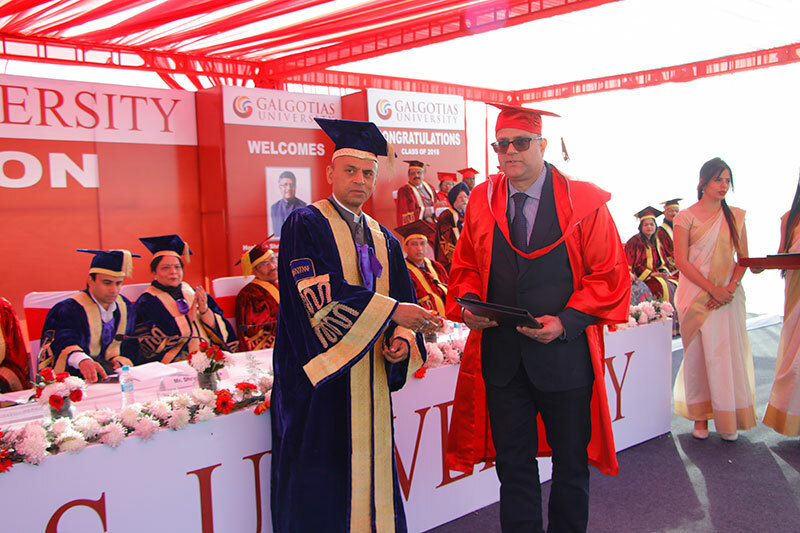 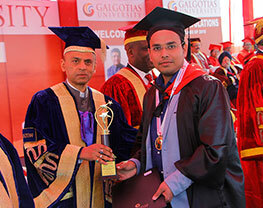 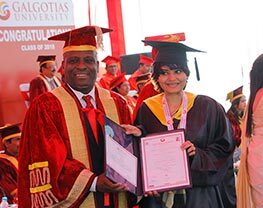 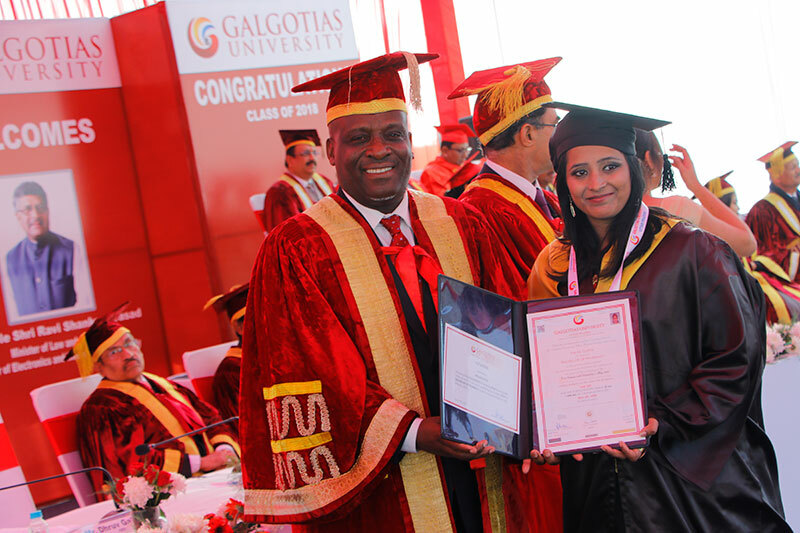 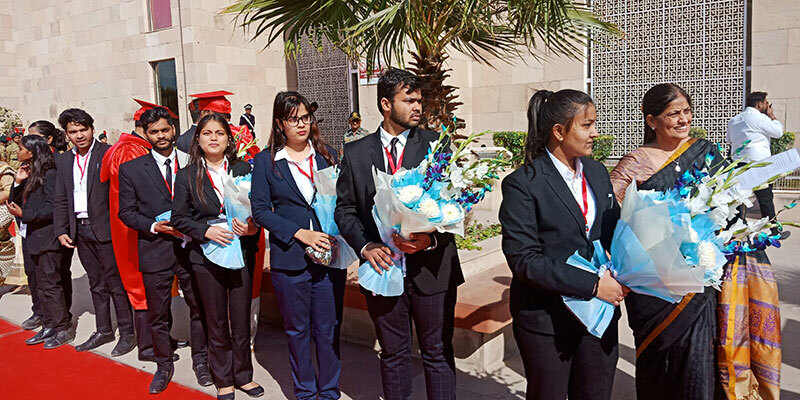 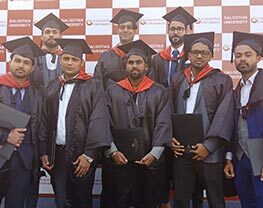 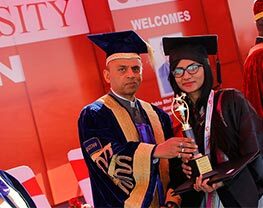 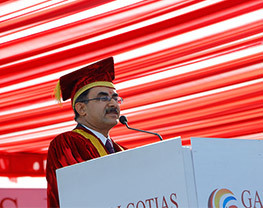 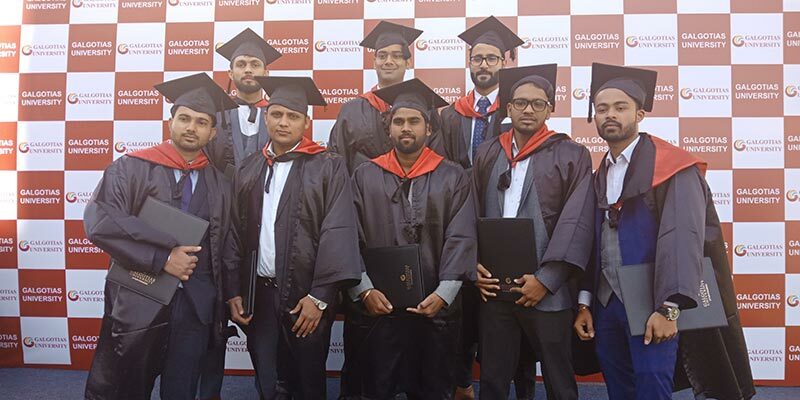 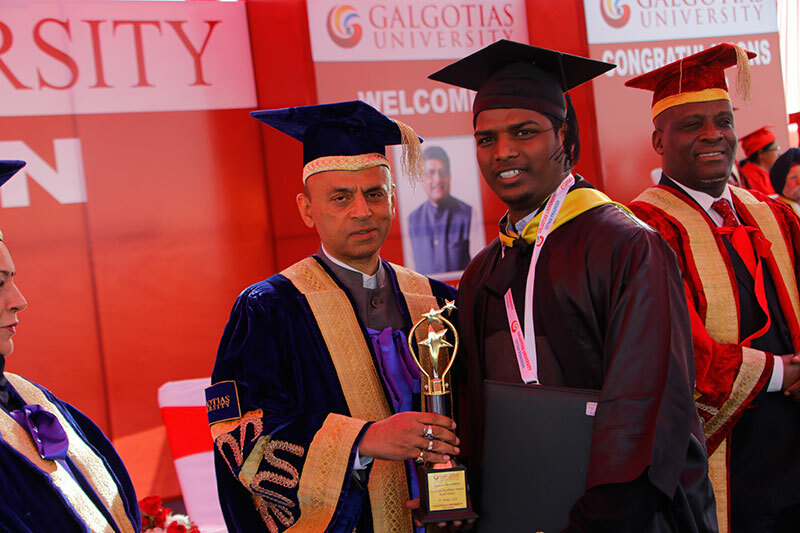 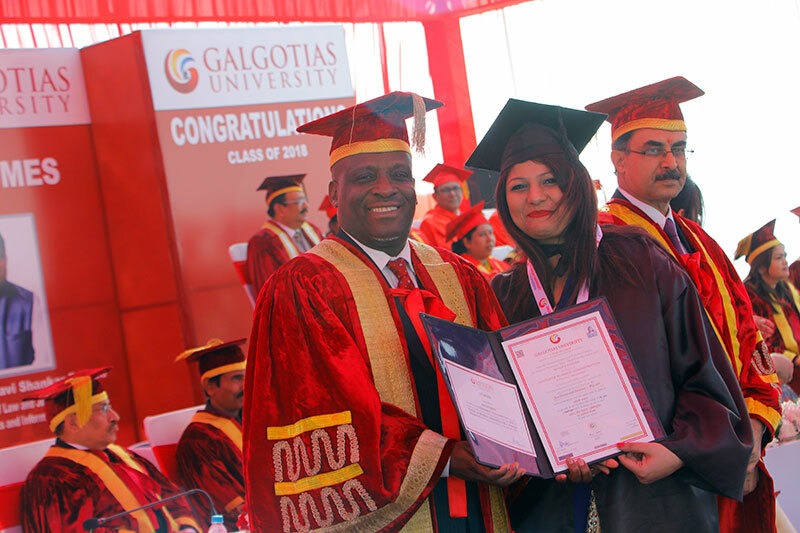 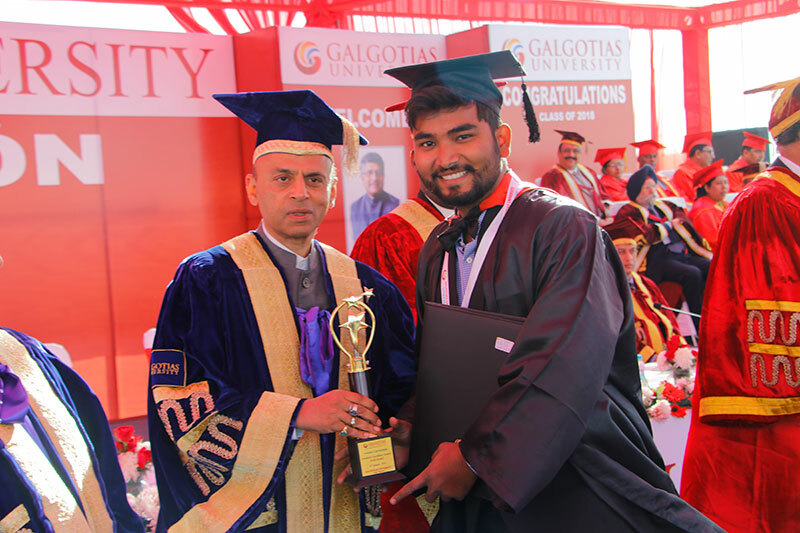 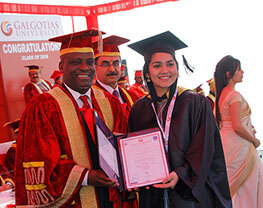 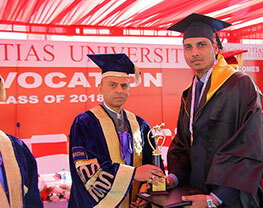 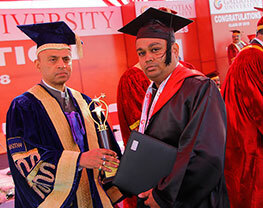 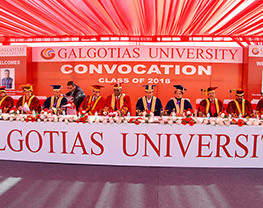 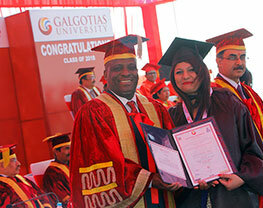 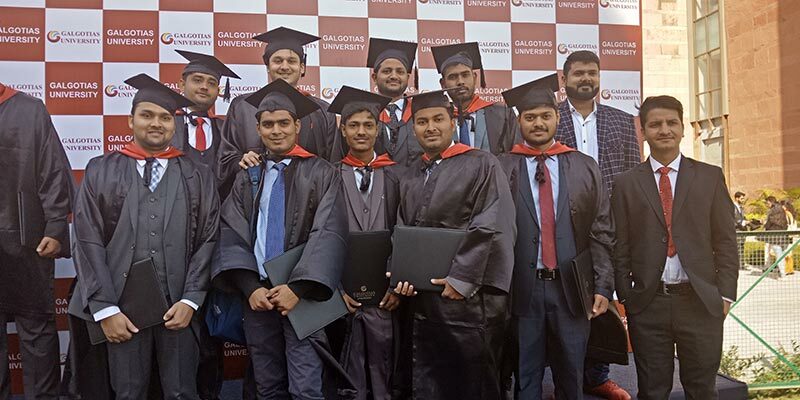 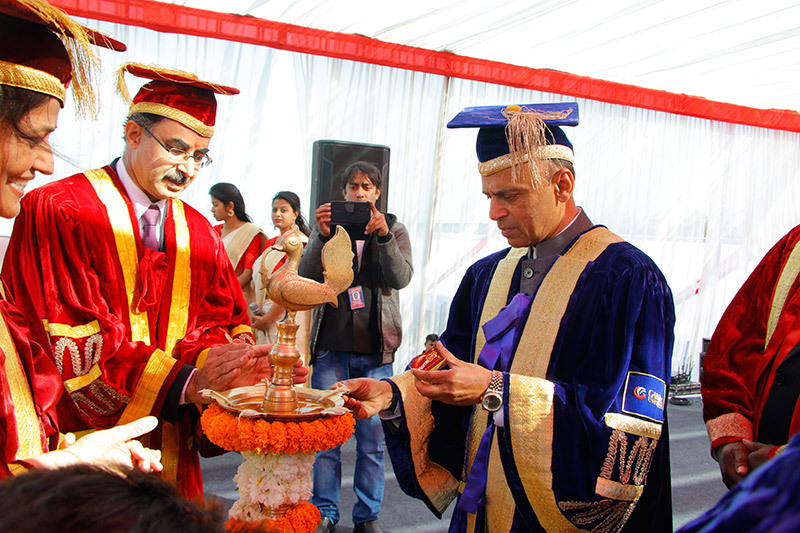 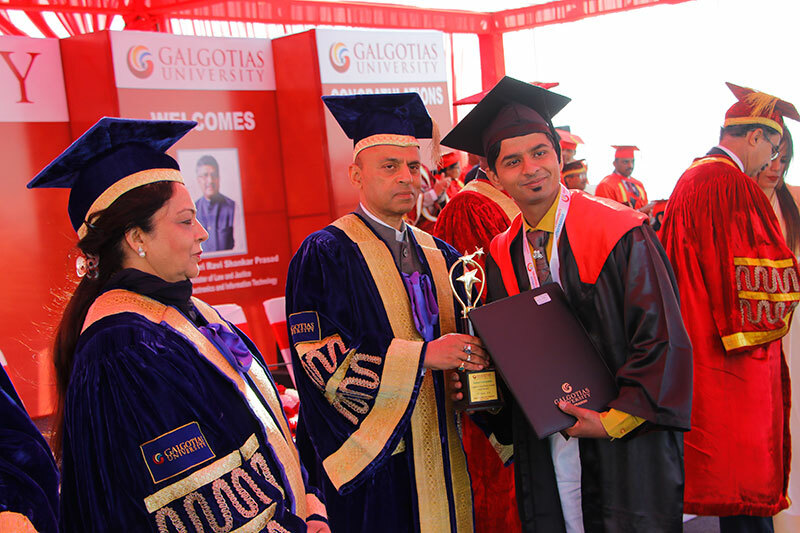 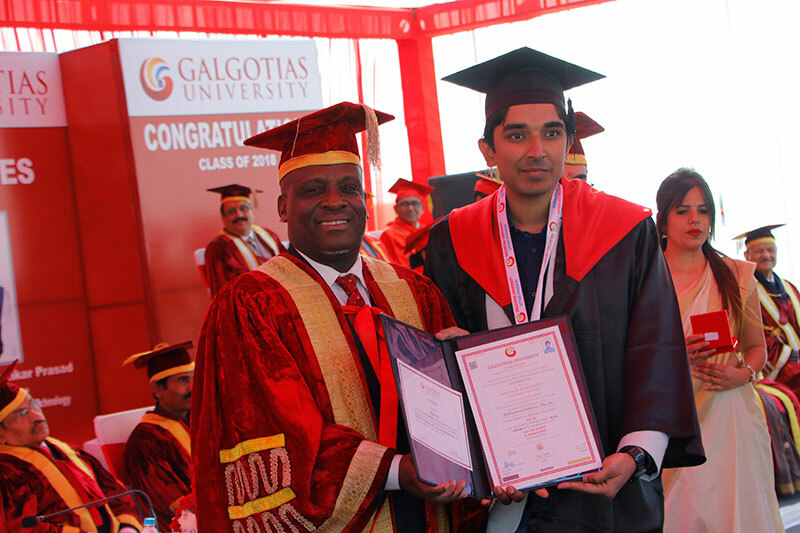 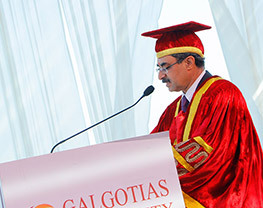 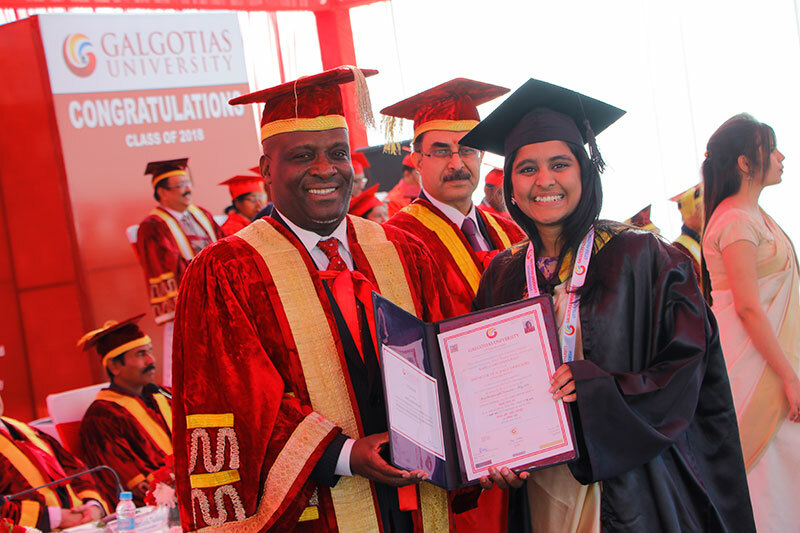 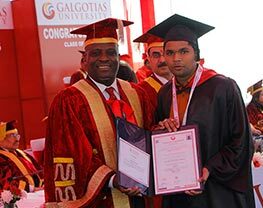 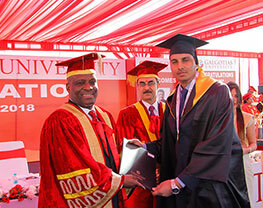 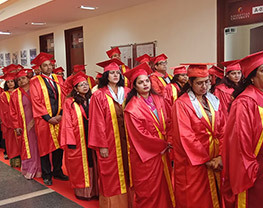 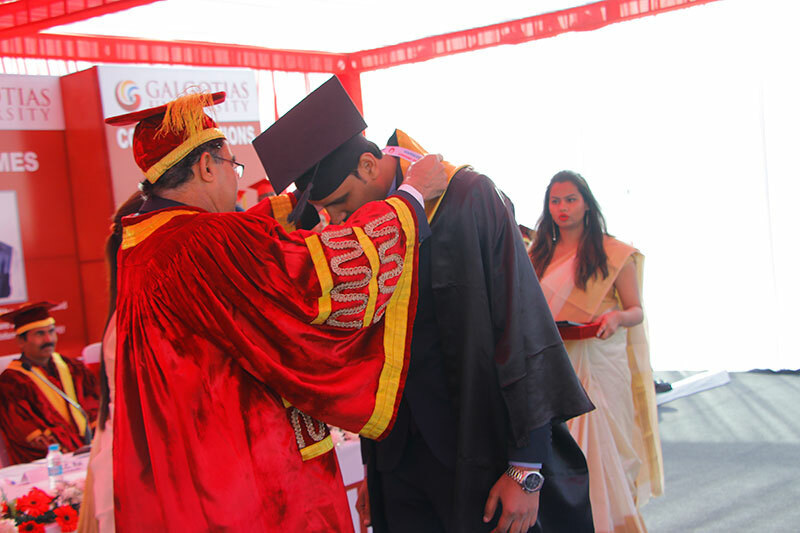 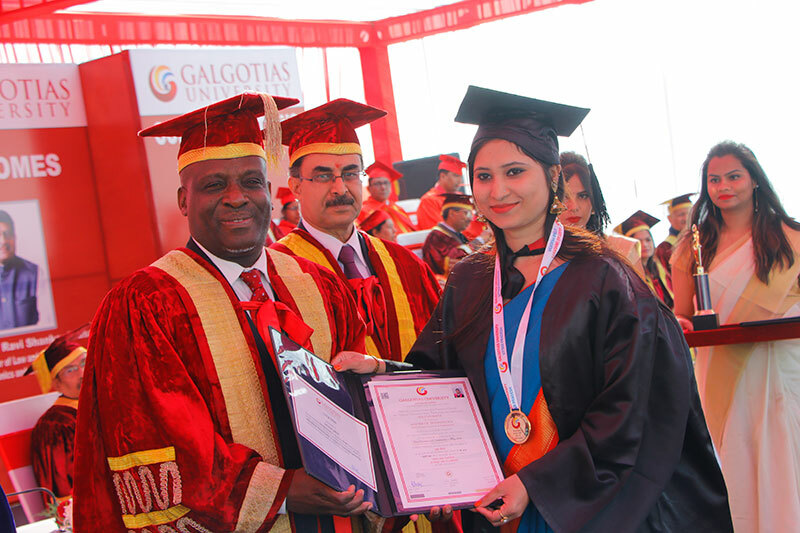 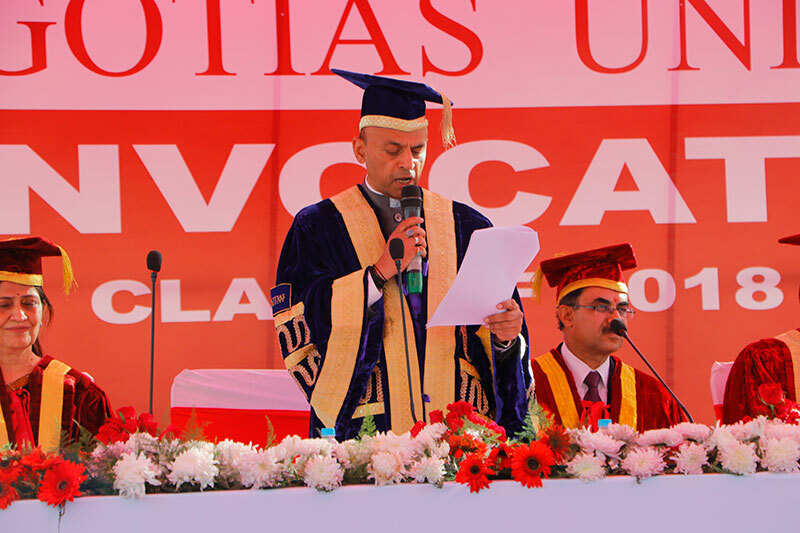 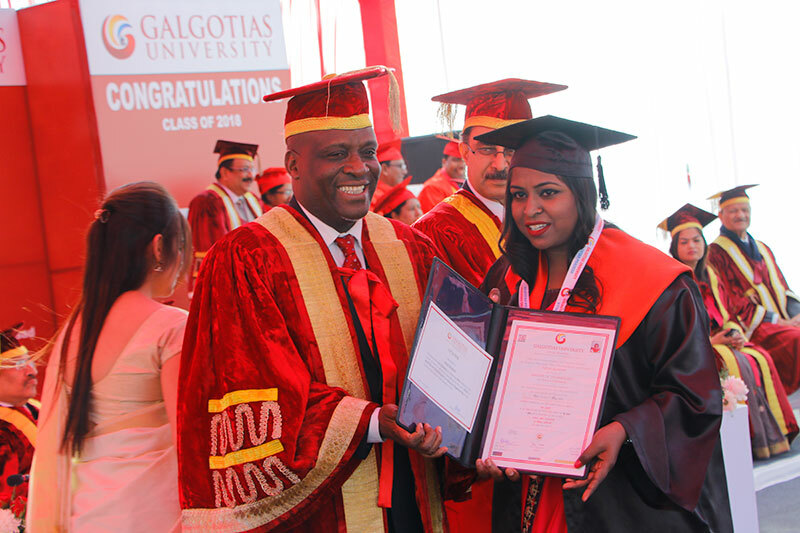 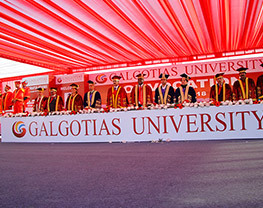 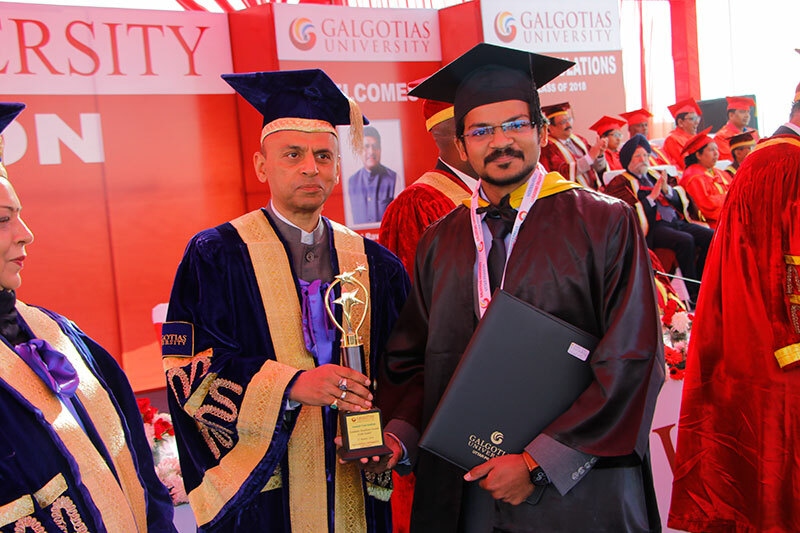 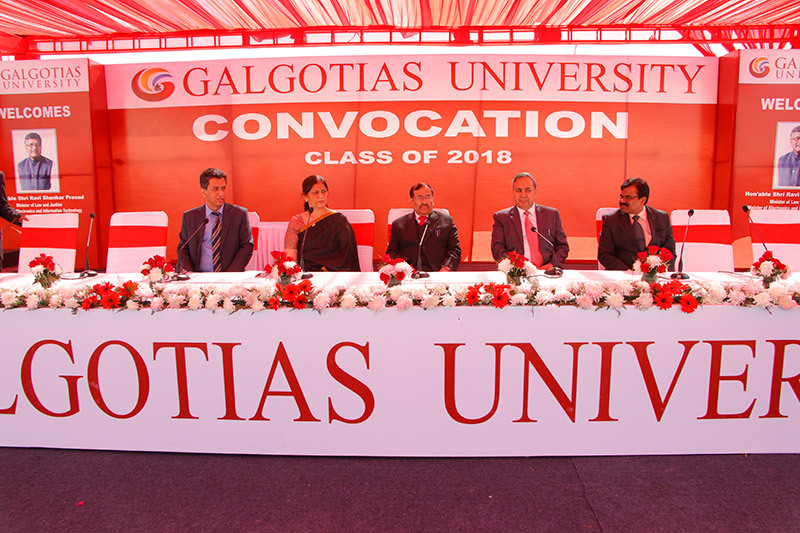 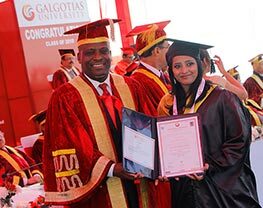 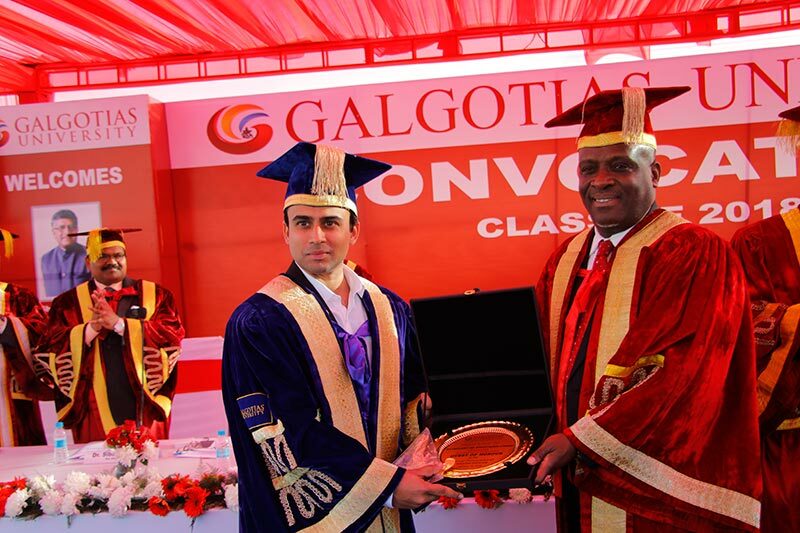 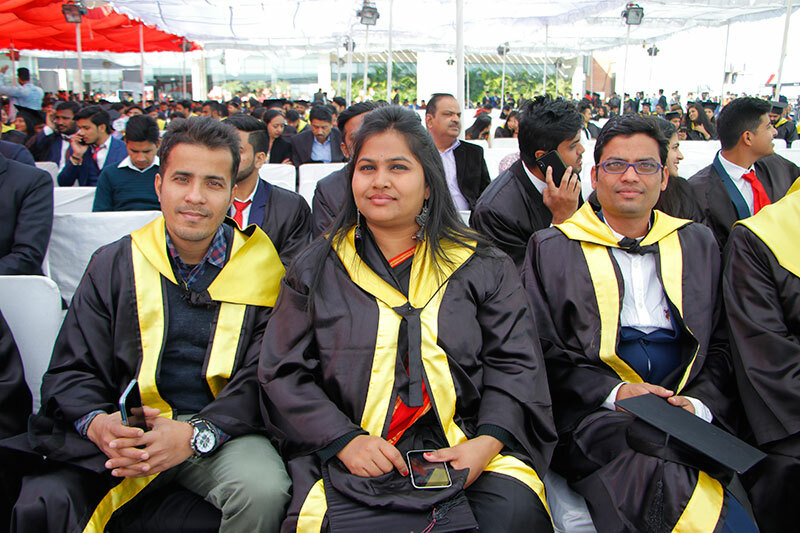 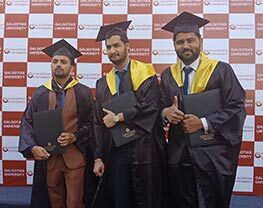 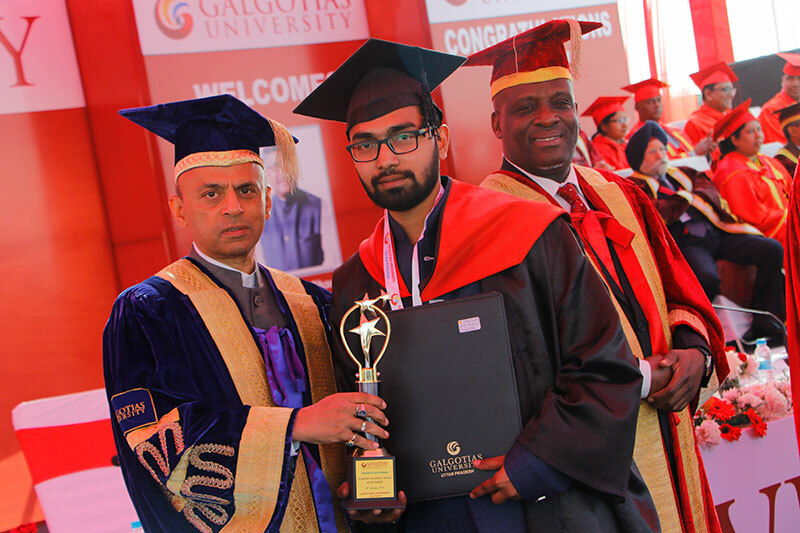 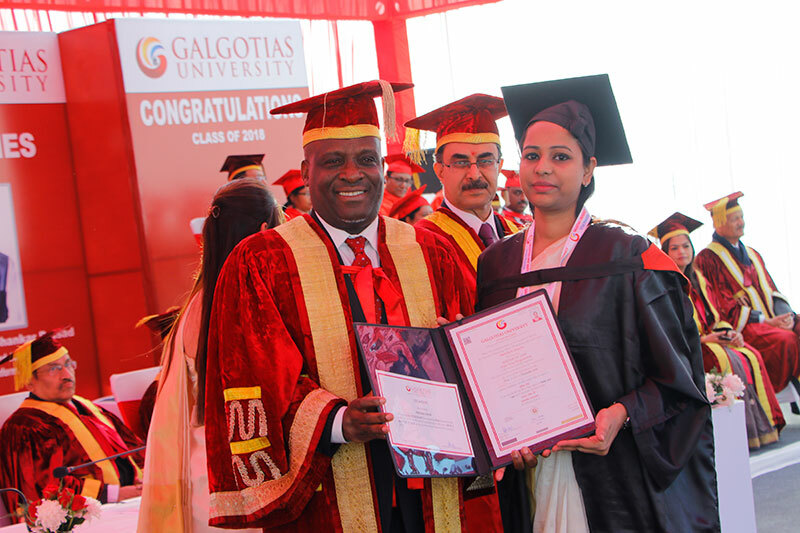 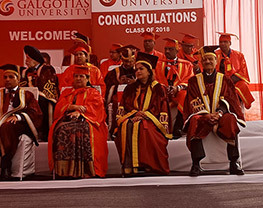 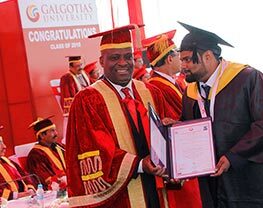 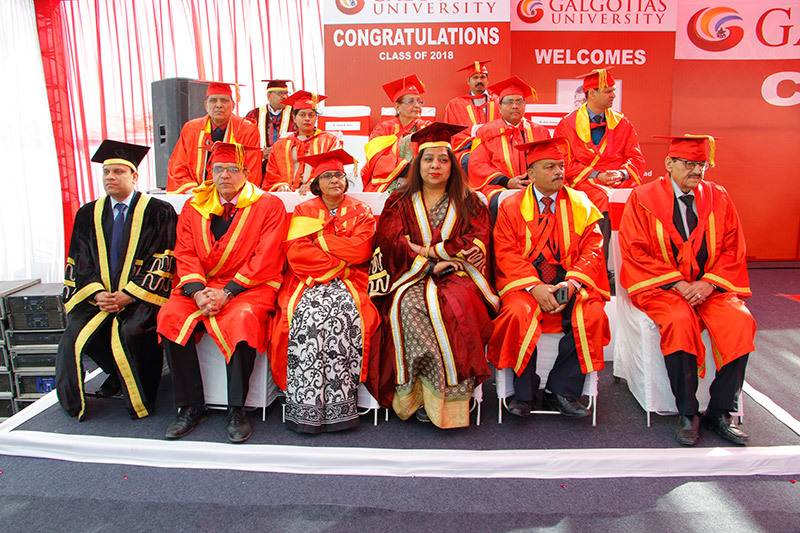 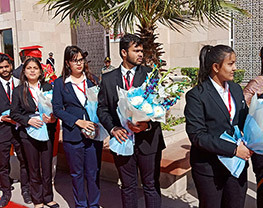 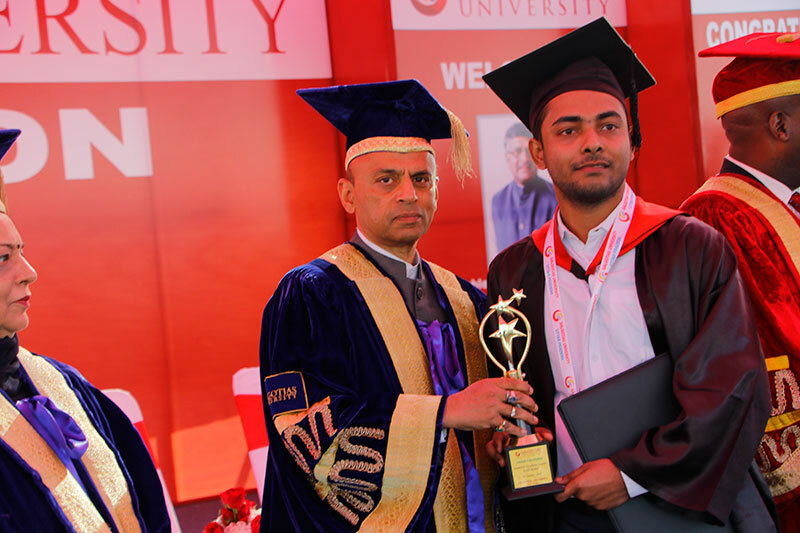 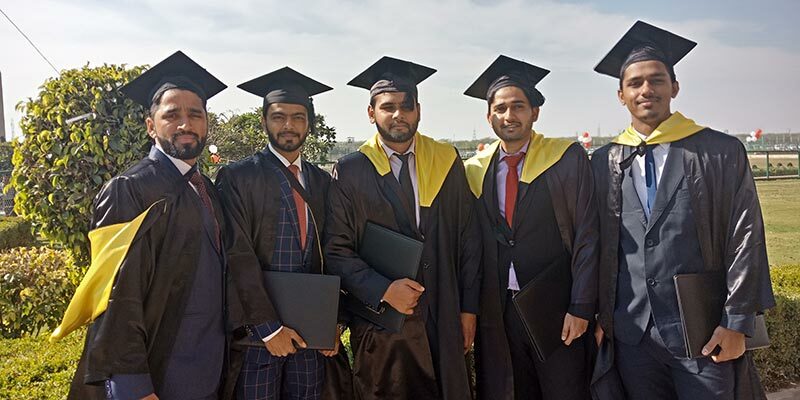 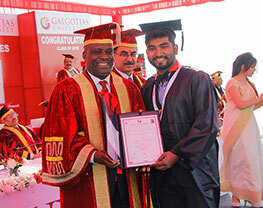 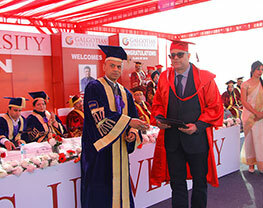 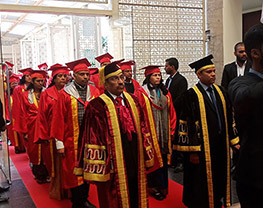 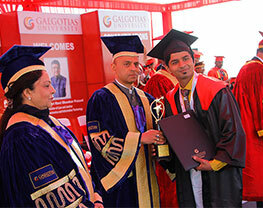 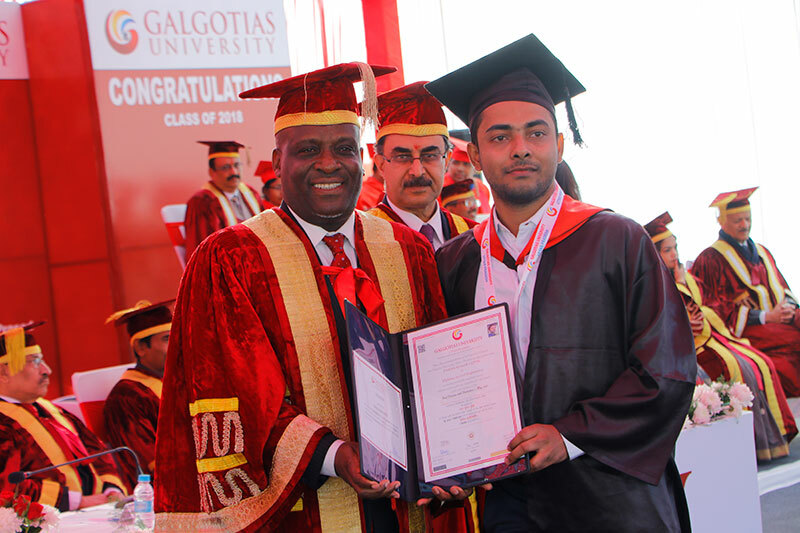 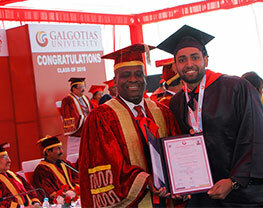 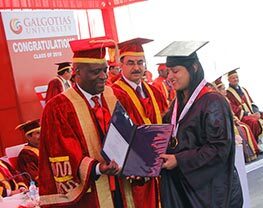 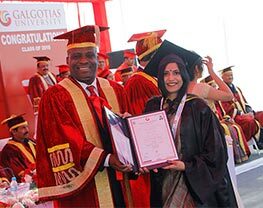 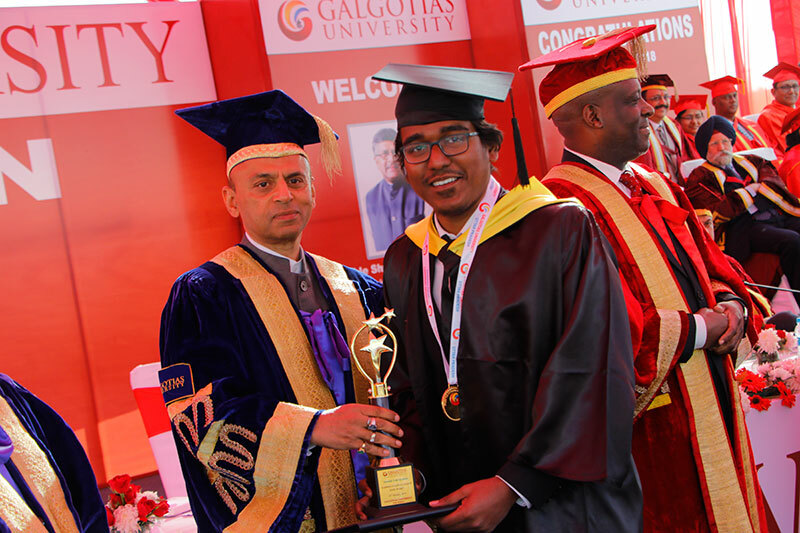 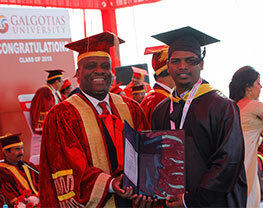 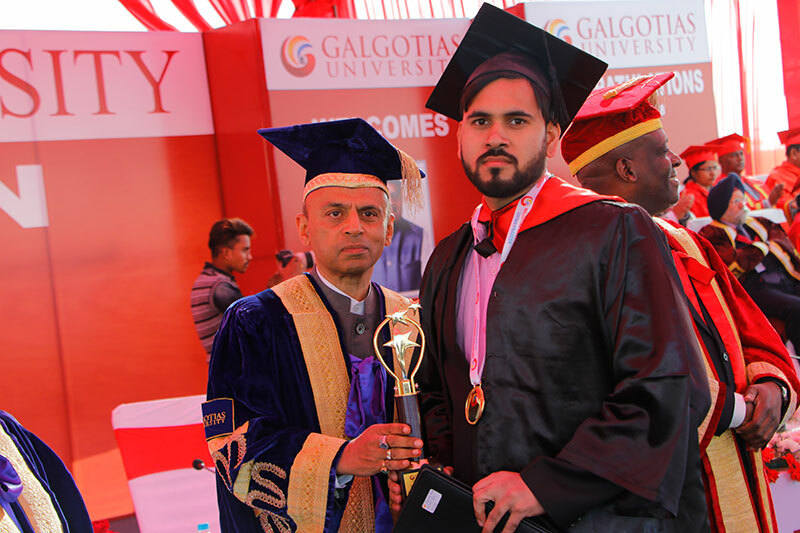 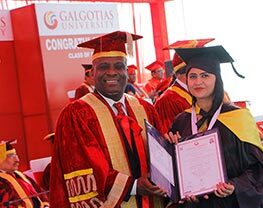 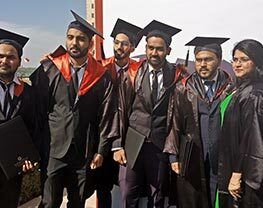 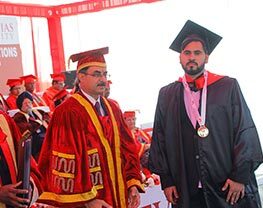 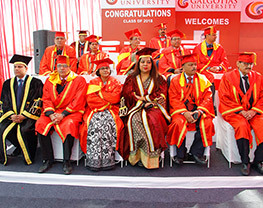 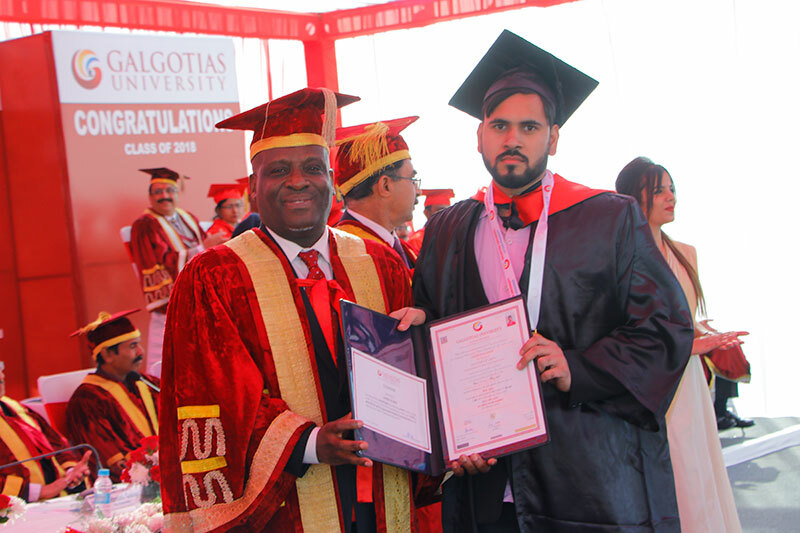 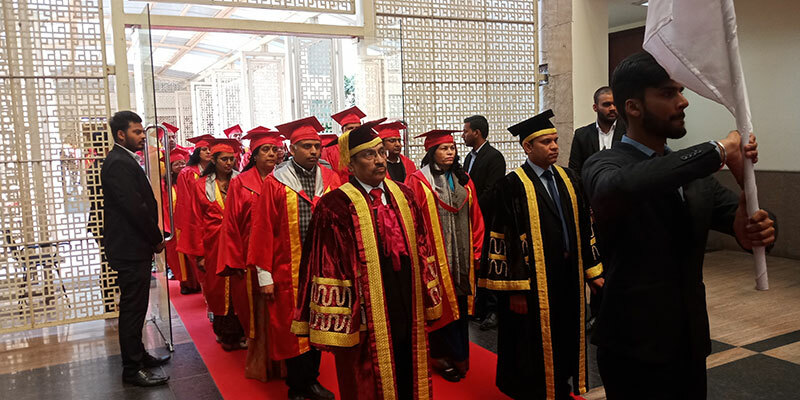 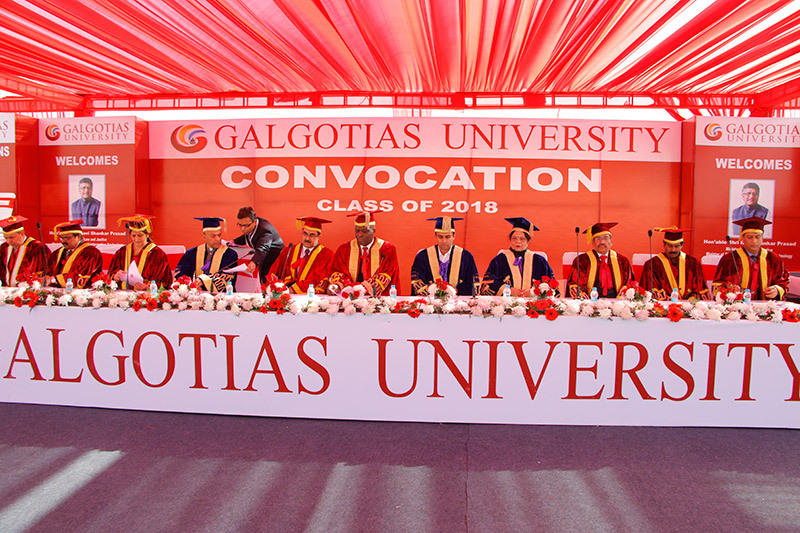 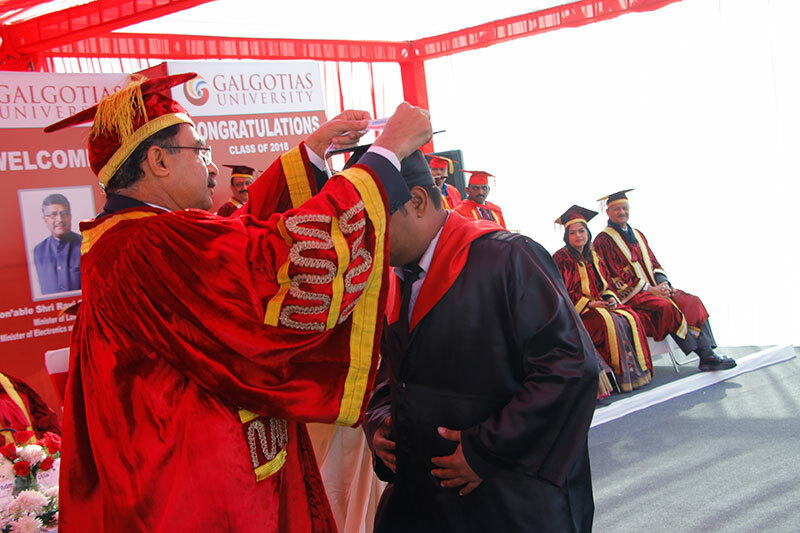 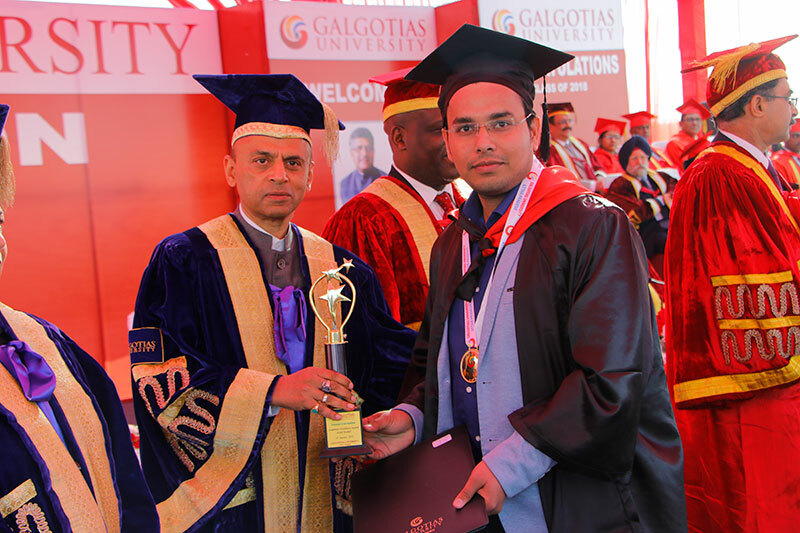 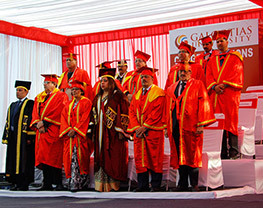 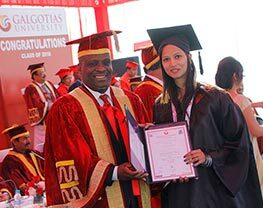 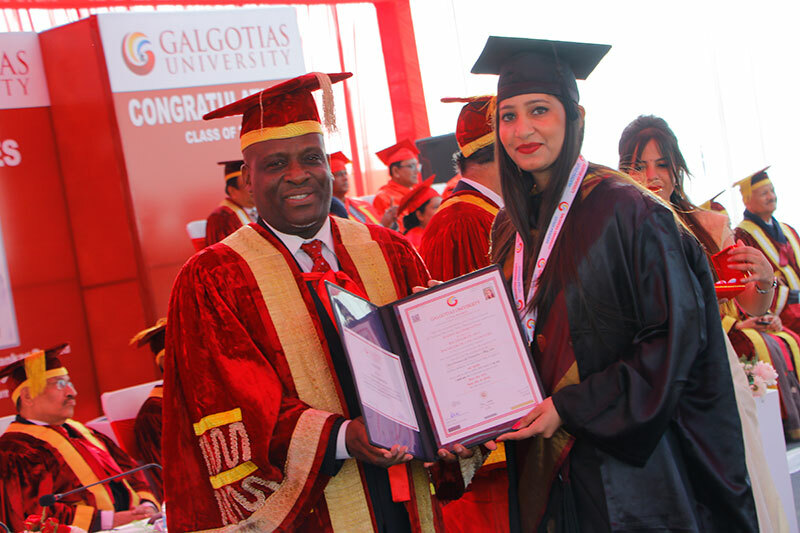 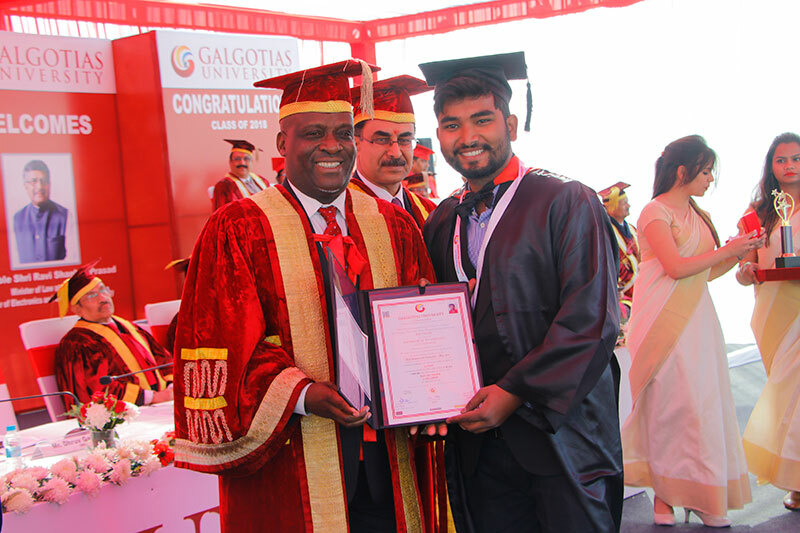 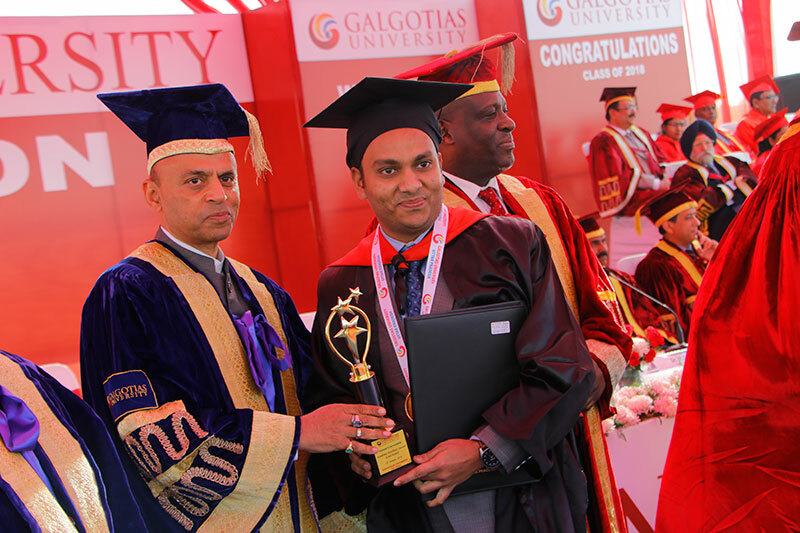 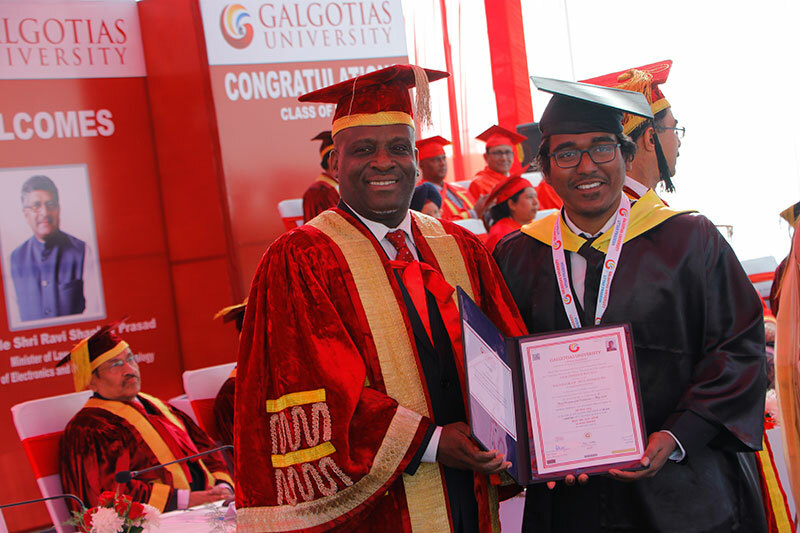 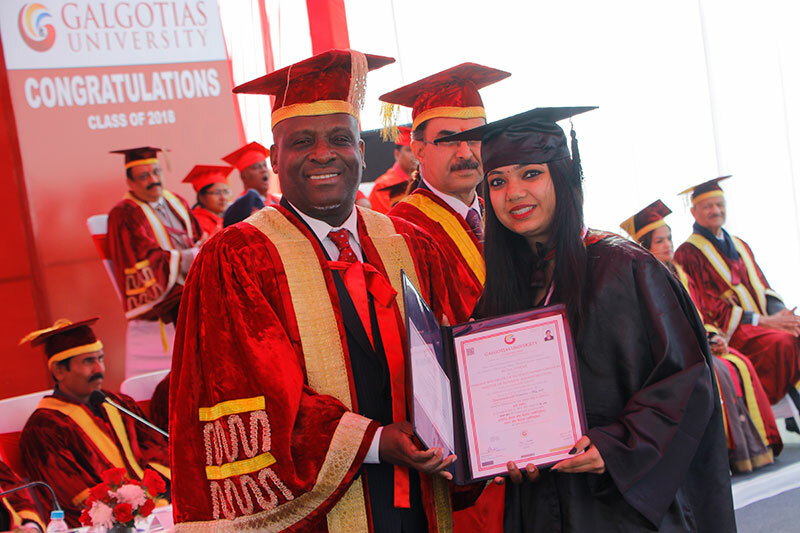 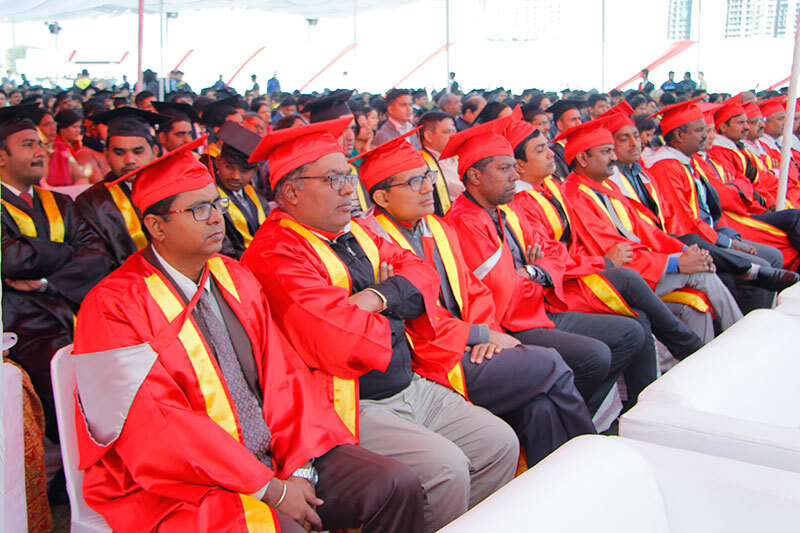 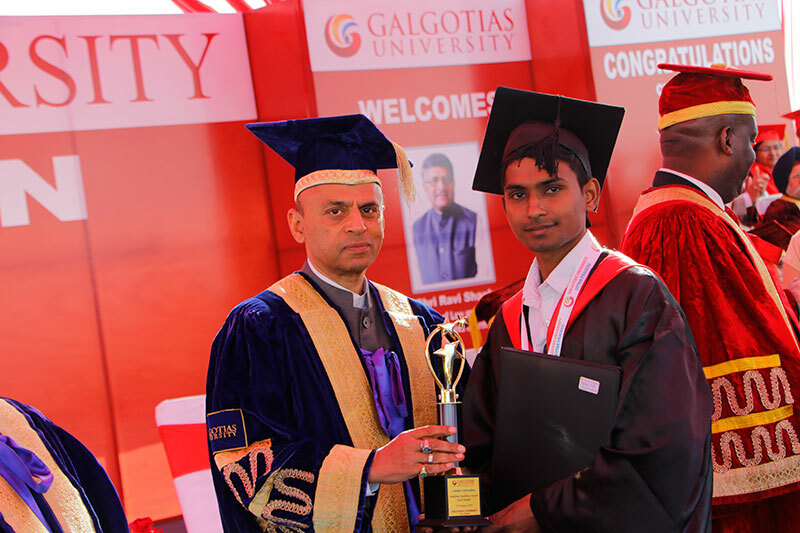 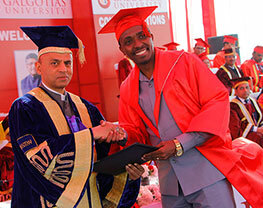 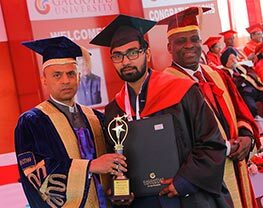 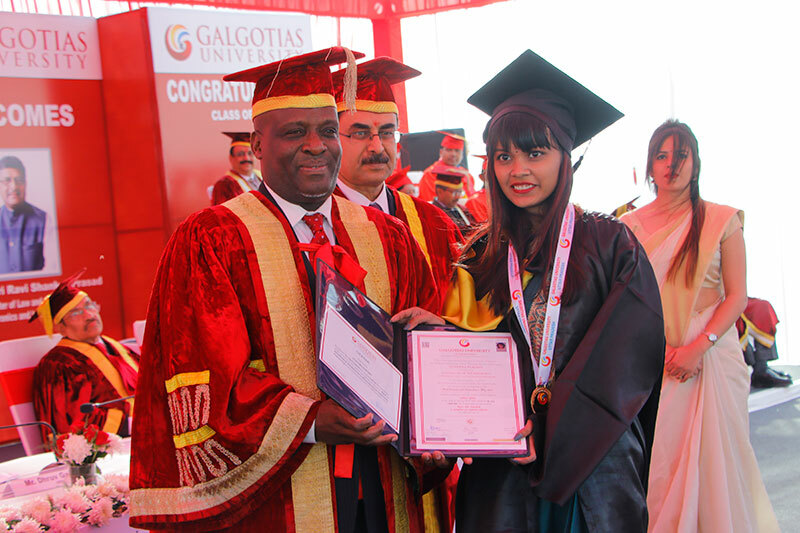 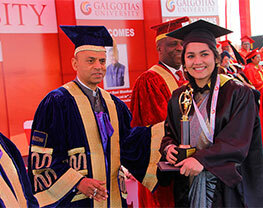 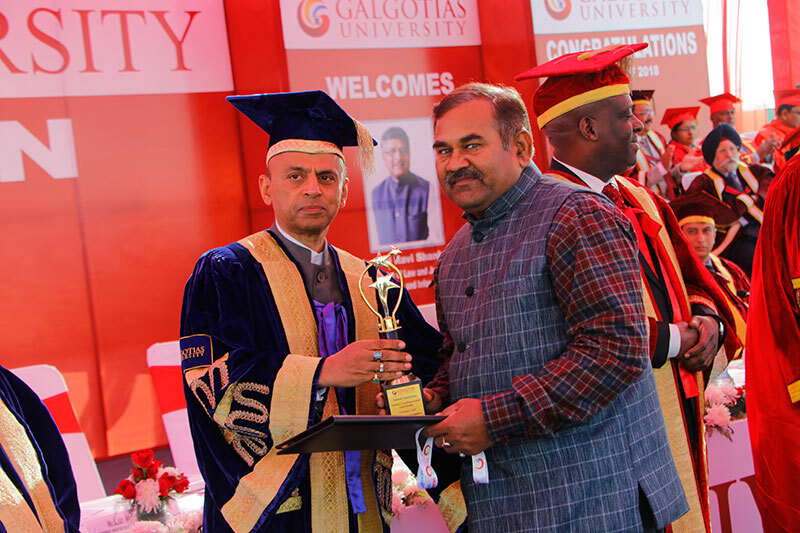 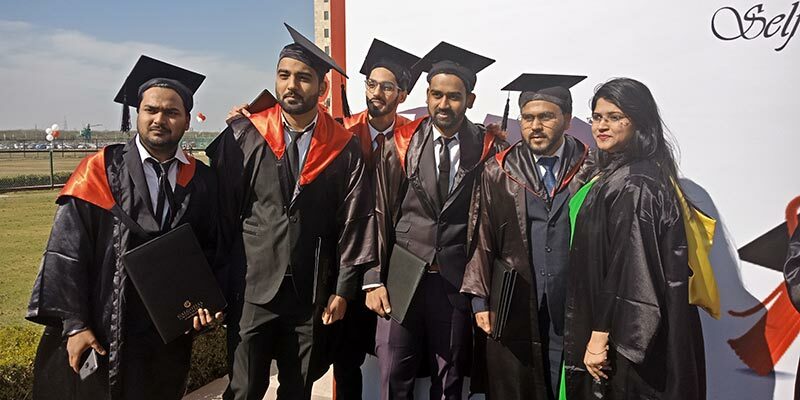 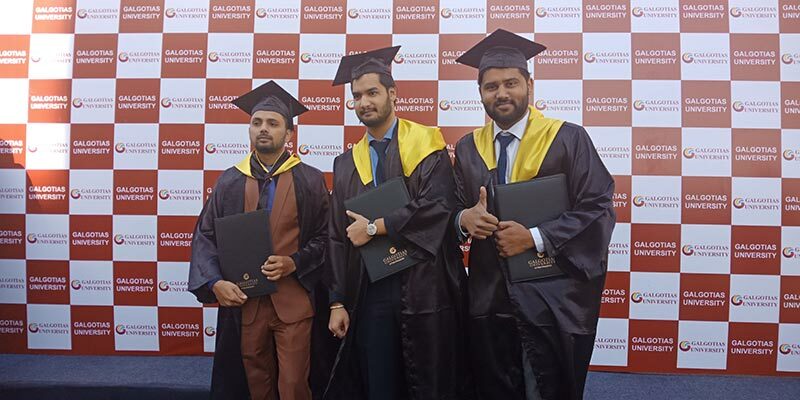 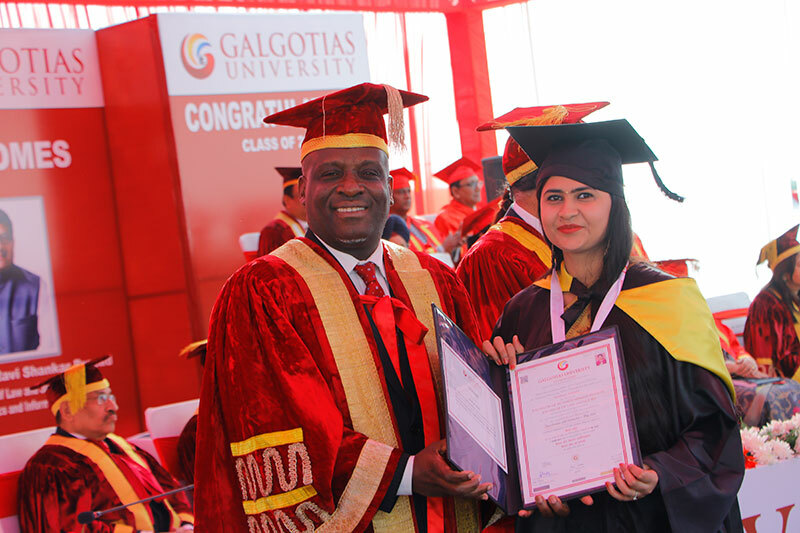 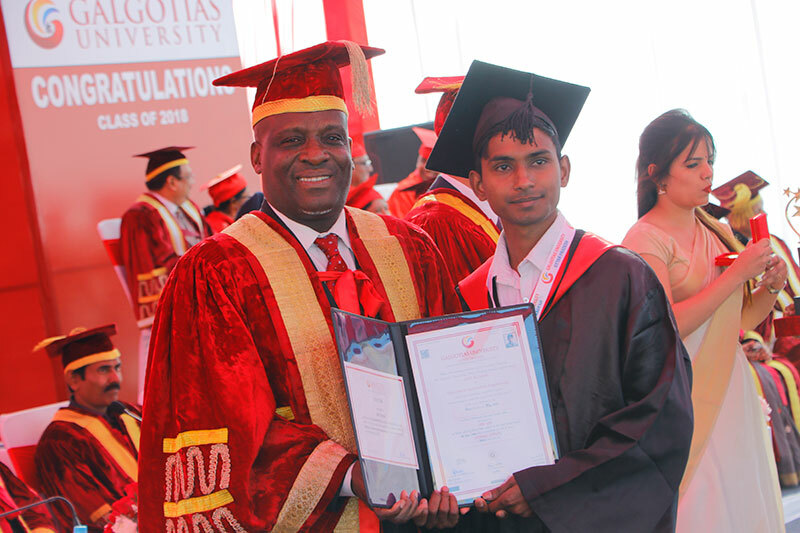 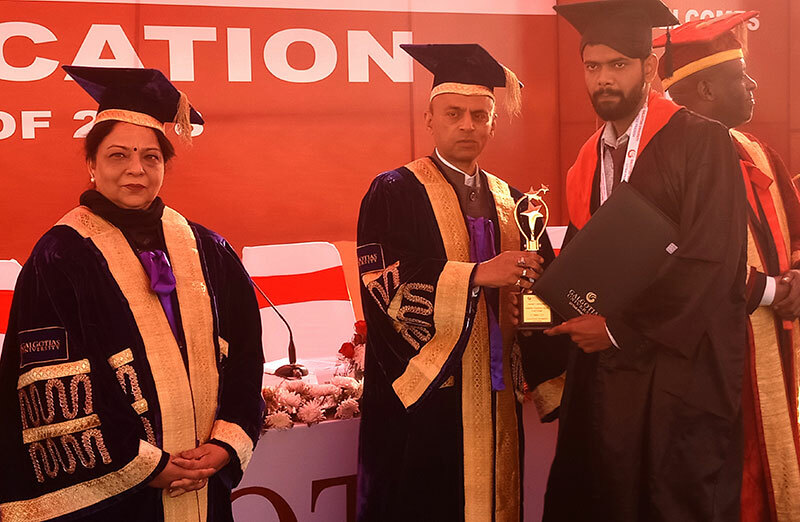 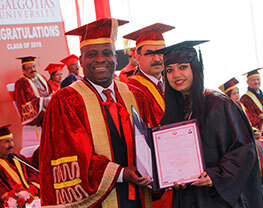 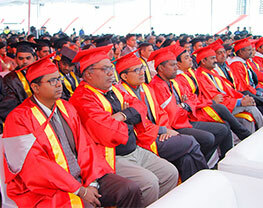 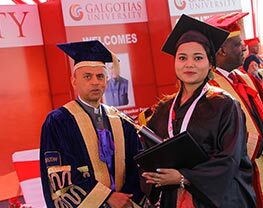 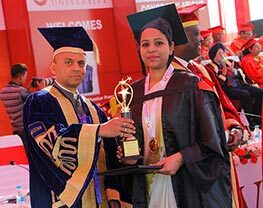 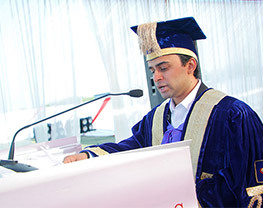 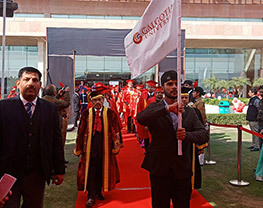 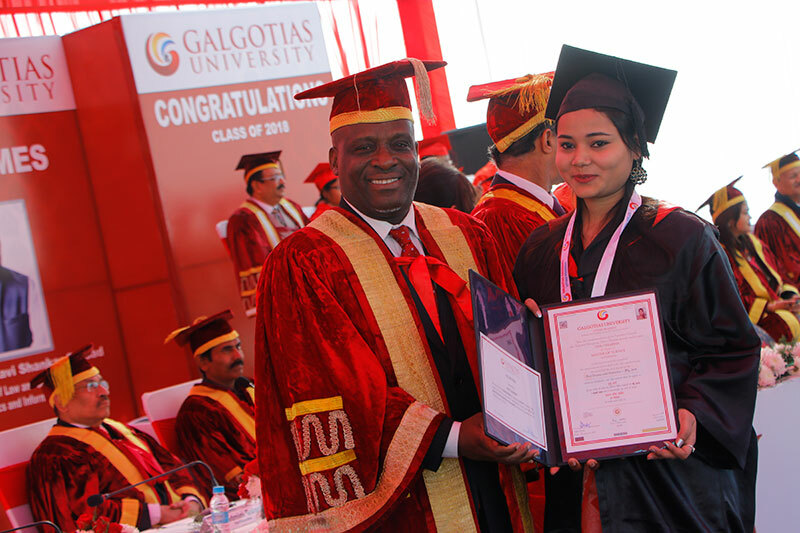 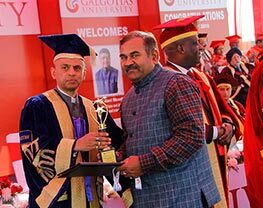 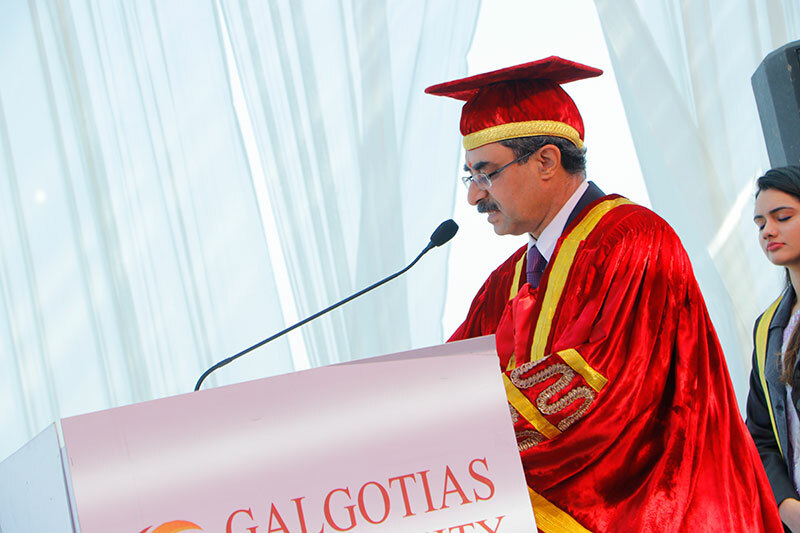 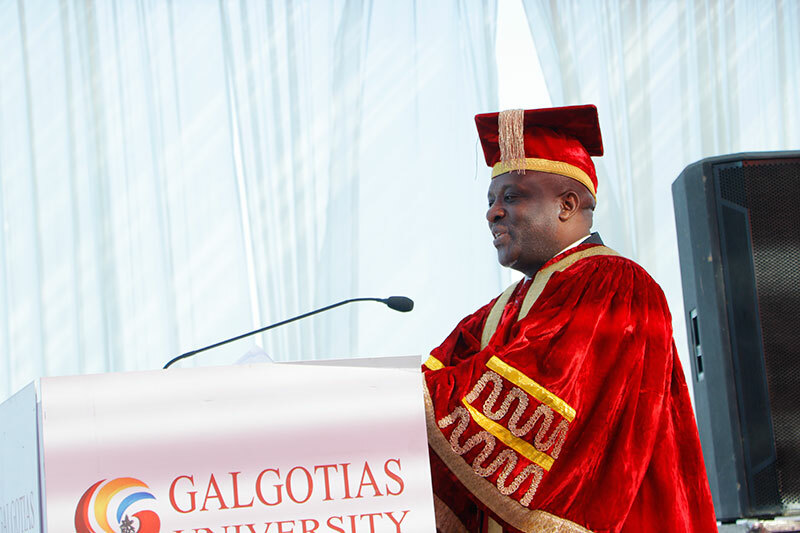 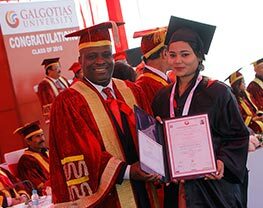 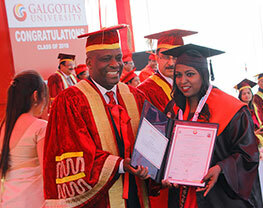 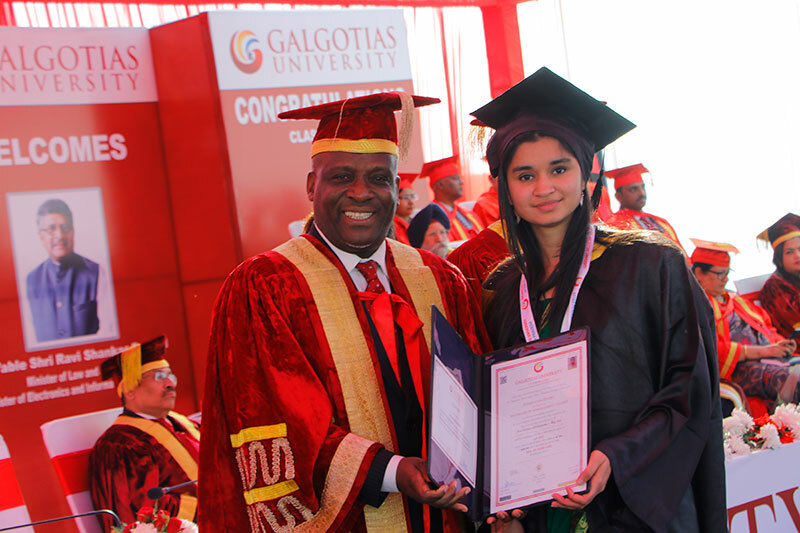 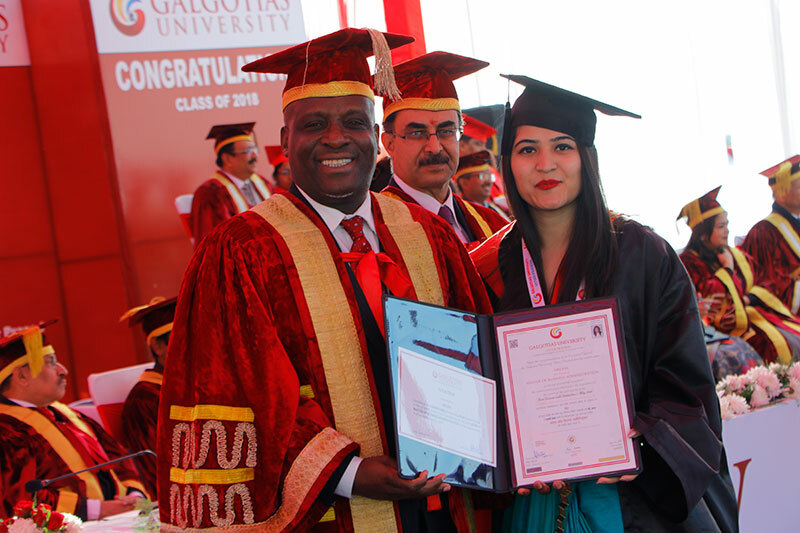 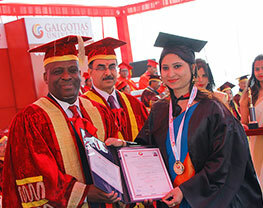 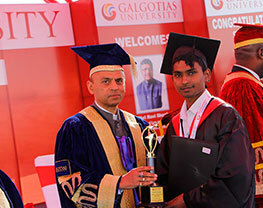 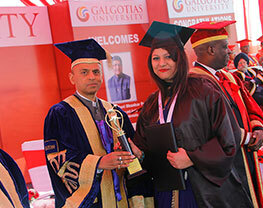 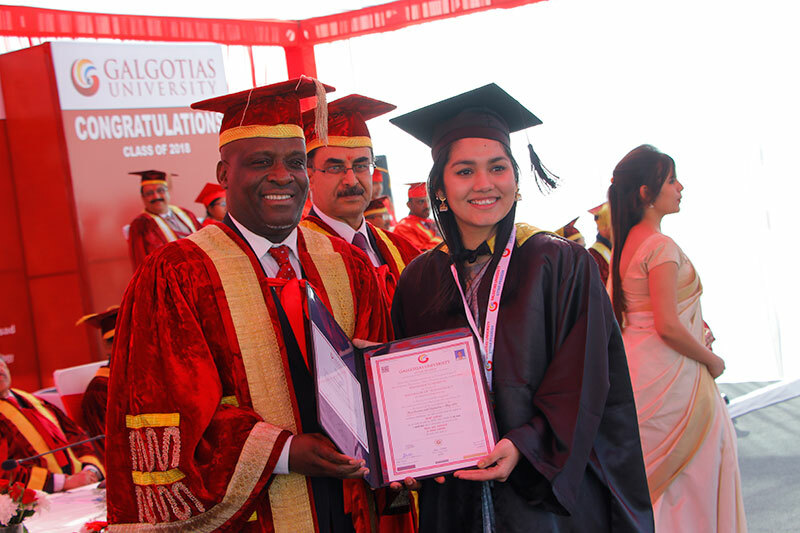 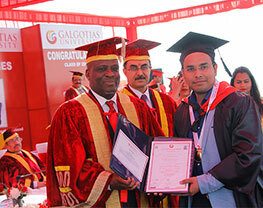 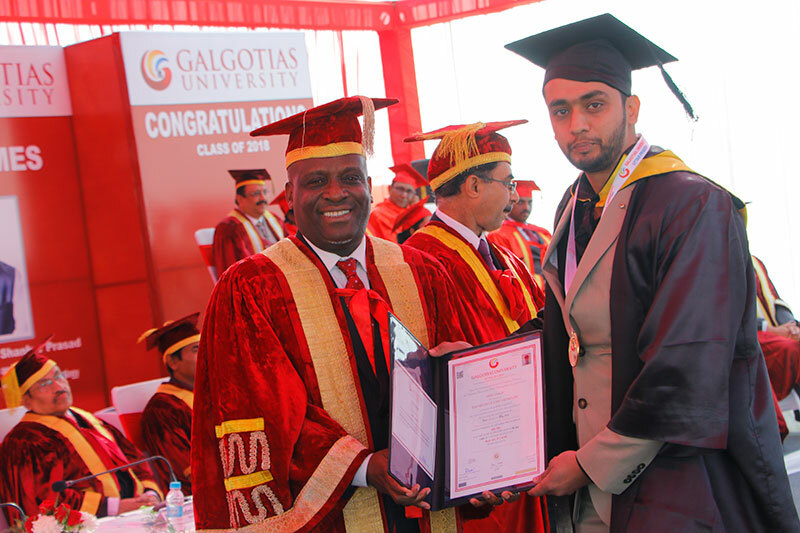 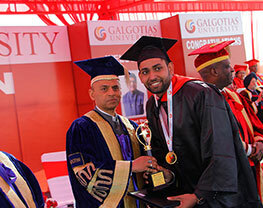 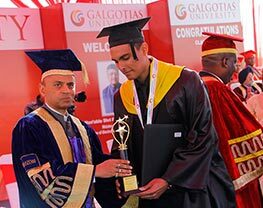 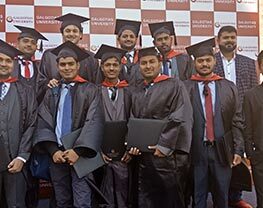 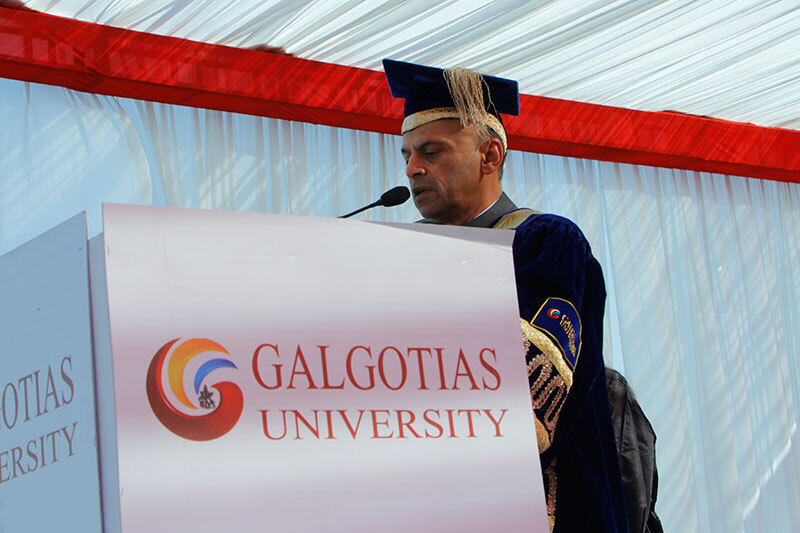 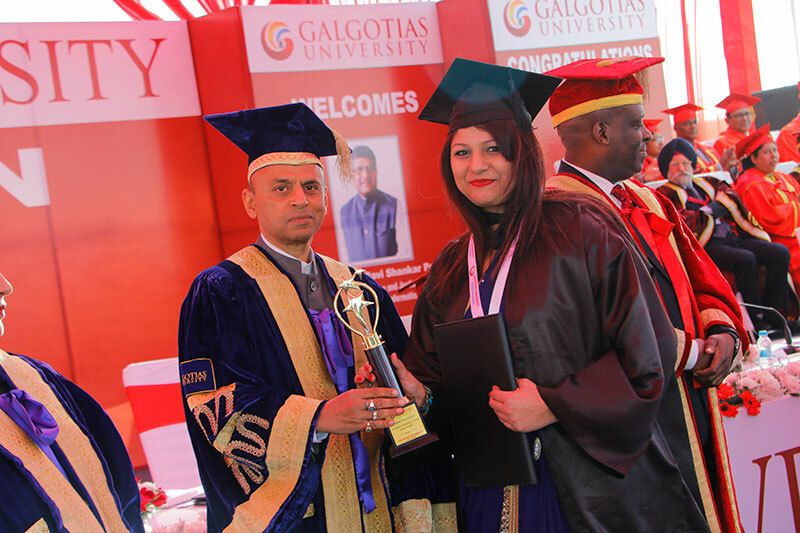 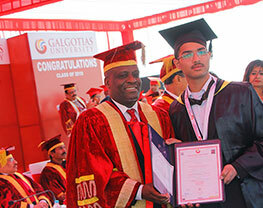 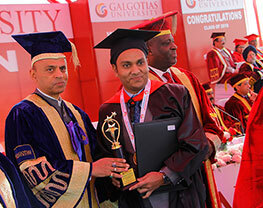 Galgotias University organised its 4th annual convocation ceremony on Monday, 14 January 2019. 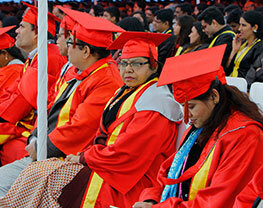 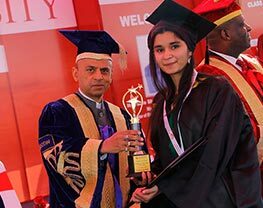 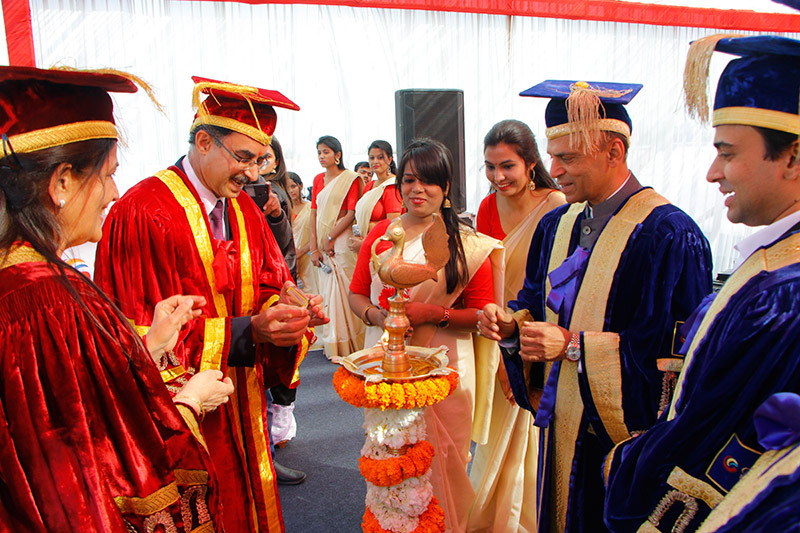 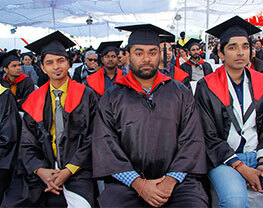 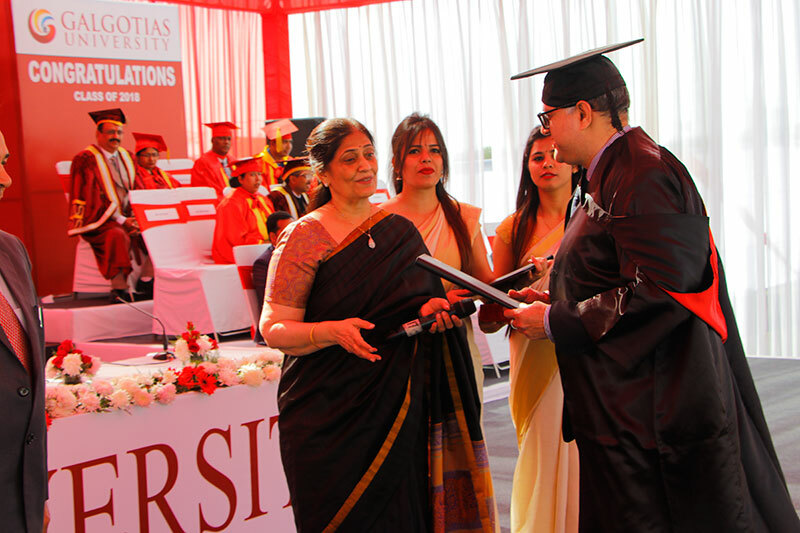 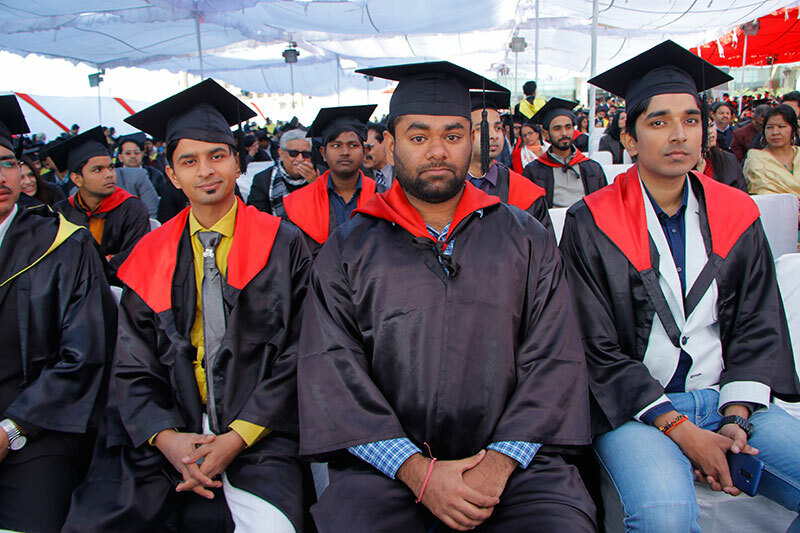 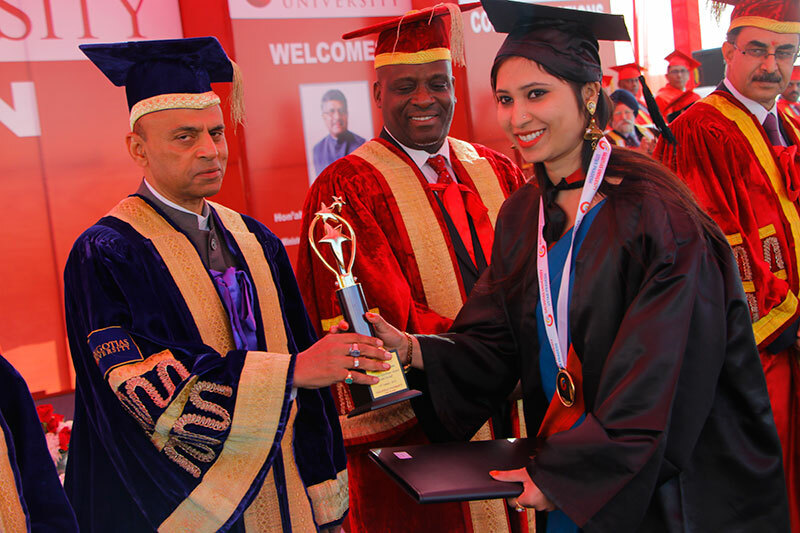 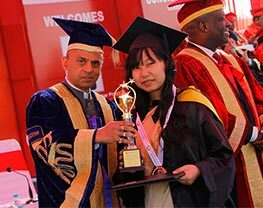 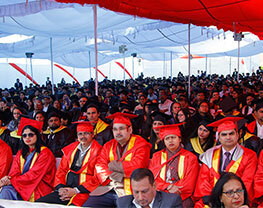 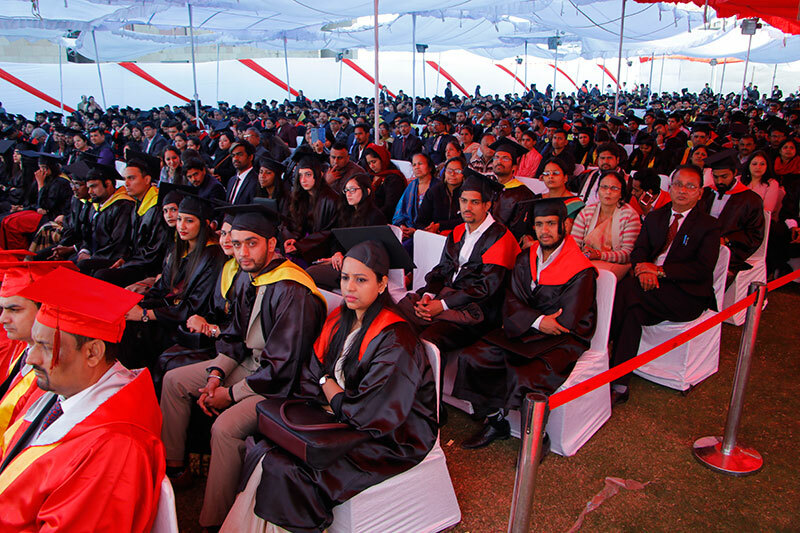 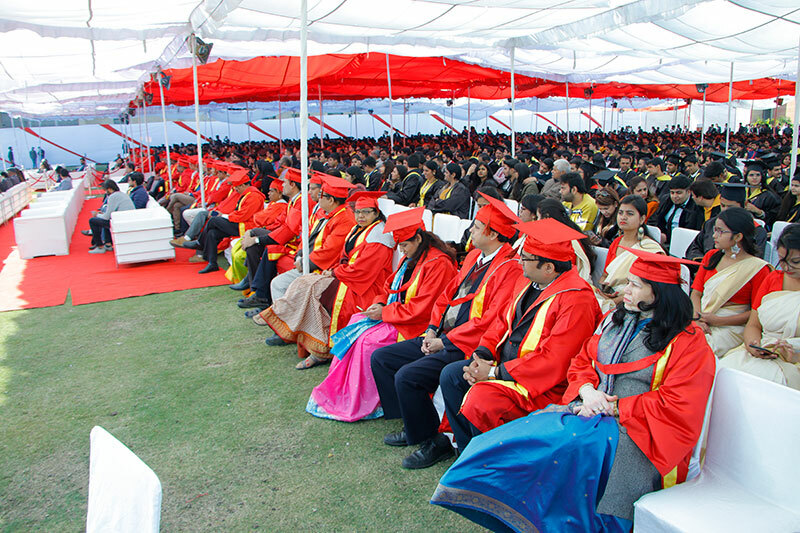 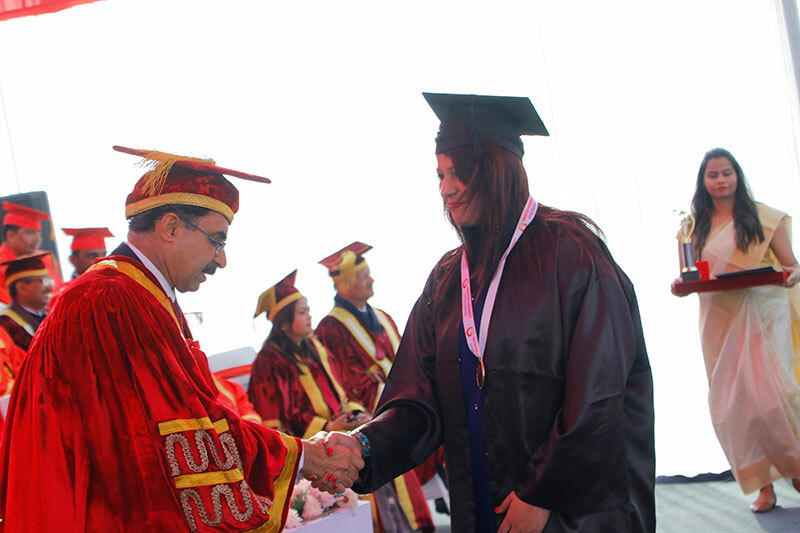 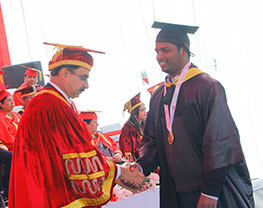 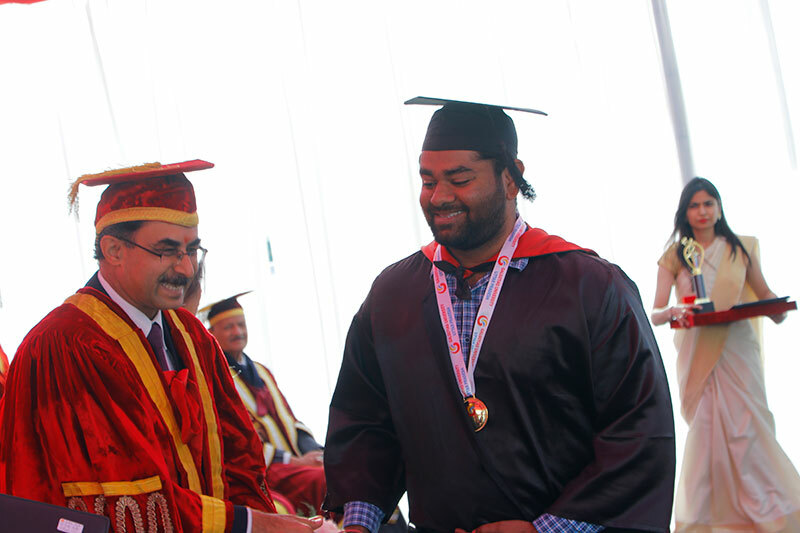 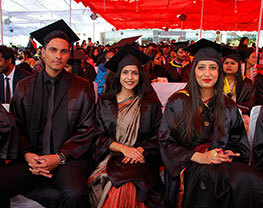 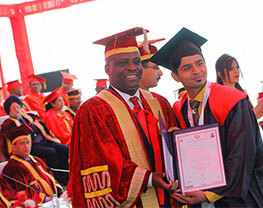 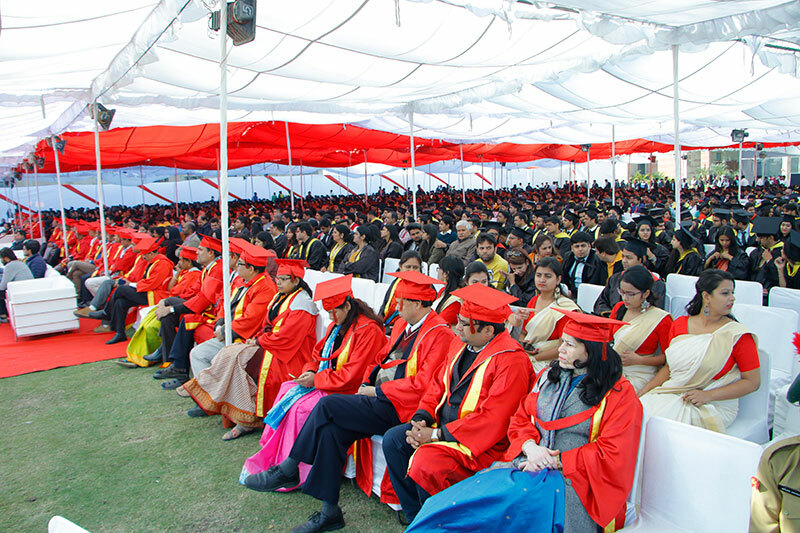 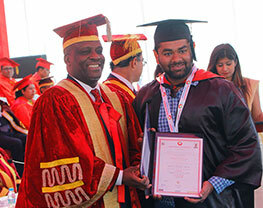 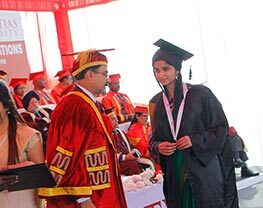 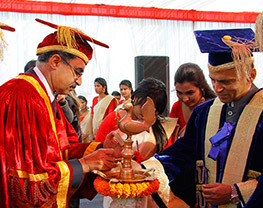 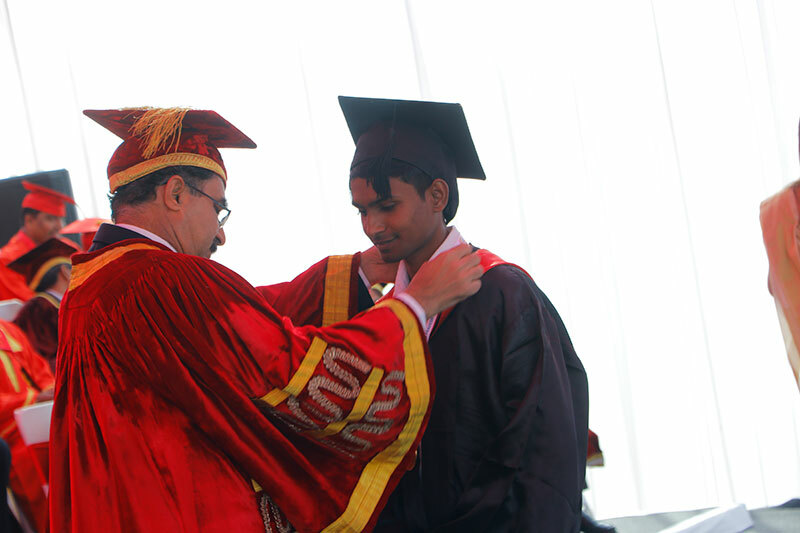 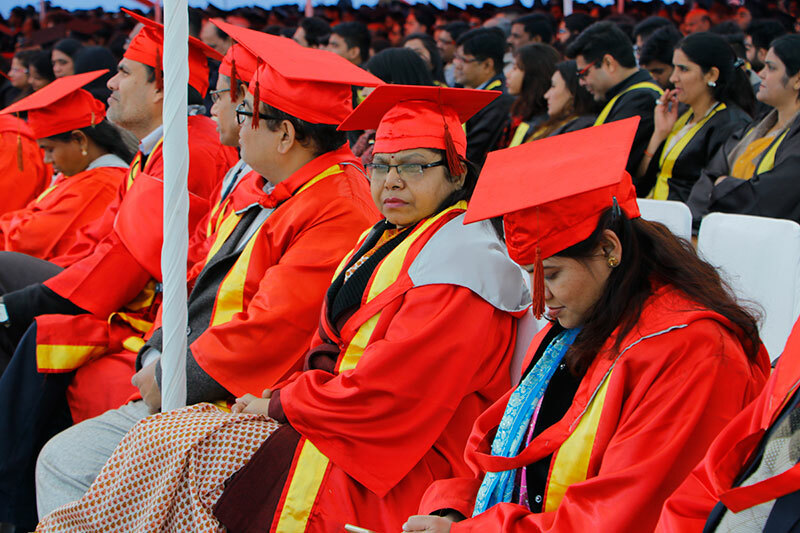 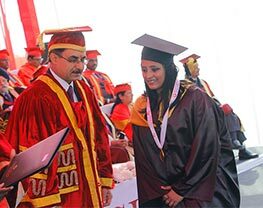 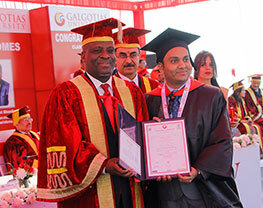 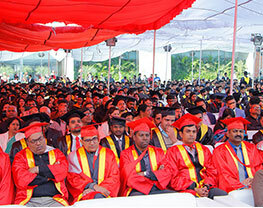 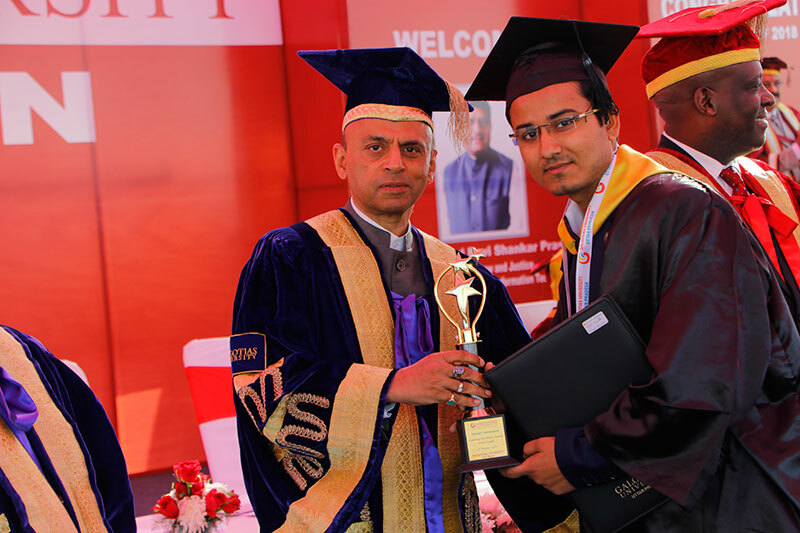 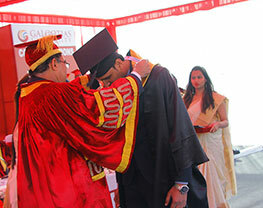 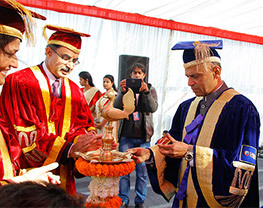 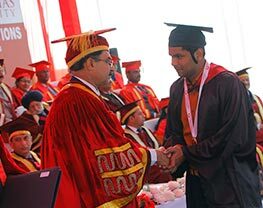 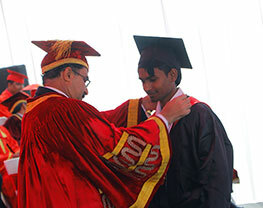 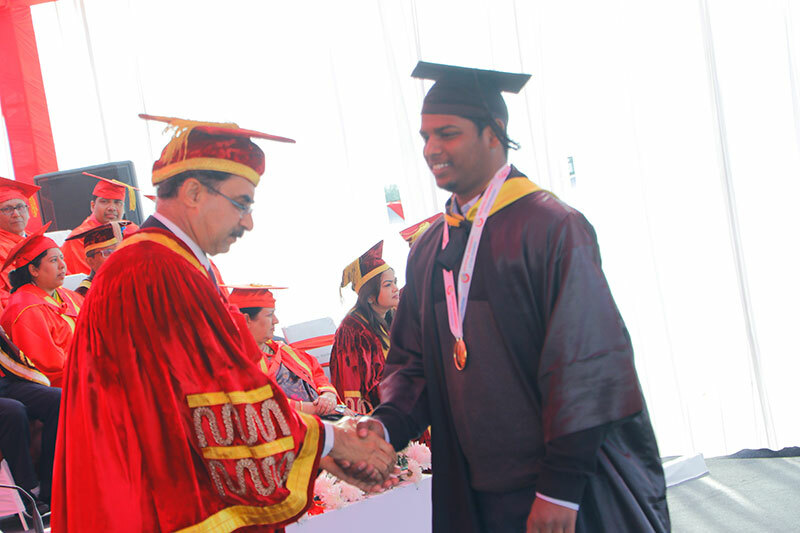 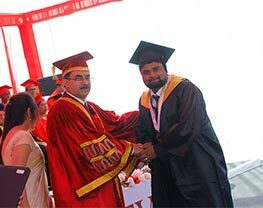 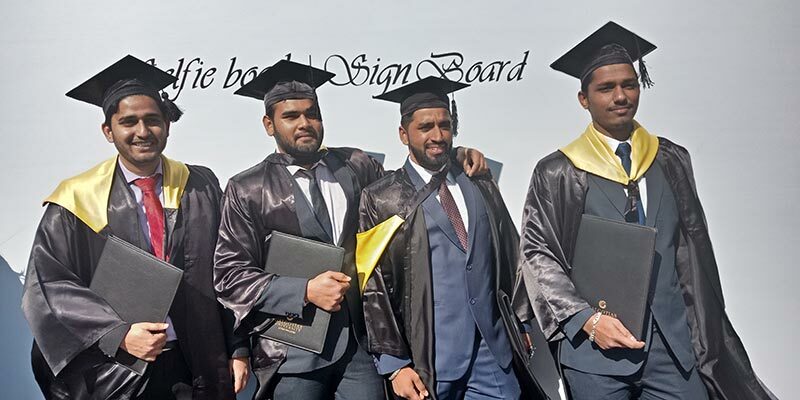 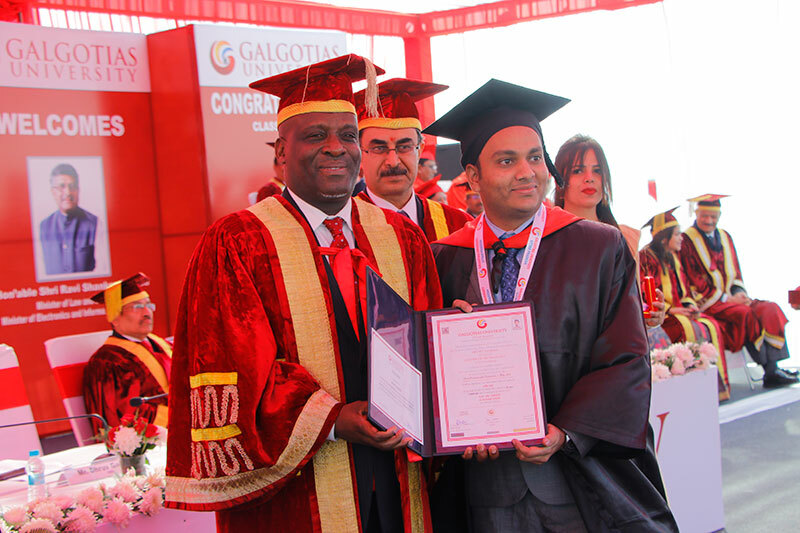 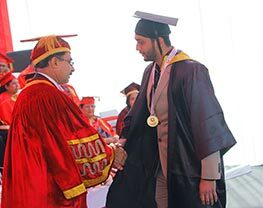 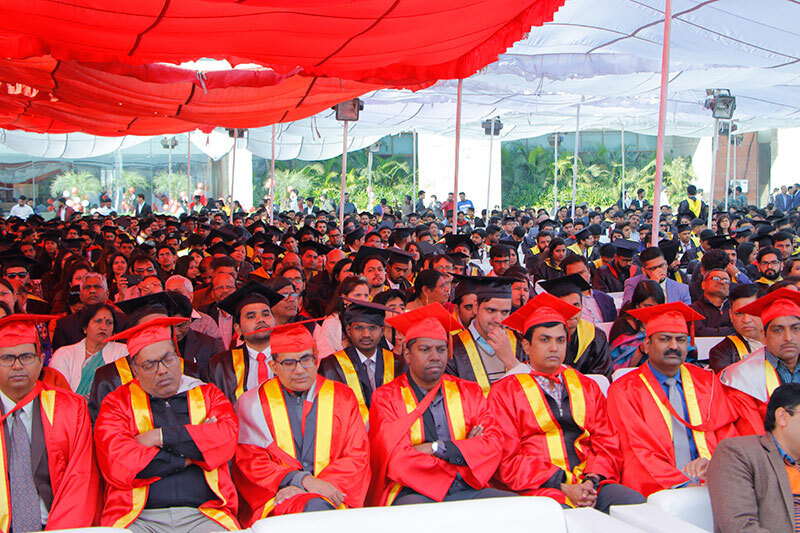 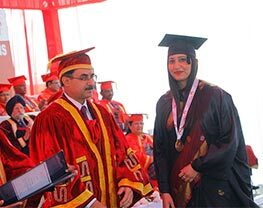 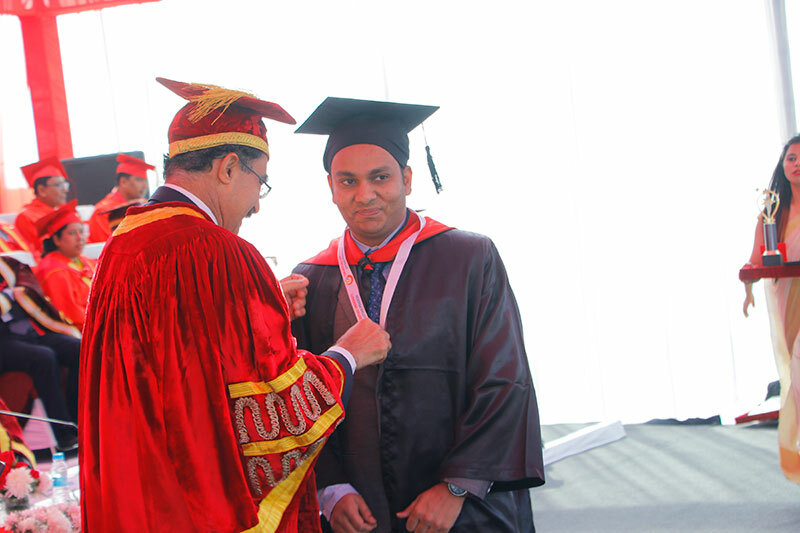 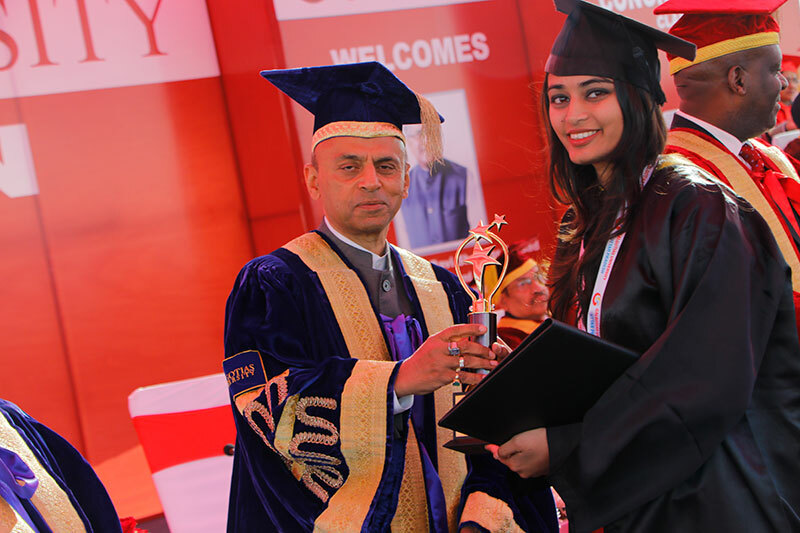 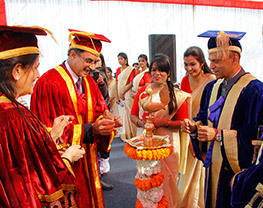 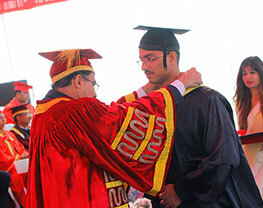 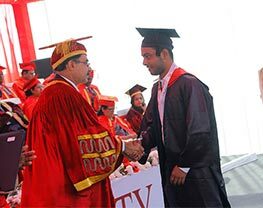 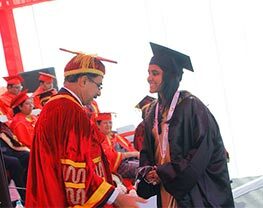 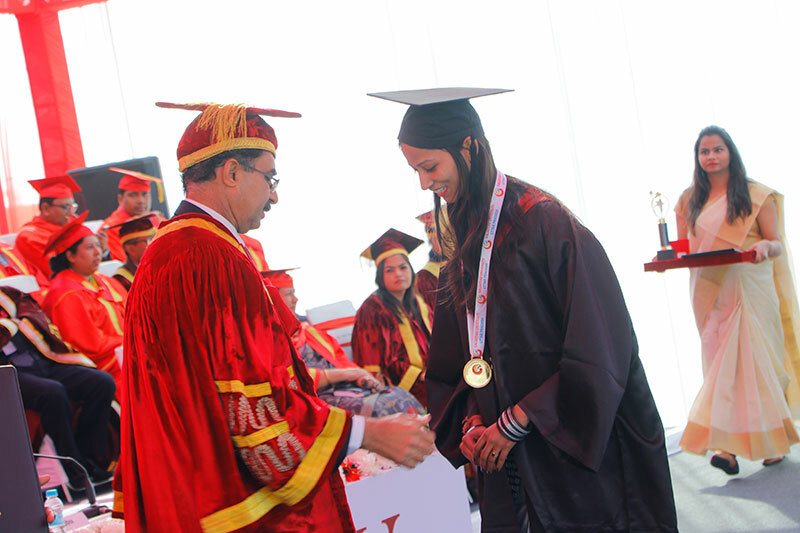 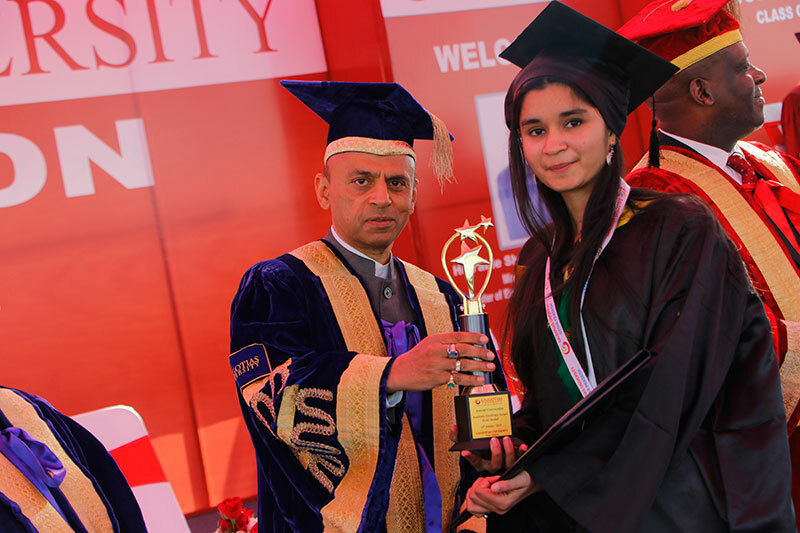 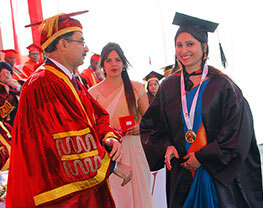 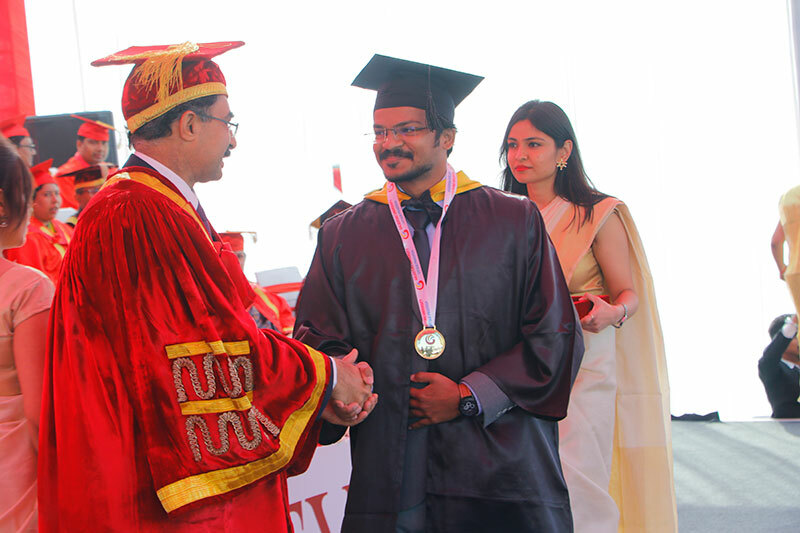 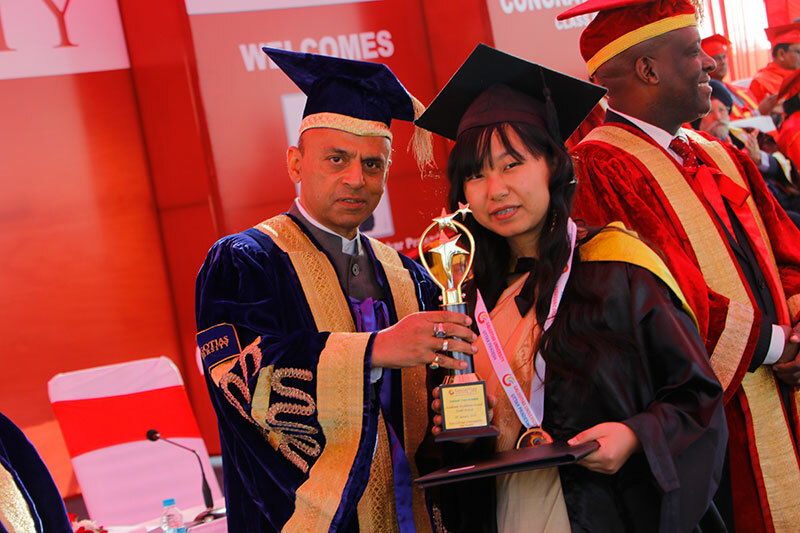 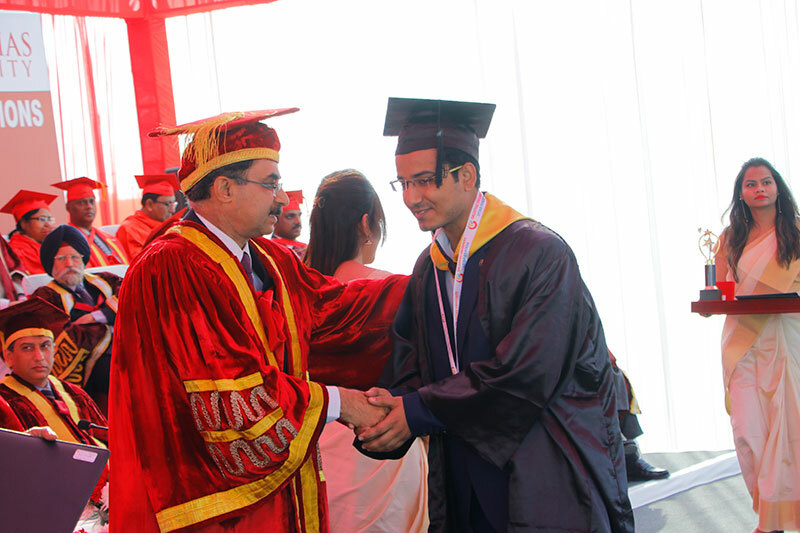 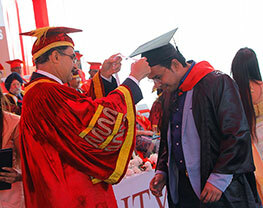 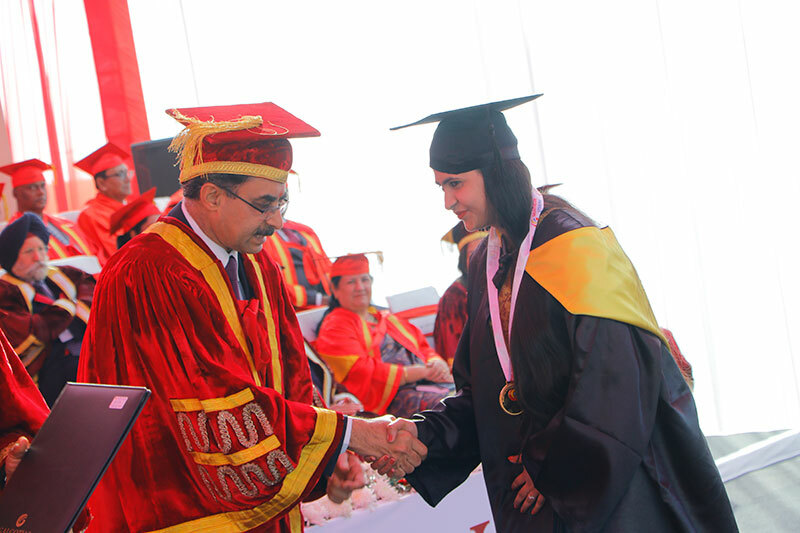 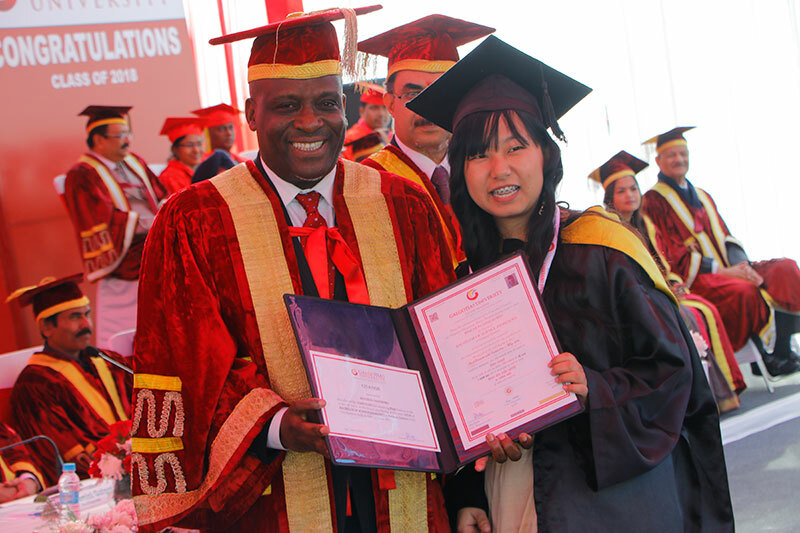 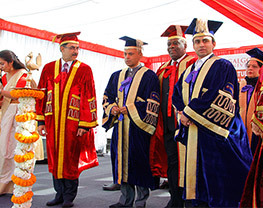 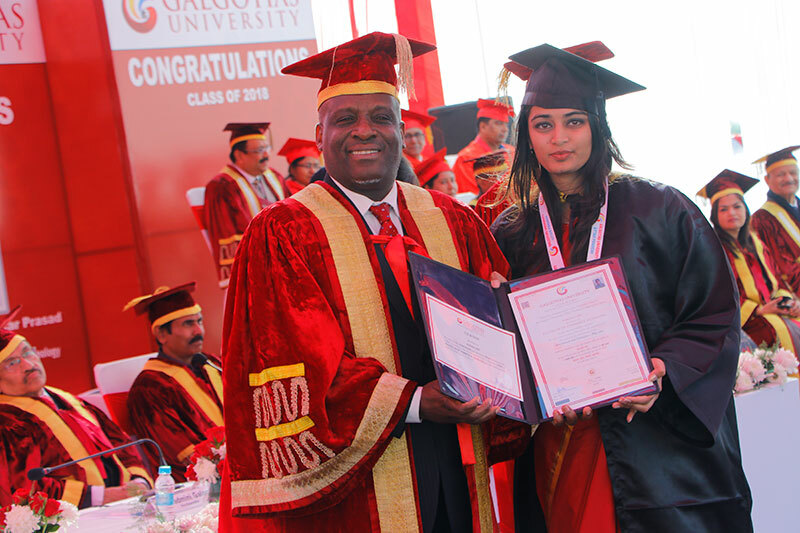 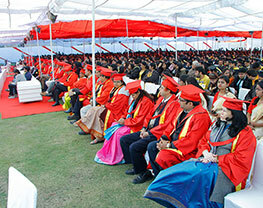 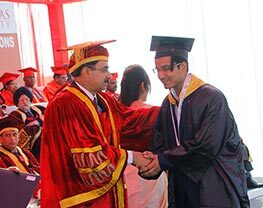 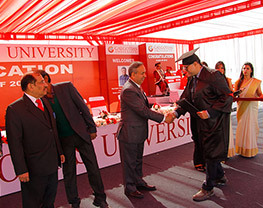 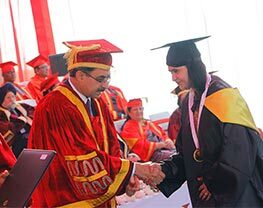 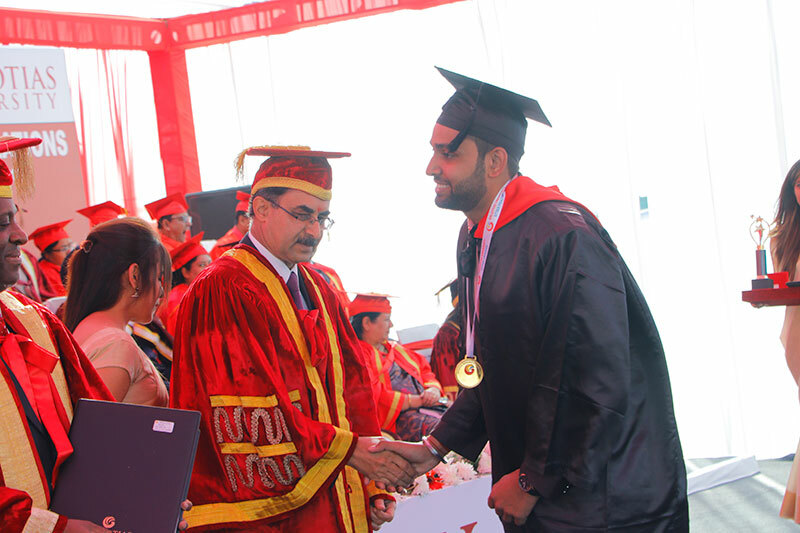 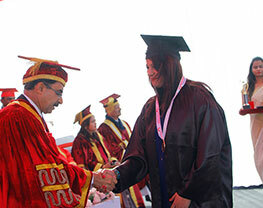 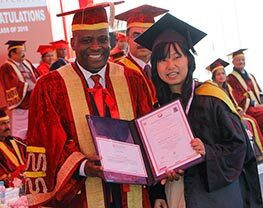 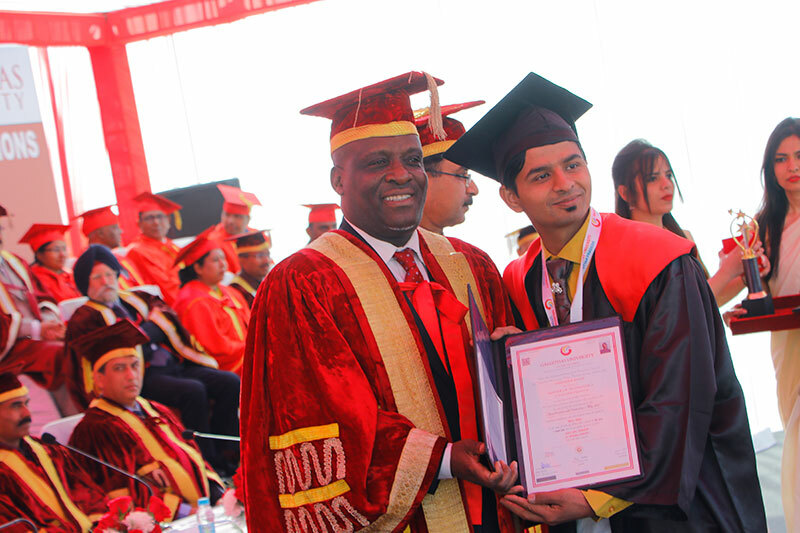 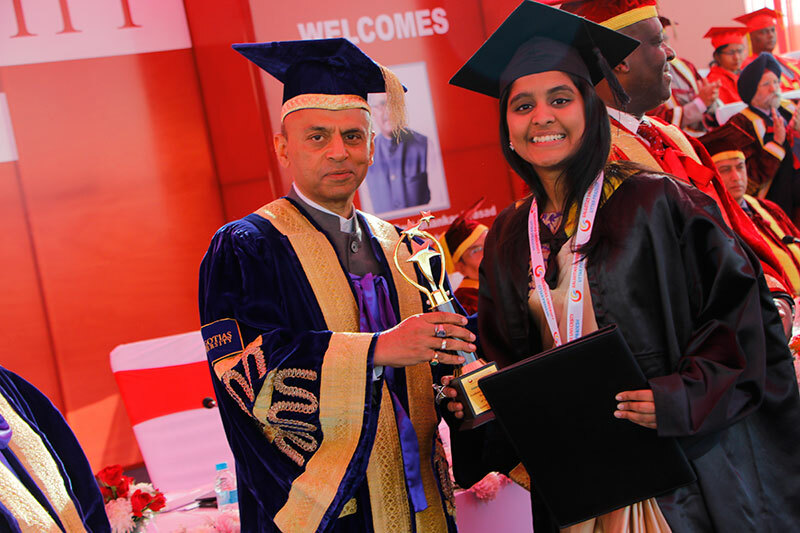 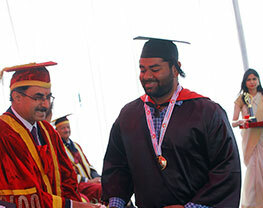 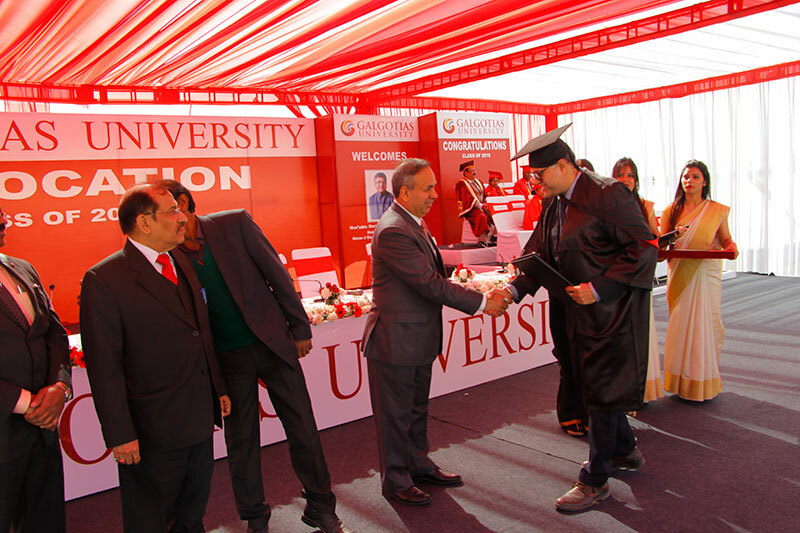 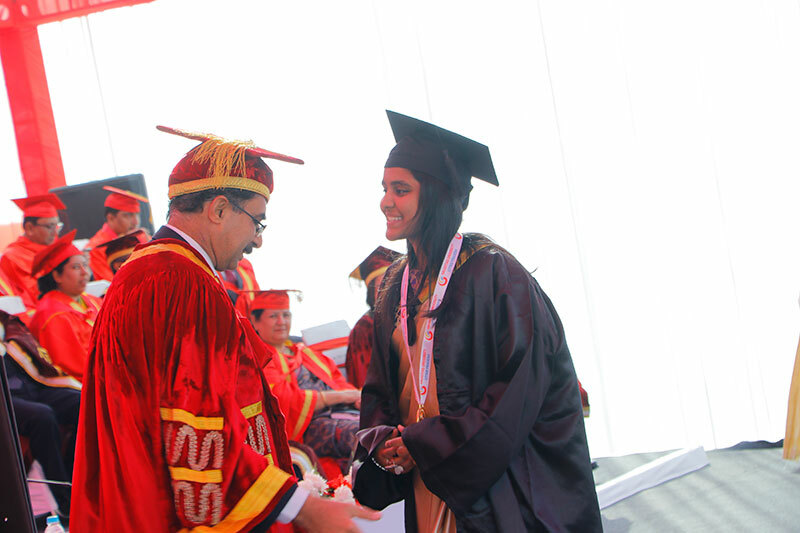 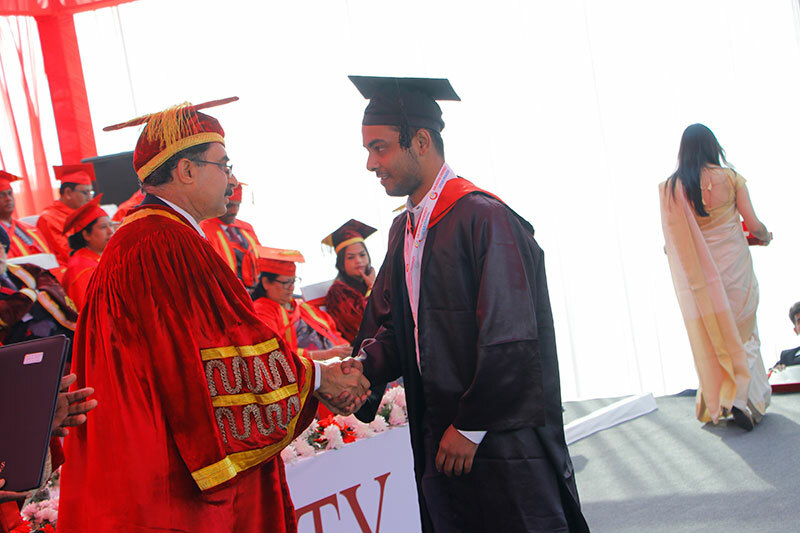 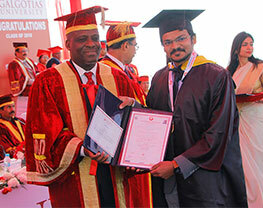 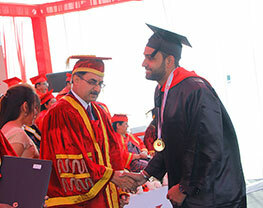 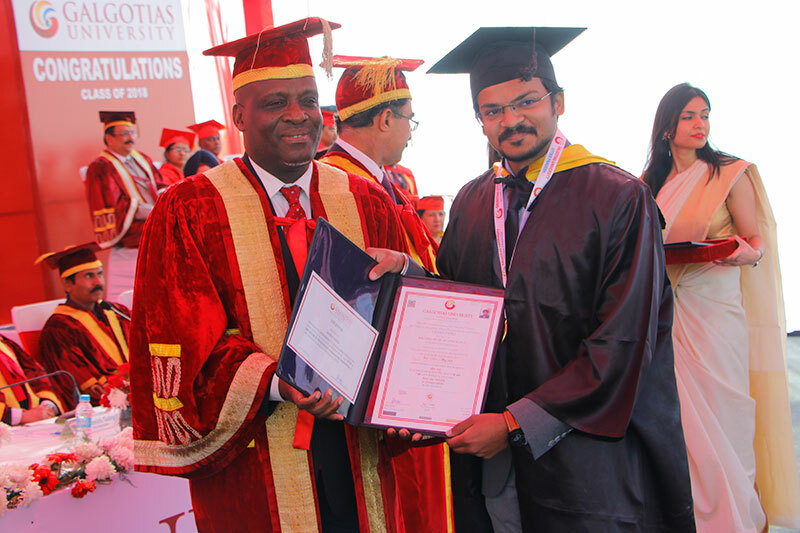 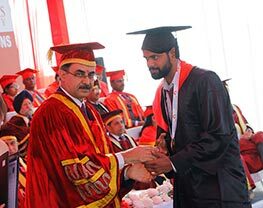 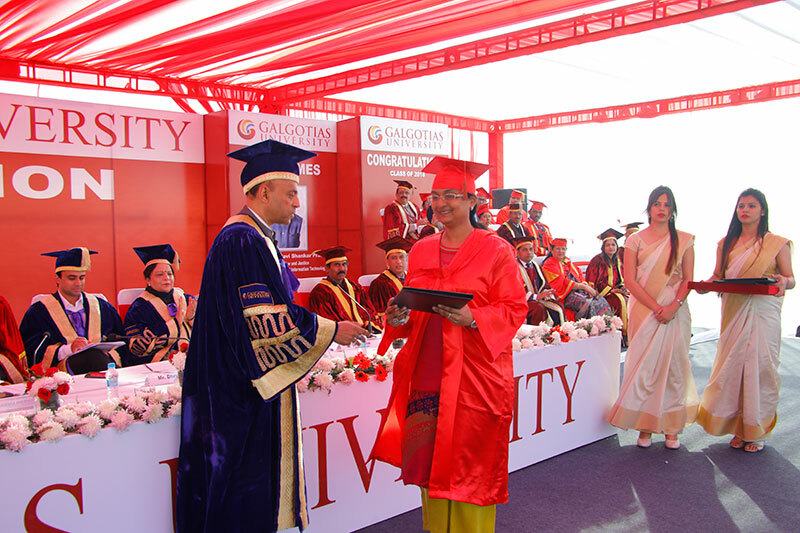 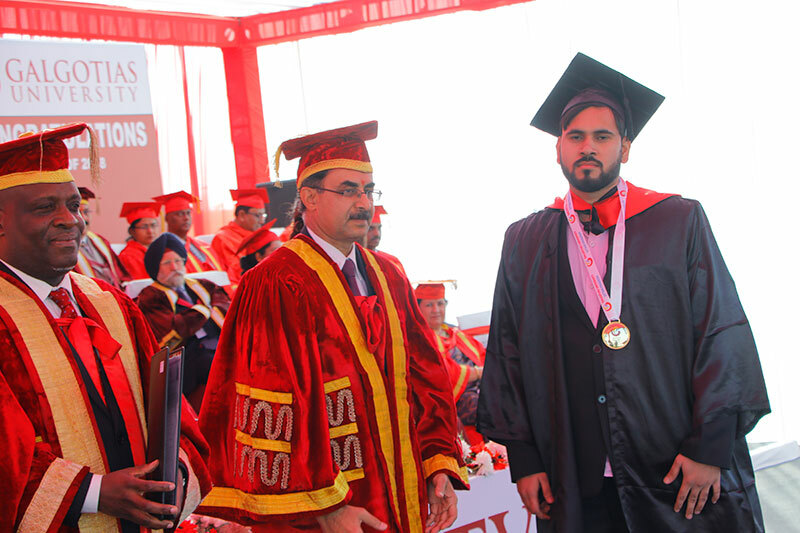 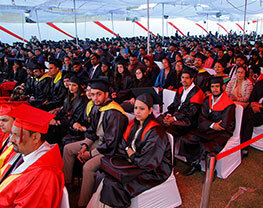 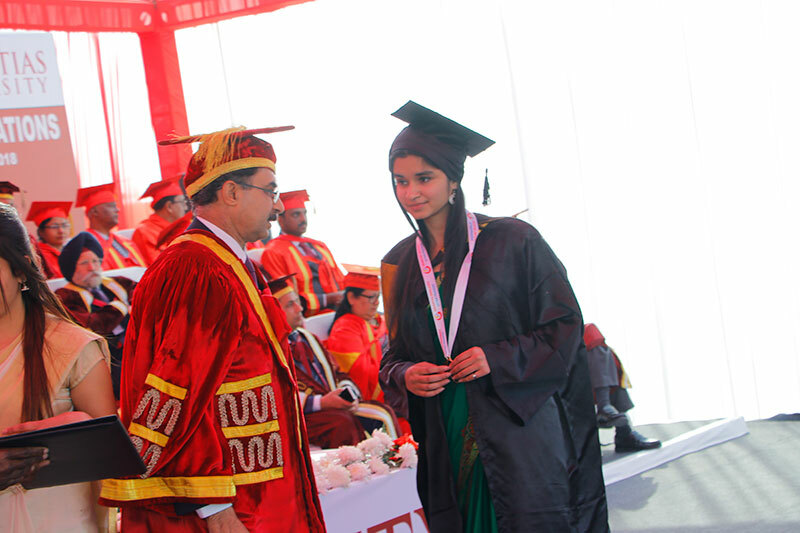 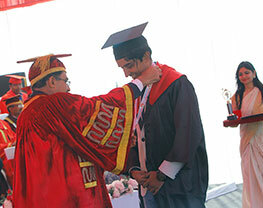 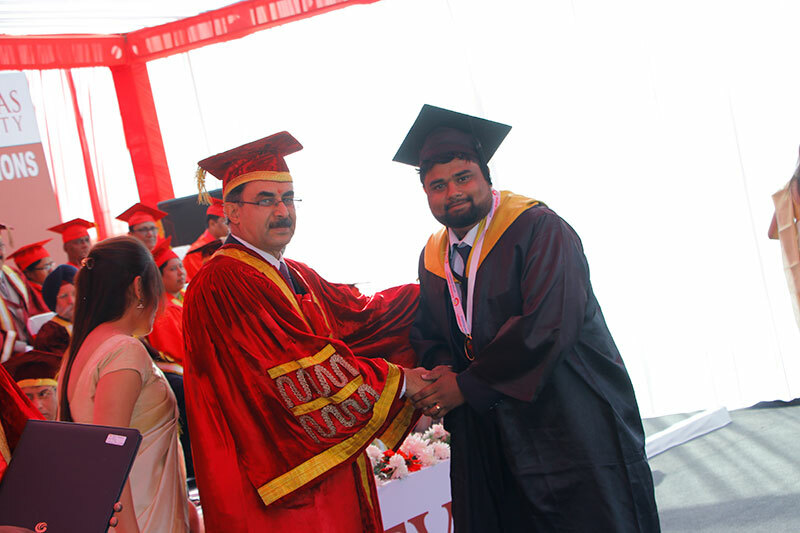 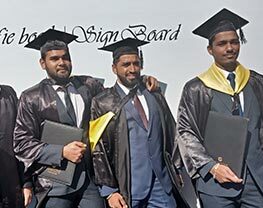 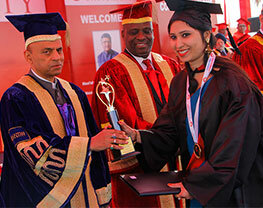 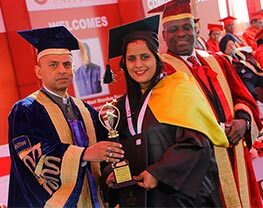 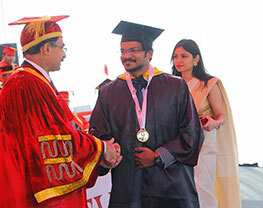 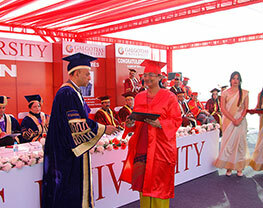 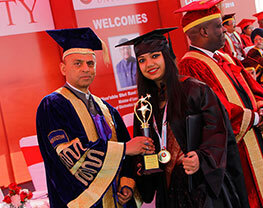 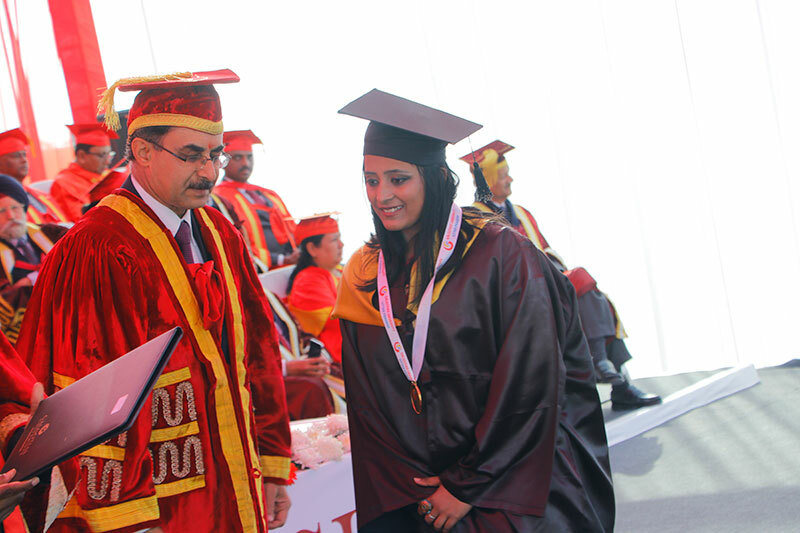 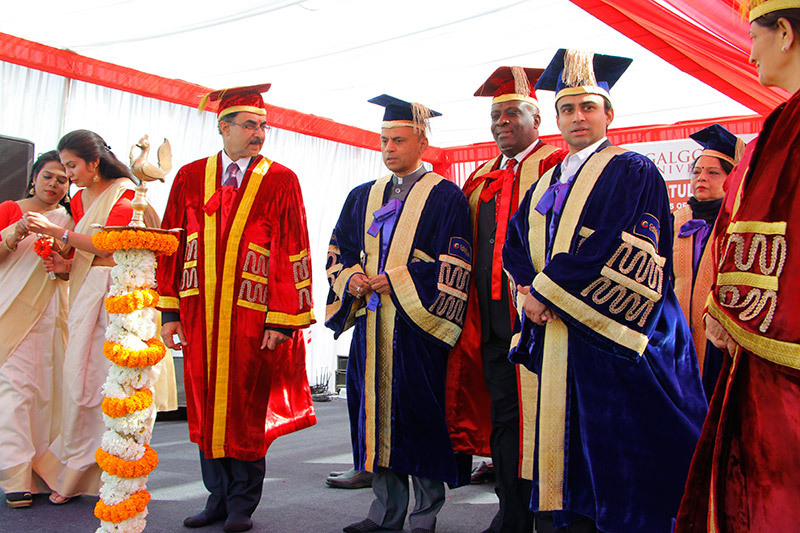 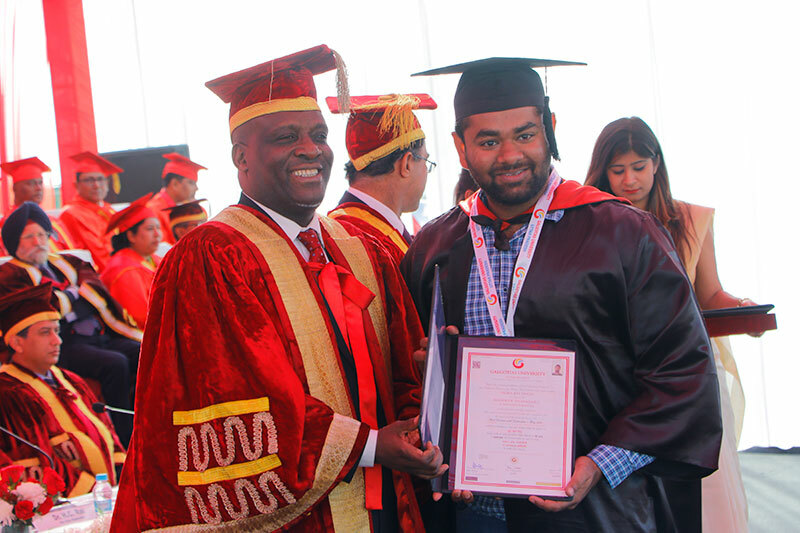 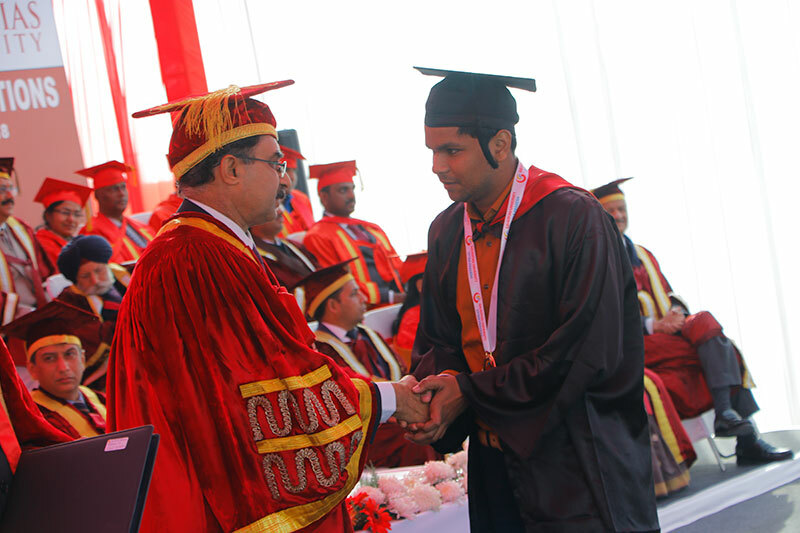 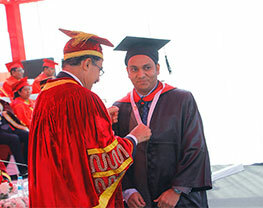 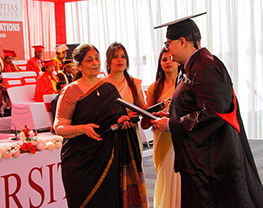 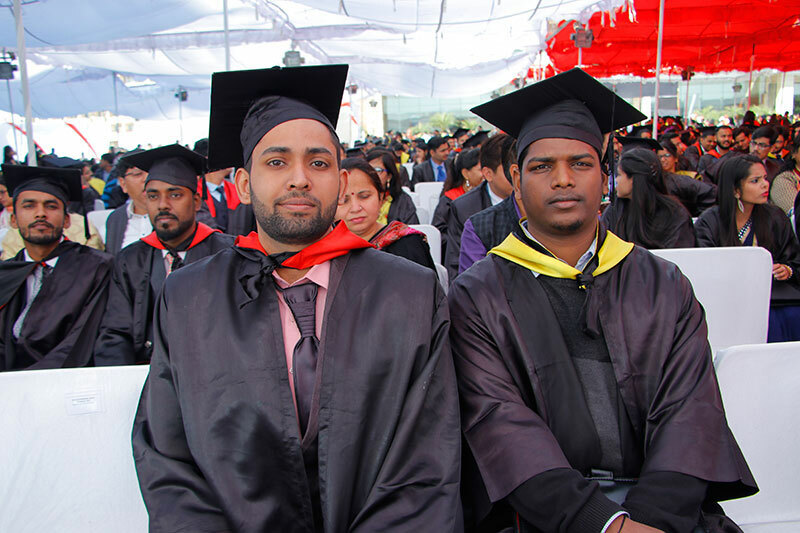 A total of 2500 plus graduates were conferred degrees this year. 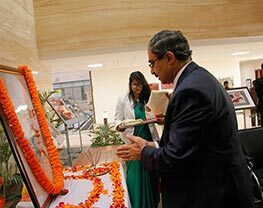 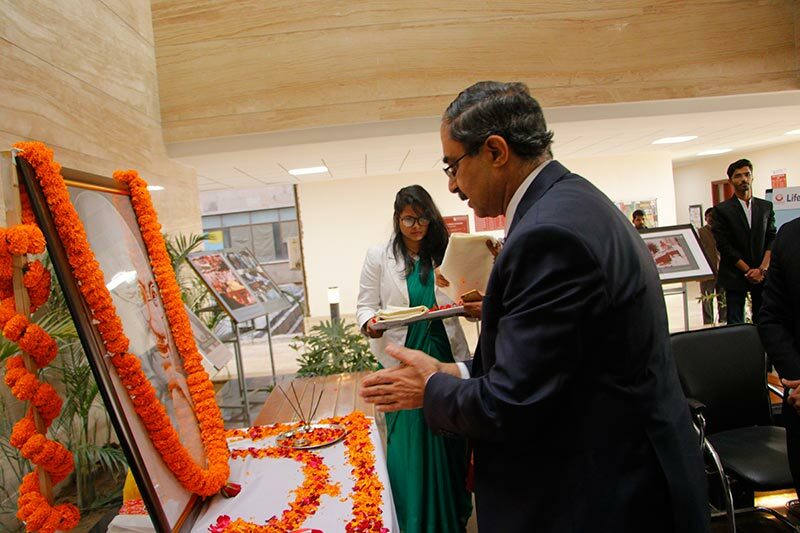 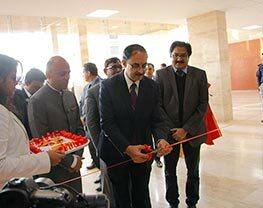 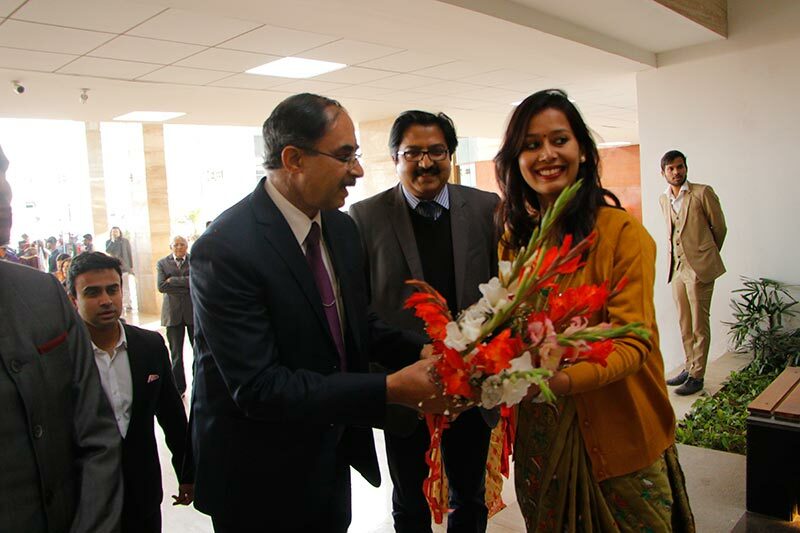 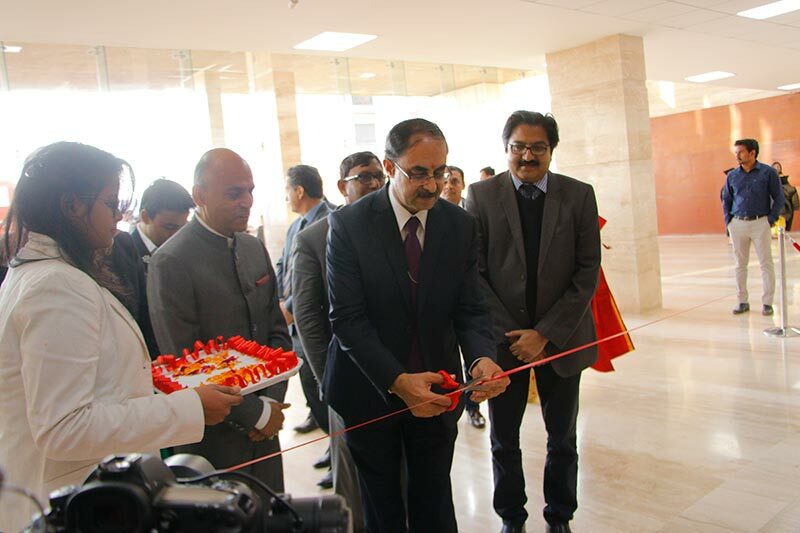 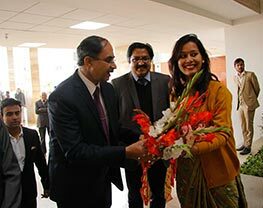 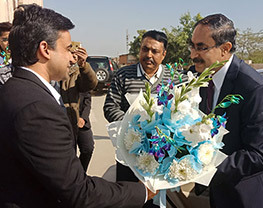 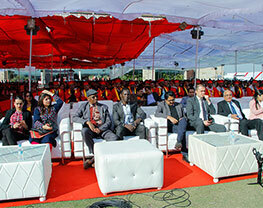 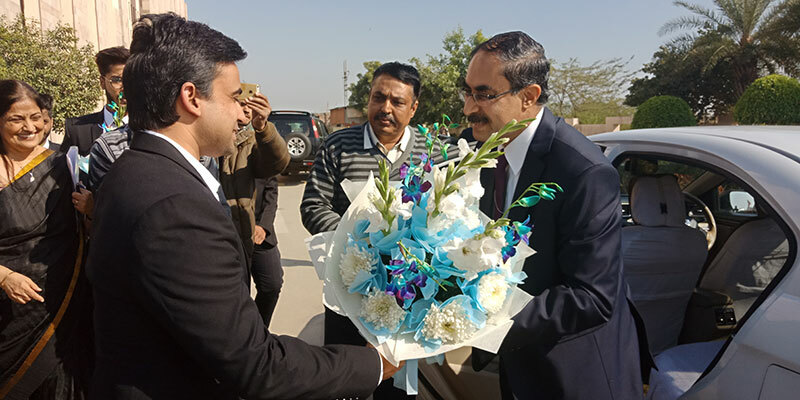 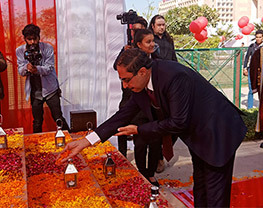 Mr. Ajay Prakash Sawhney, Secretary Ministry of Electronic and Information Technology was the chief guest of the event. 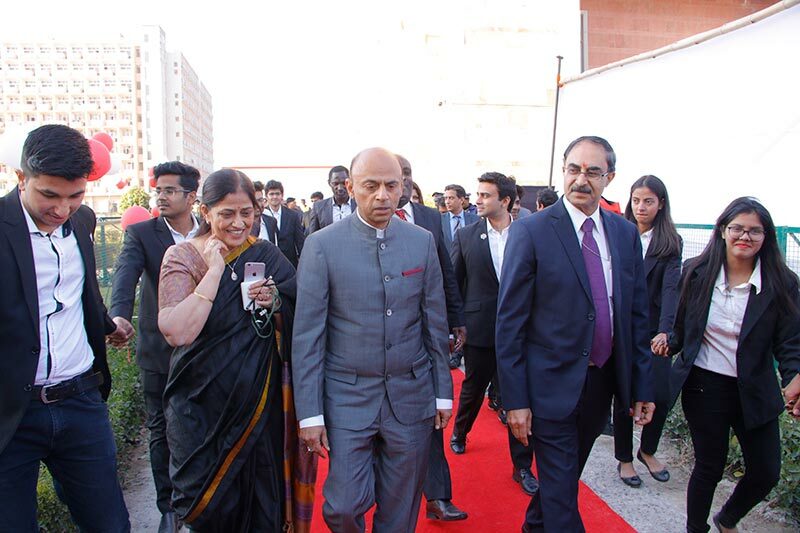 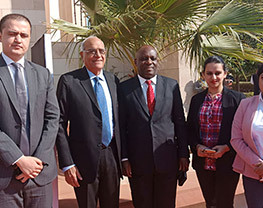 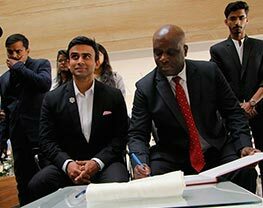 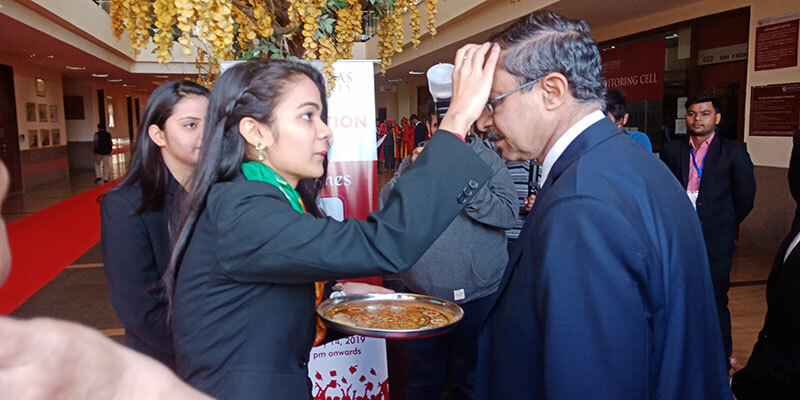 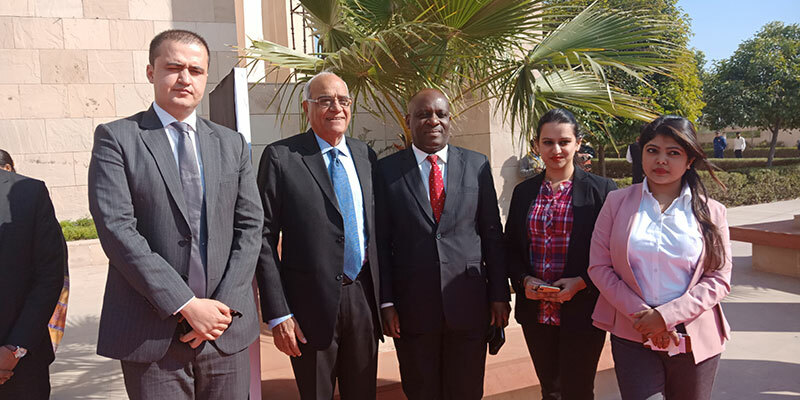 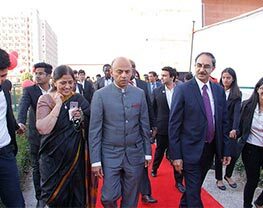 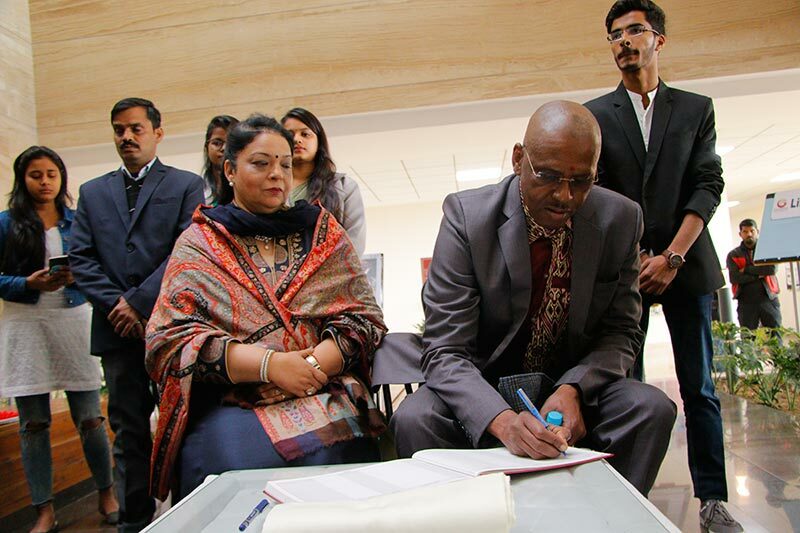 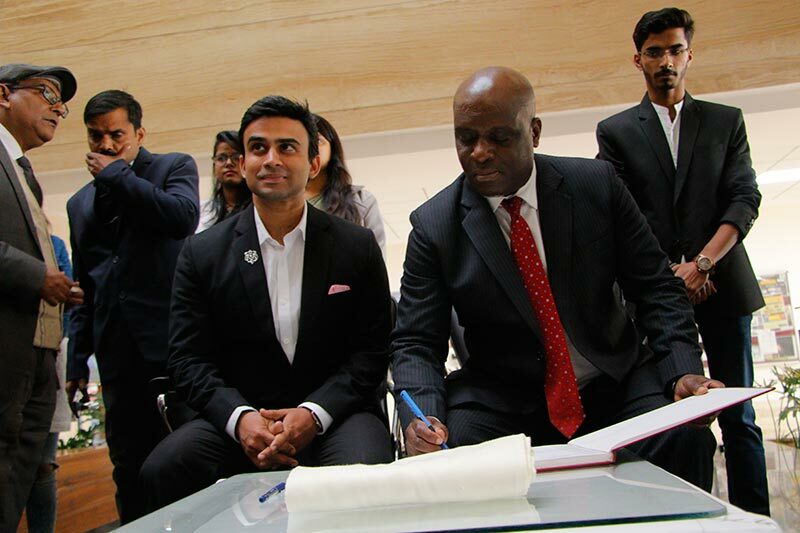 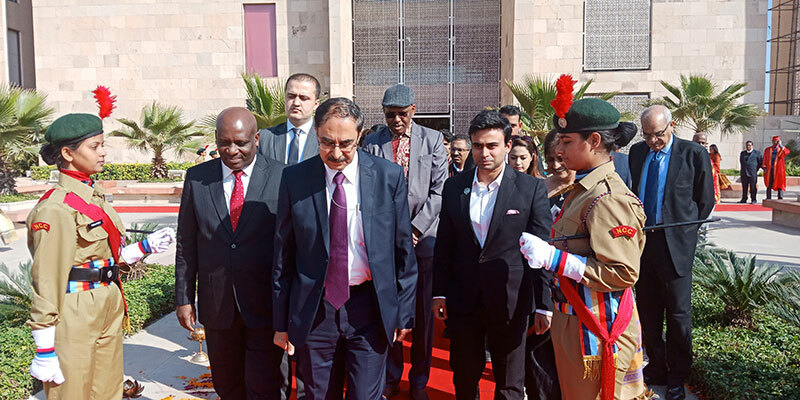 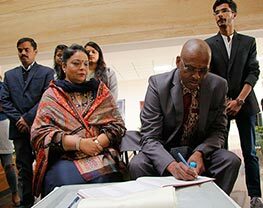 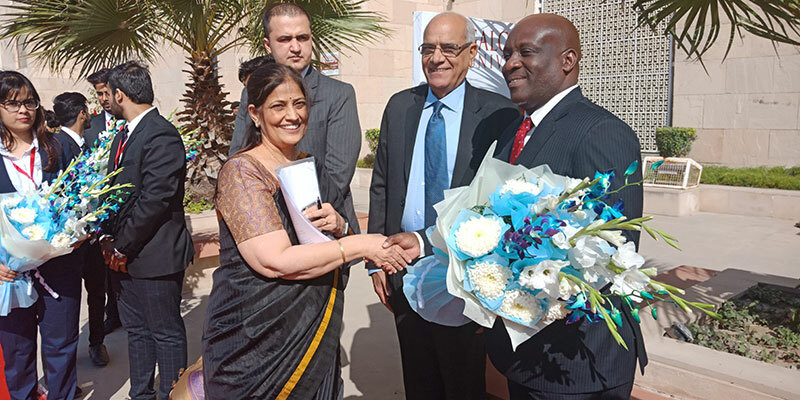 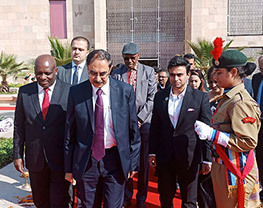 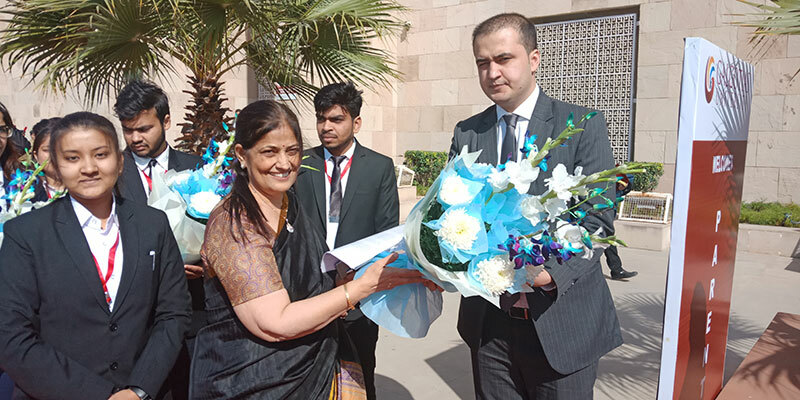 During this Chancellor Sunil Galgotia, CEO Dhruv Galgotia, Vice Chancellor Renu Luthra and ambassador of Tanzania remained present at the dice. 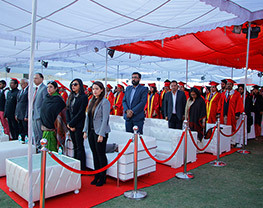 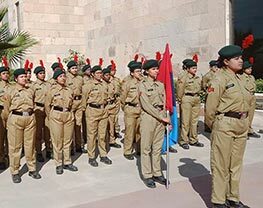 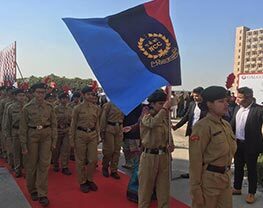 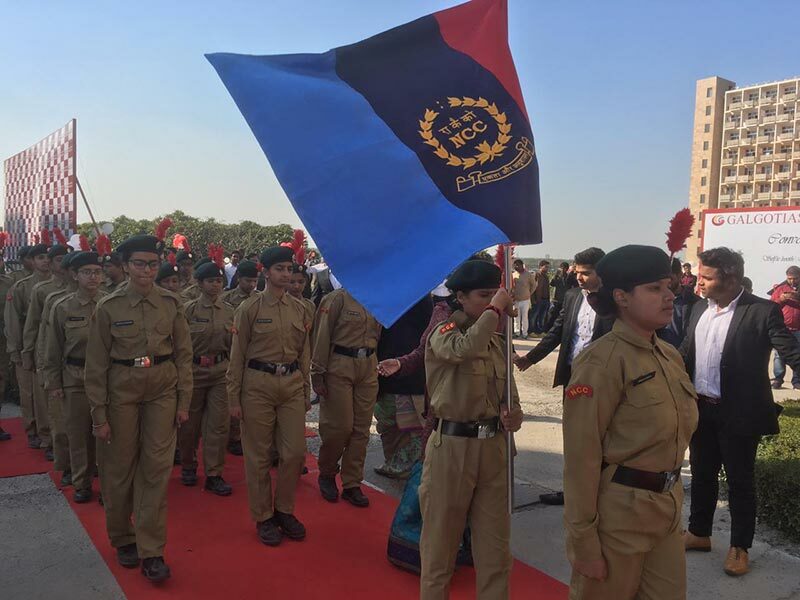 The program began with academic procession arriving at the venue and taking their respective seats on stage and front rows. 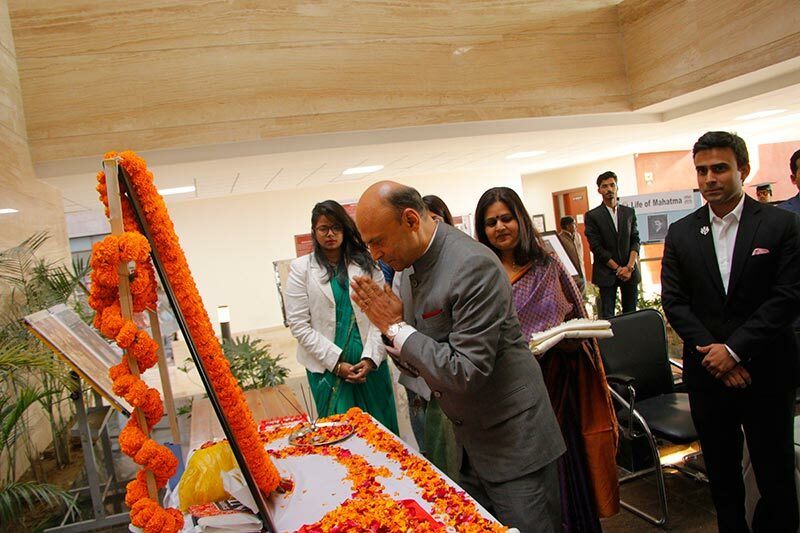 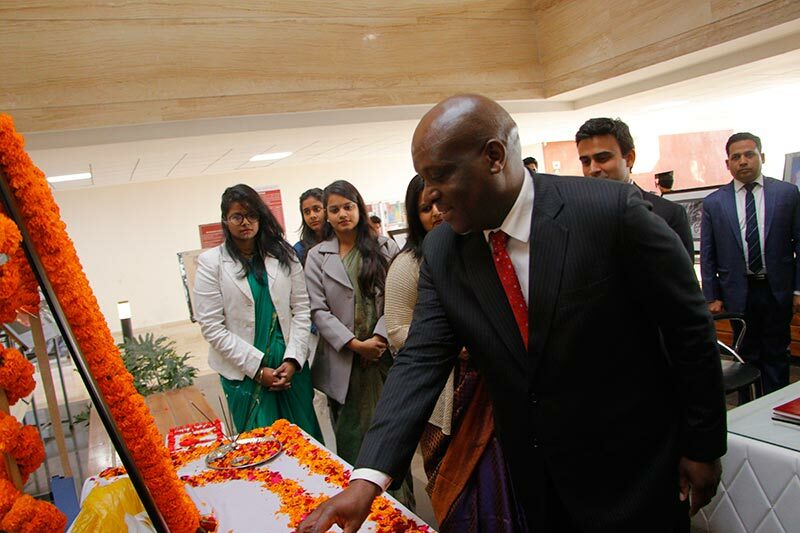 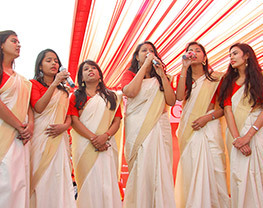 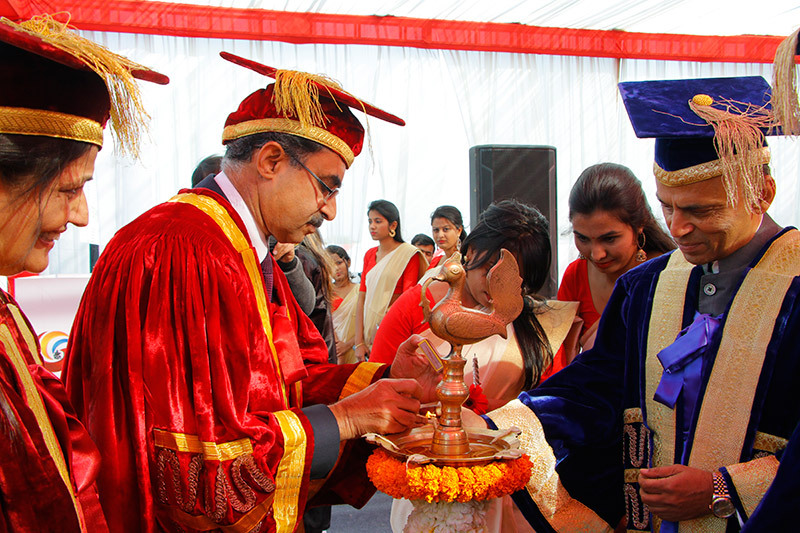 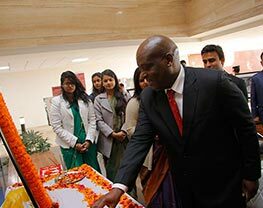 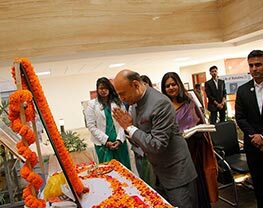 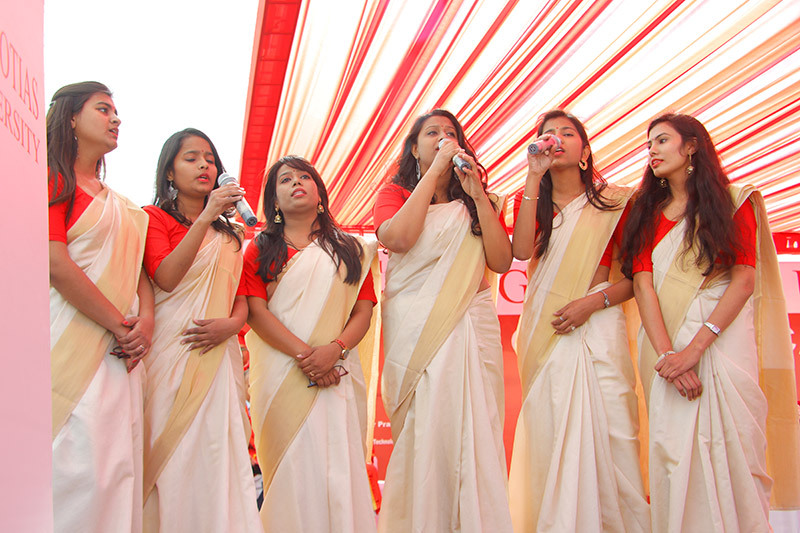 There after ritual of lighting the lamp was done followed by a Saraswati Vandana sung by university students. 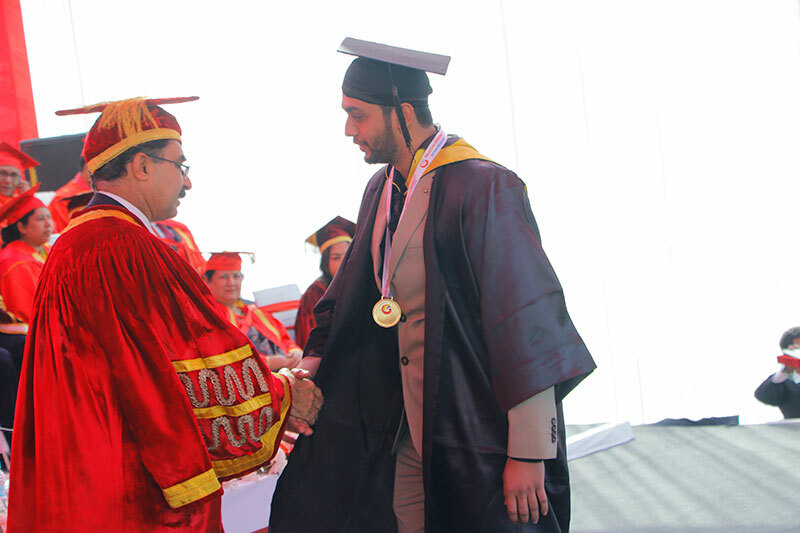 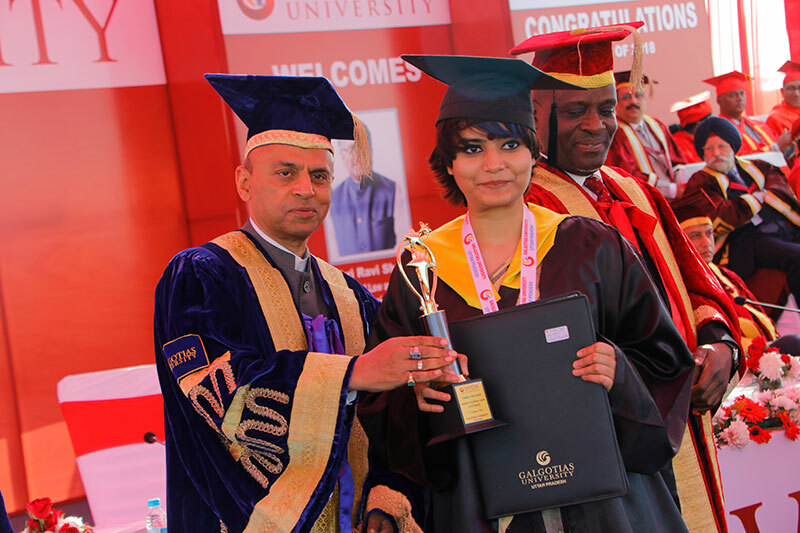 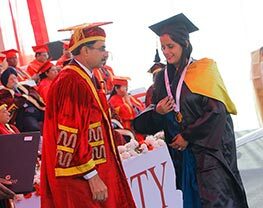 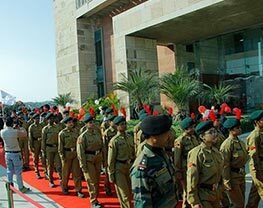 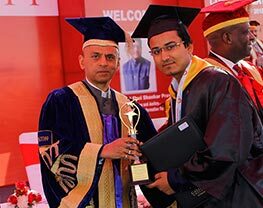 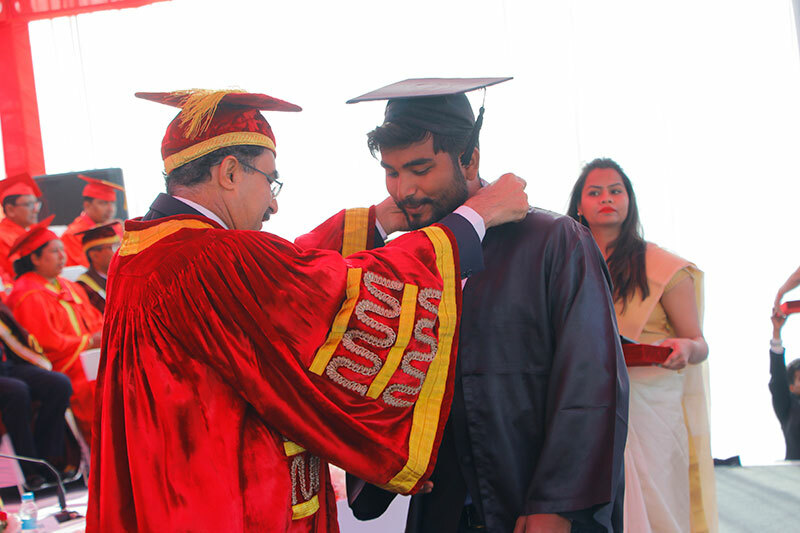 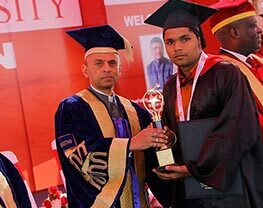 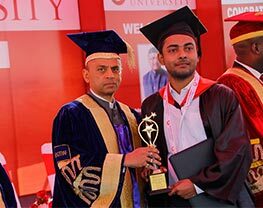 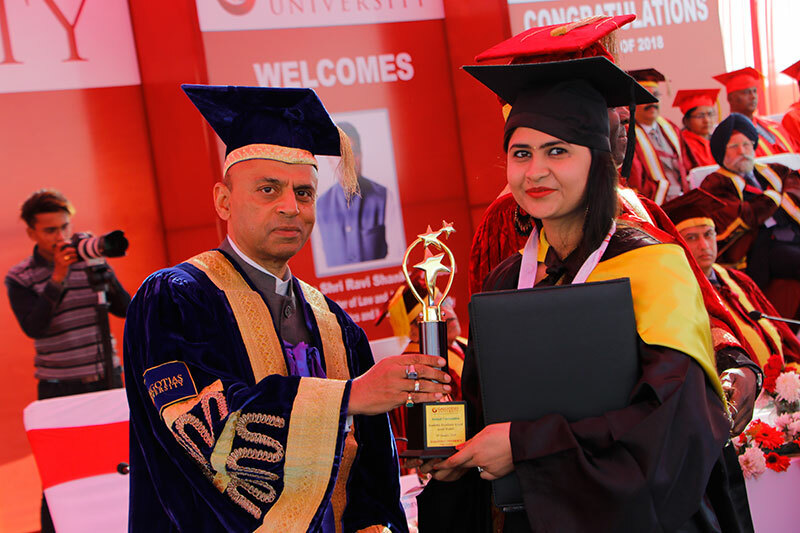 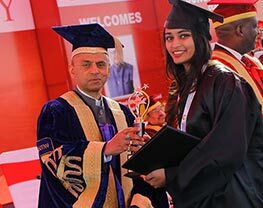 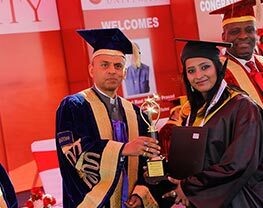 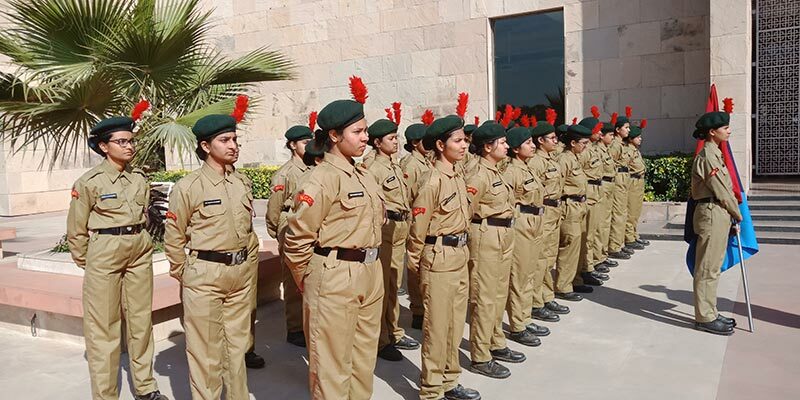 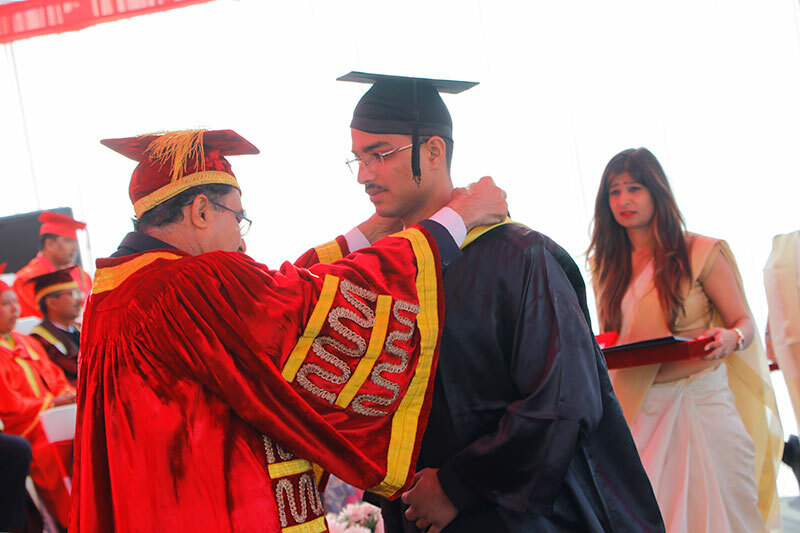 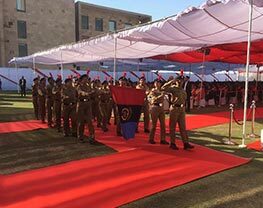 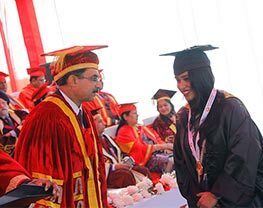 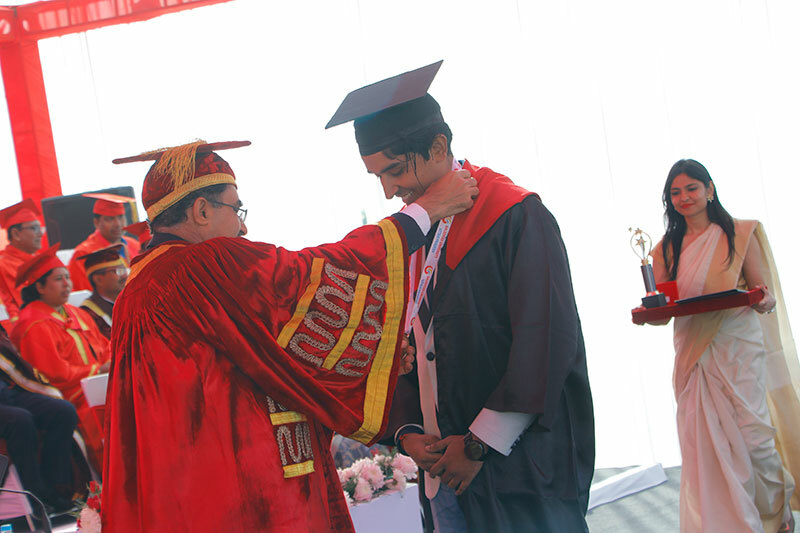 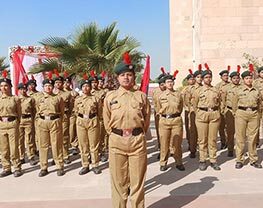 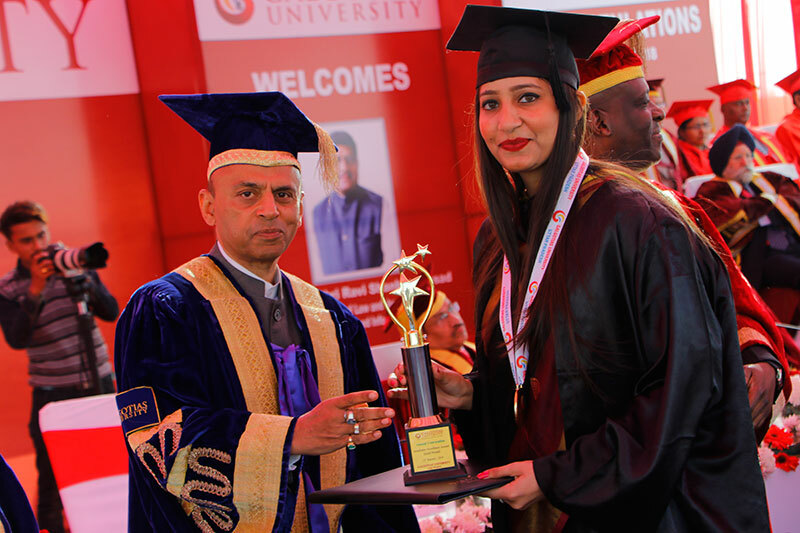 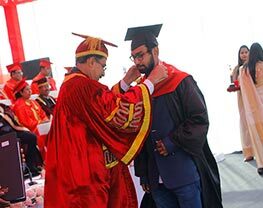 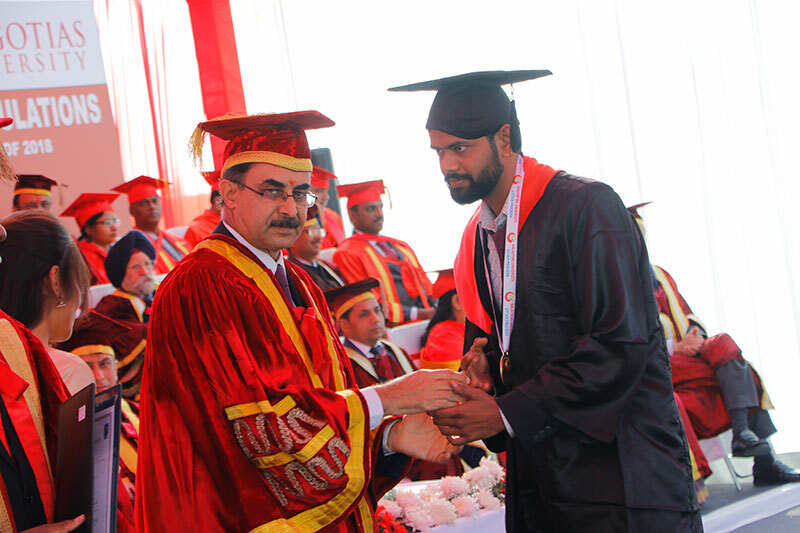 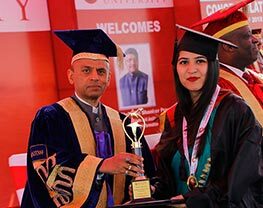 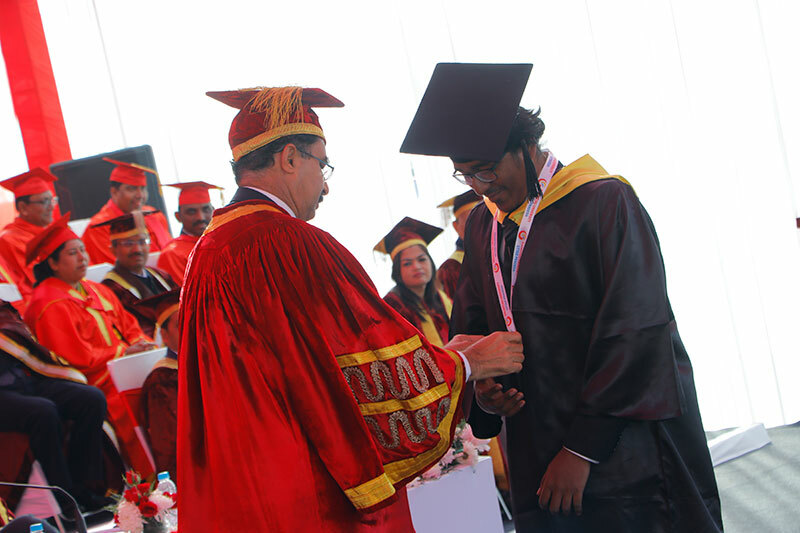 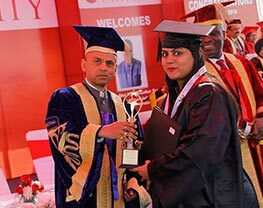 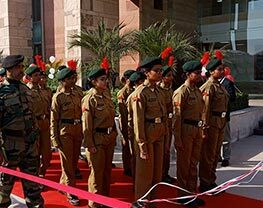 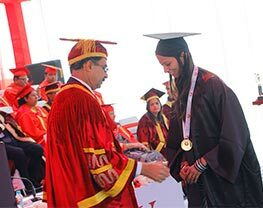 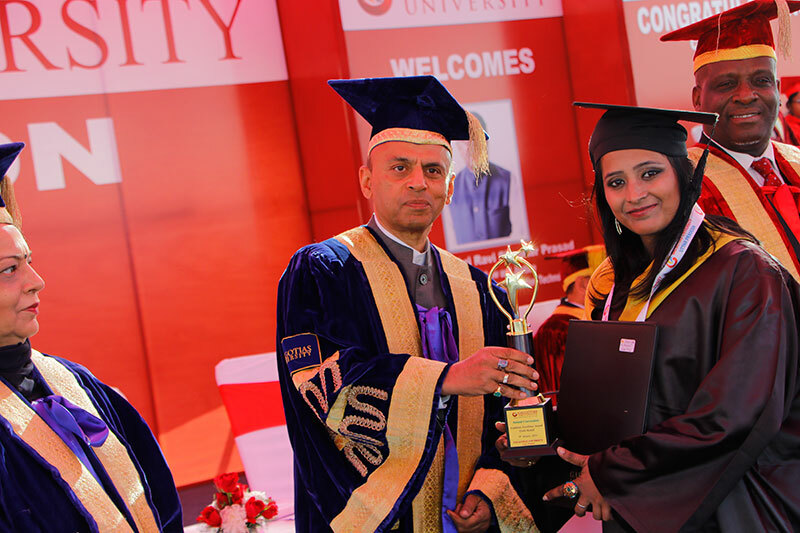 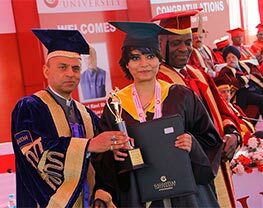 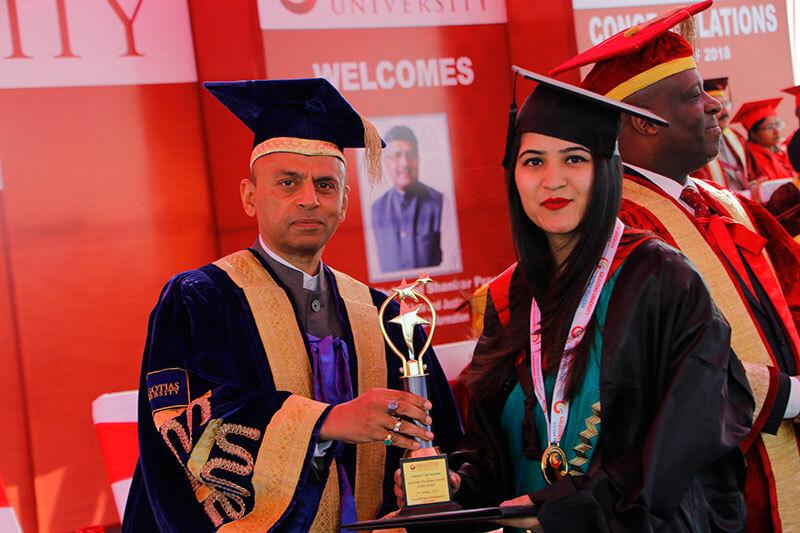 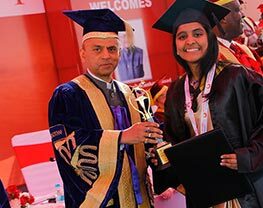 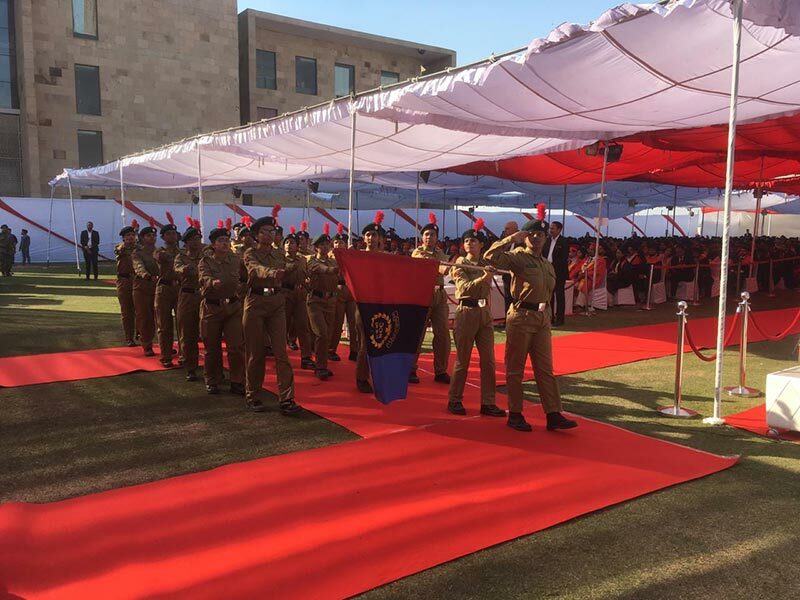 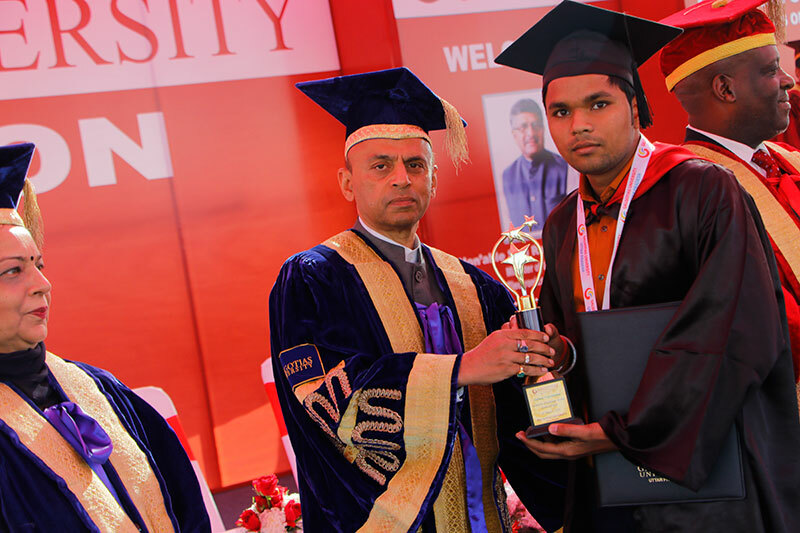 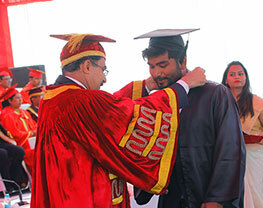 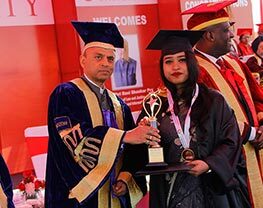 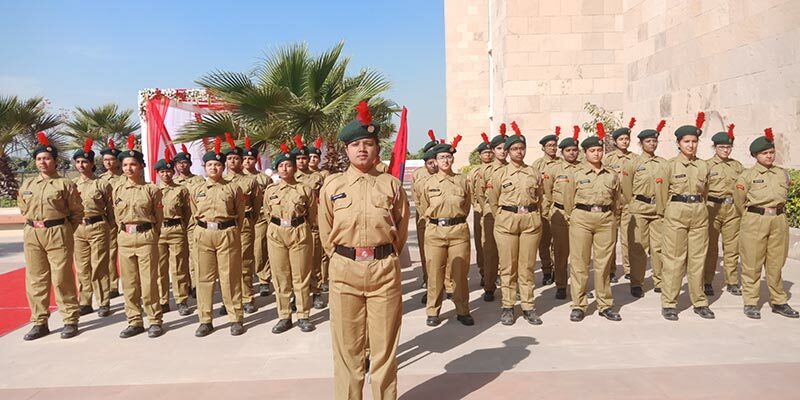 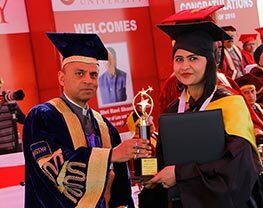 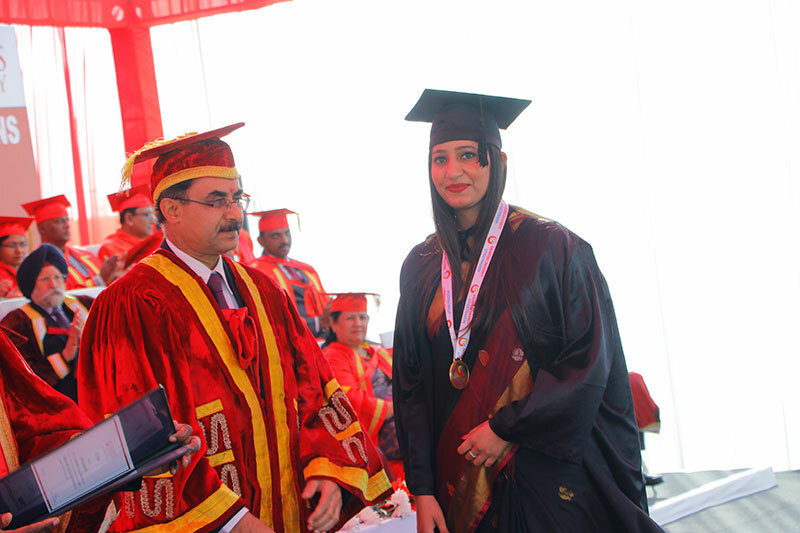 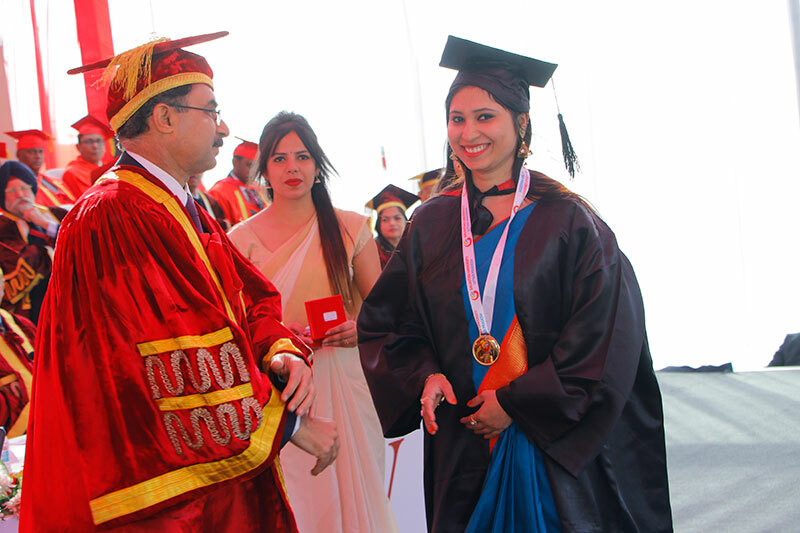 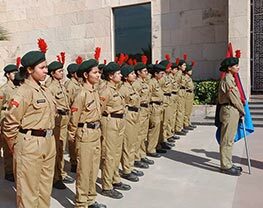 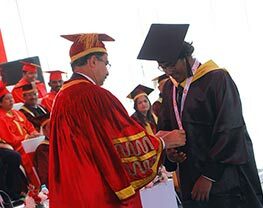 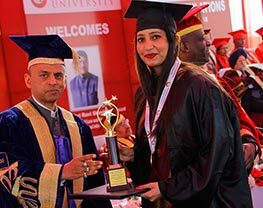 During the convocation ceremony, a total of 54 graduates were felicitated with gold medals and 37 with silver medals by the chief guest. 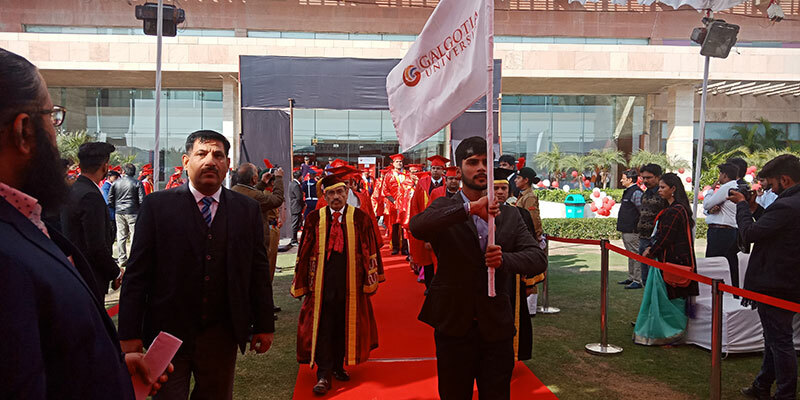 In the welcome address, Chancellor Sunil Galgotia said "Today I am really proud of our students that have done a lot of hard work and have learned right skills and have finally earned this day with a right to celebrate their success today. 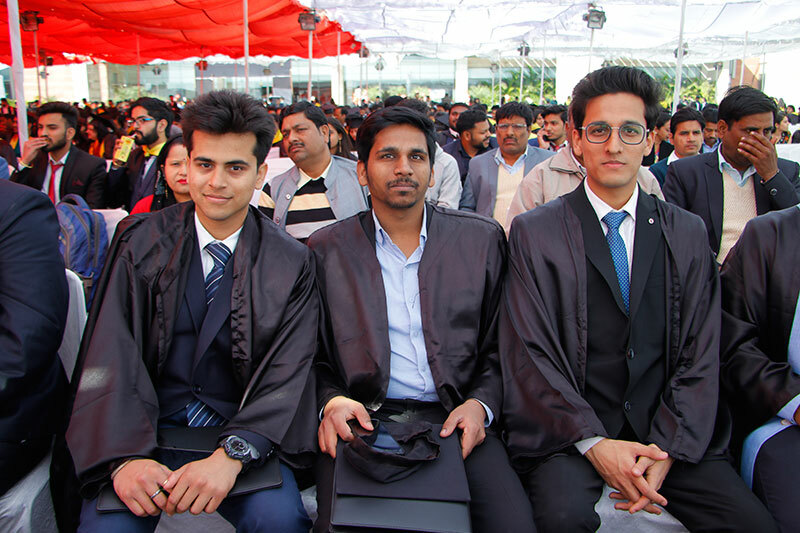 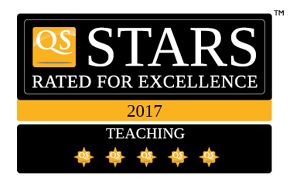 And I strongly believe that these all are now ready to face the challenges of real-world just like your colleagues of previous batches." 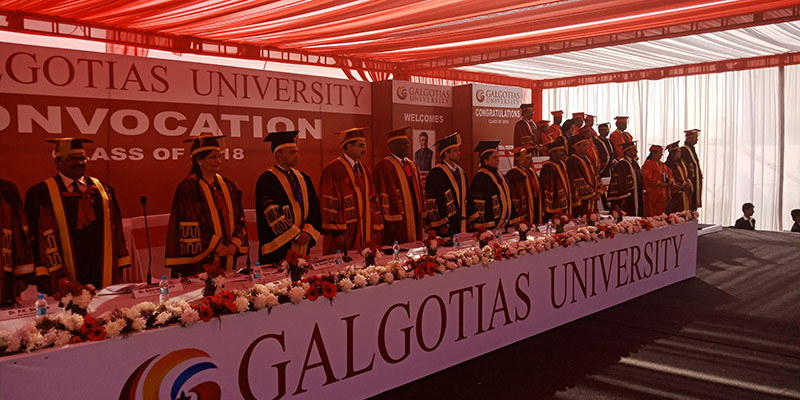 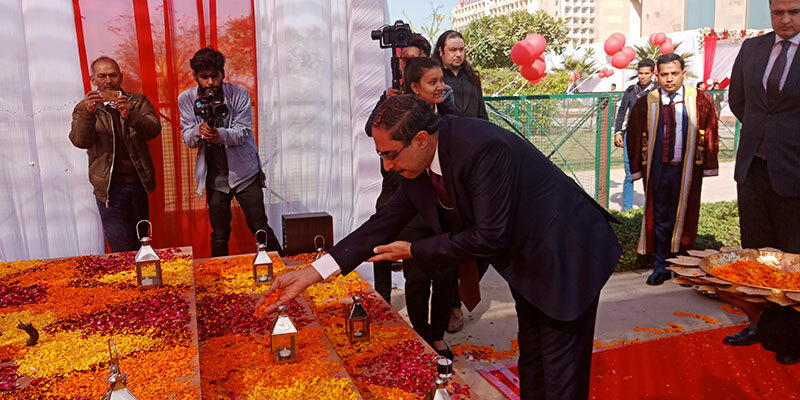 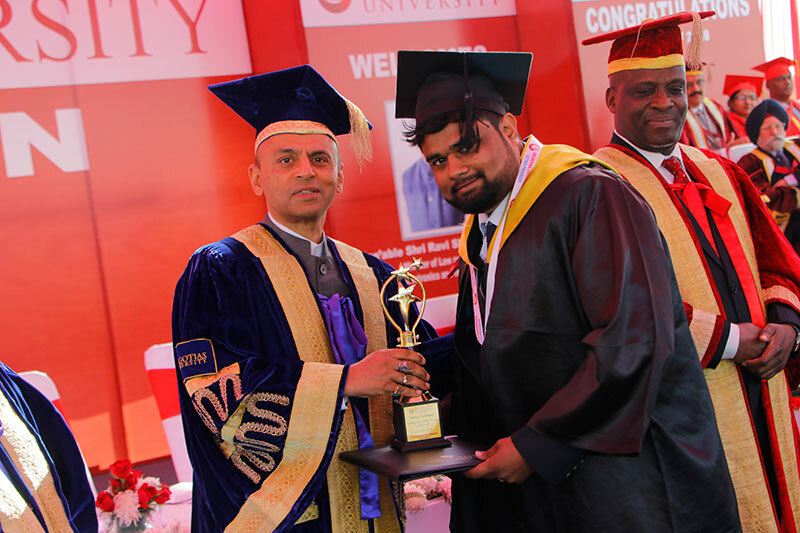 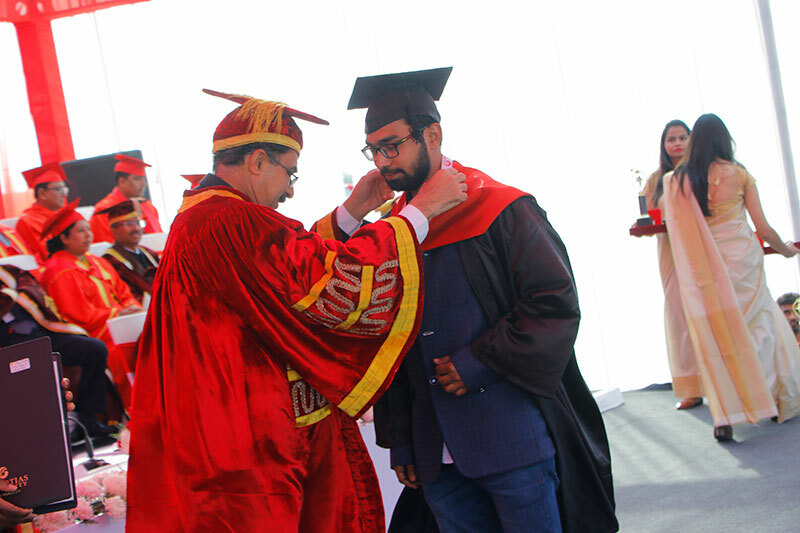 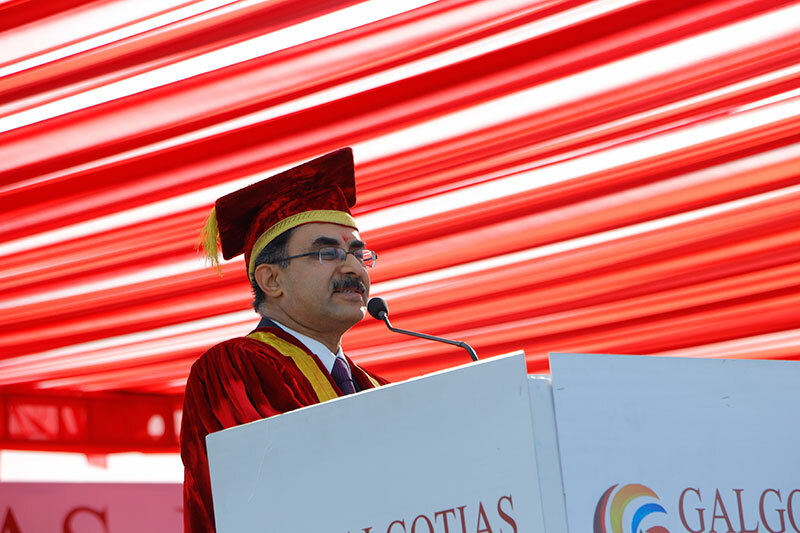 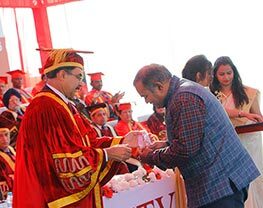 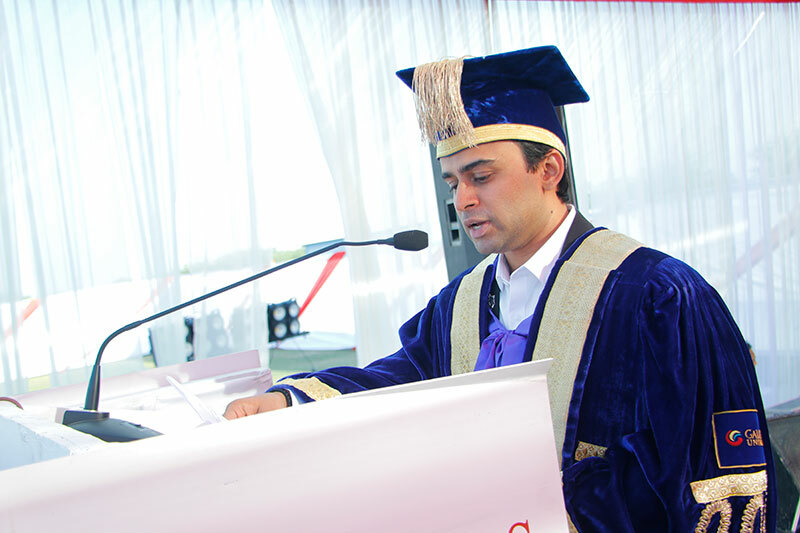 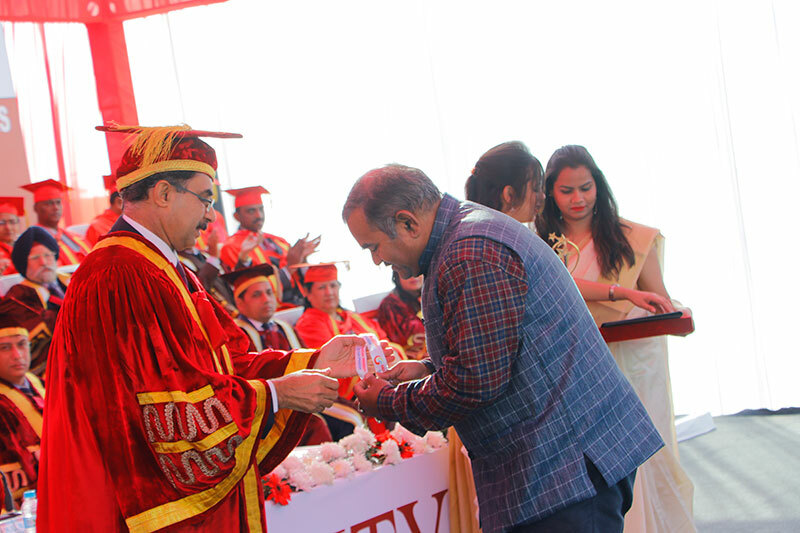 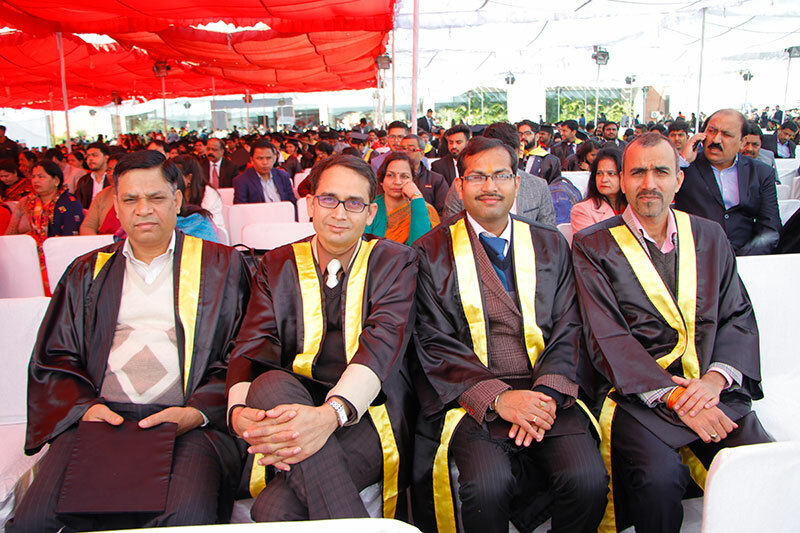 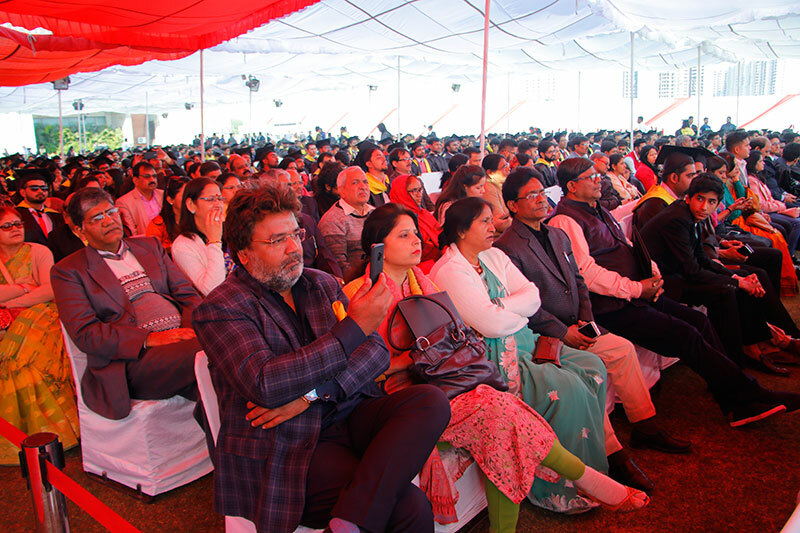 Speaking at the event Ajay Prakash Sawhney, said, "2534 students graduating in Just 8 years of this university existence is a big milestone and I would like to congratulate Mr. Sunil Galgotia for this achievement." 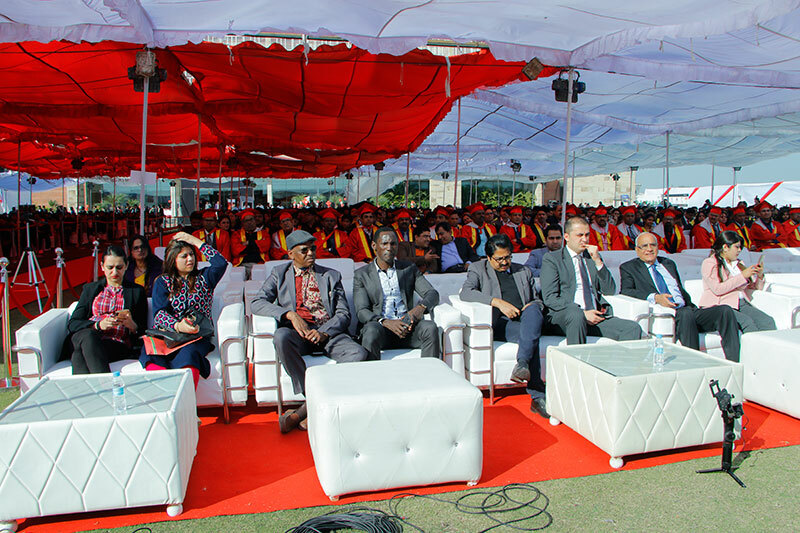 He addressed Students about developments in the digital world, and what are the opportunities they have in it and how they can harness benefits from these opportunities. 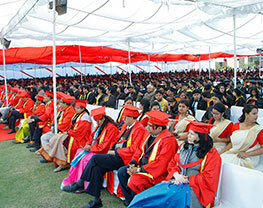 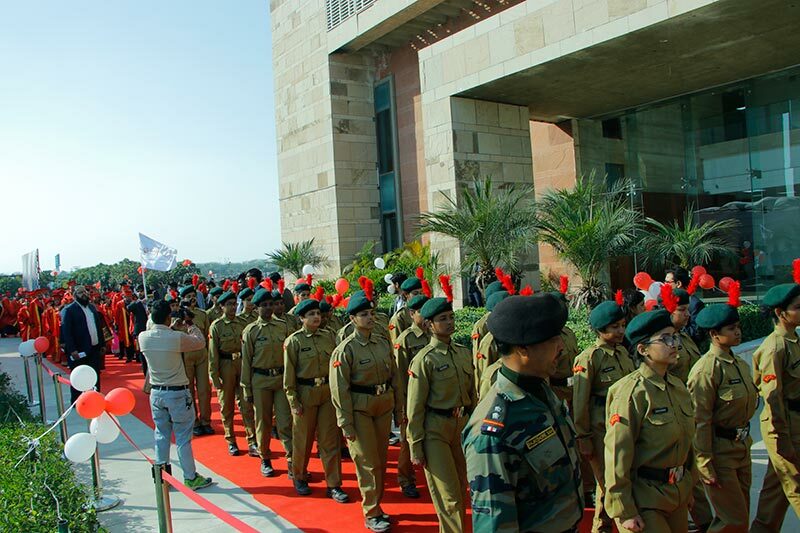 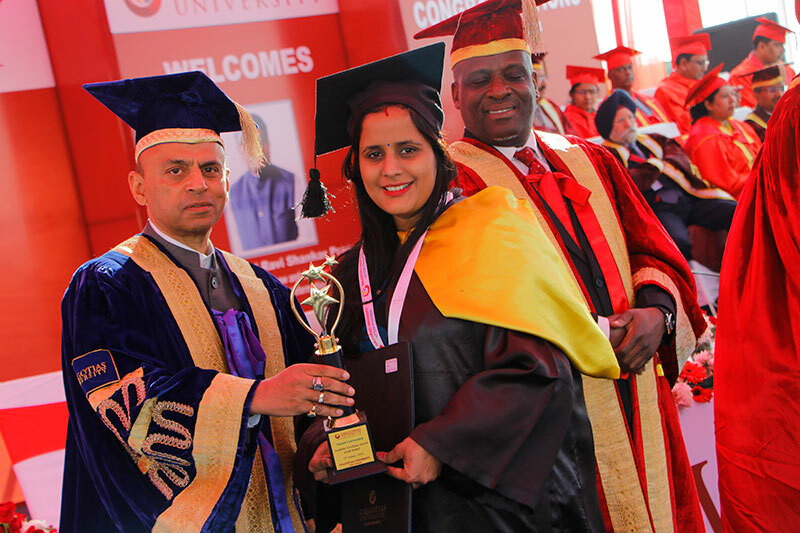 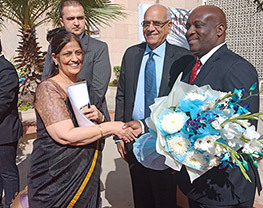 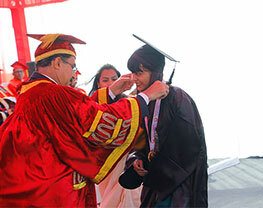 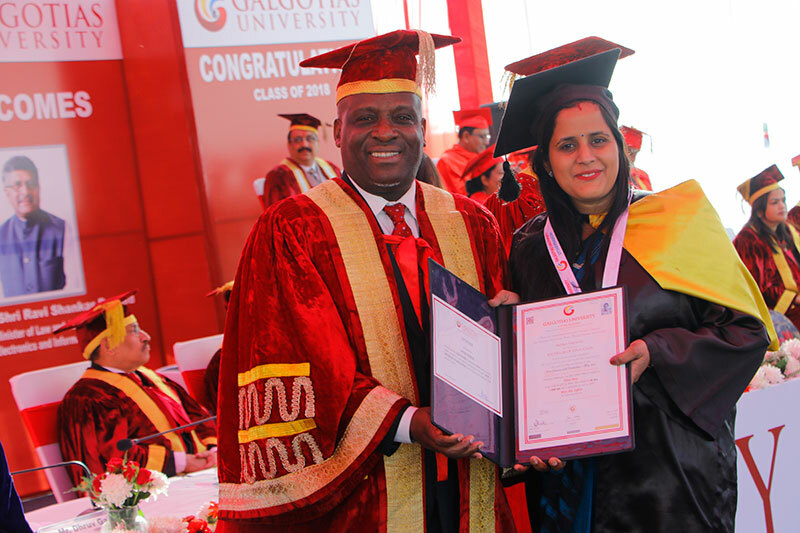 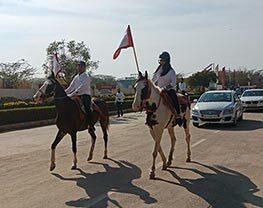 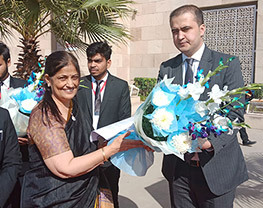 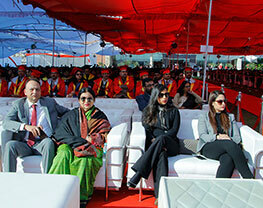 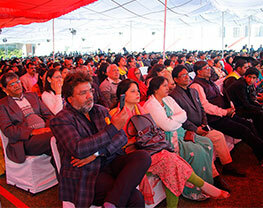 Vice Chancellor Renu Luthra in her address presented the annual report of the University. 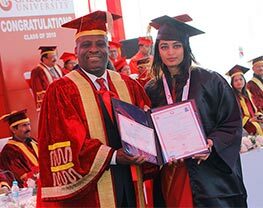 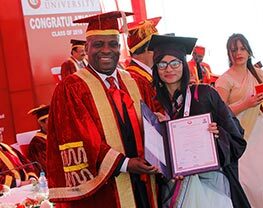 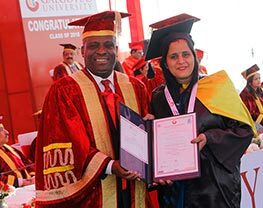 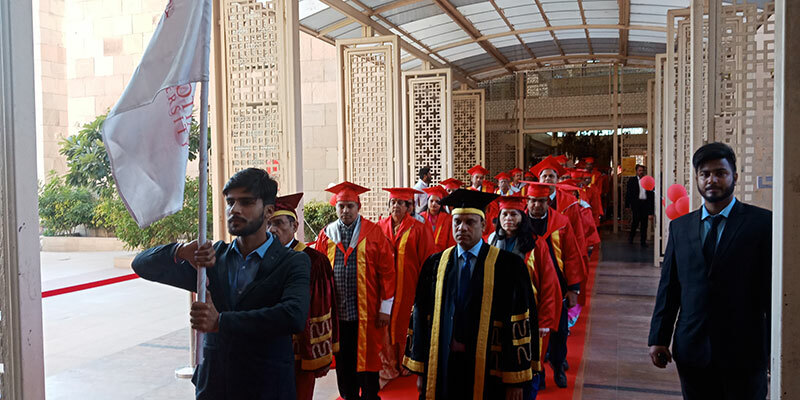 She also that the results of the graduating students were uploaded on the website of Government of India National Academic Depository and Aadhaar card were printed on the degrees of the student to bring more transparency. 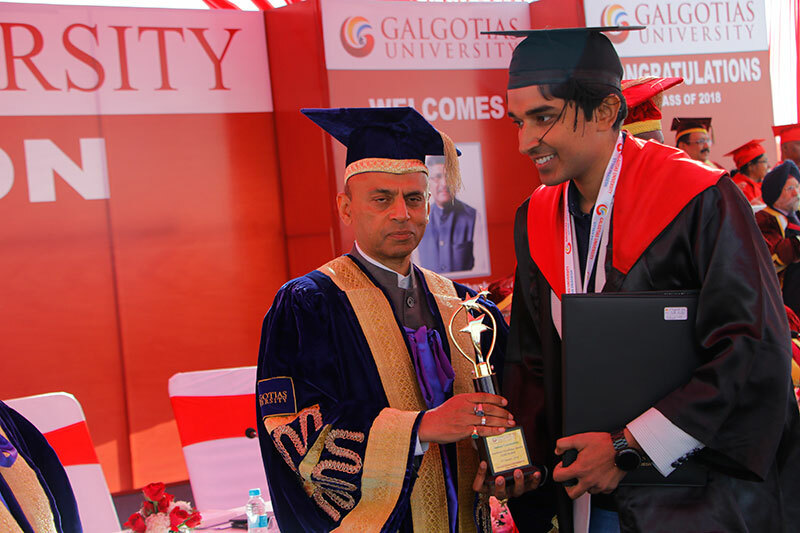 The program was concluded with vote thanks delivered by young and dynamic CEO of Galgotias University, Mr. Dhruv Galgotia. 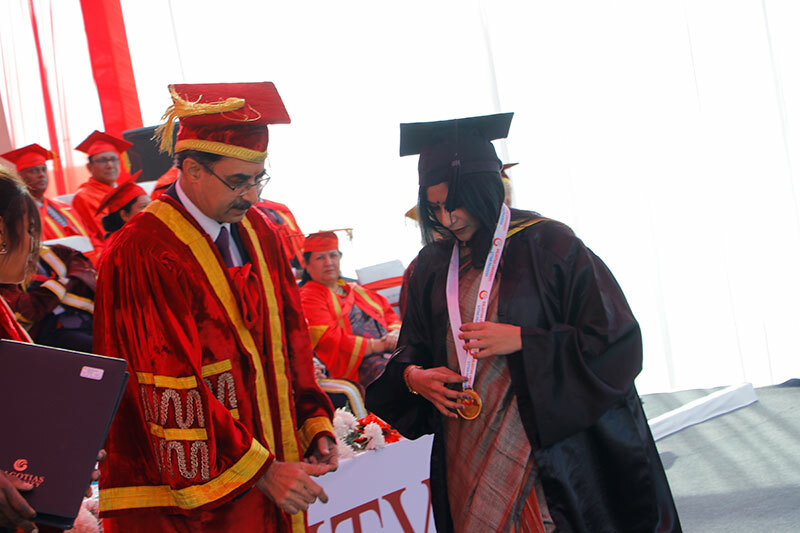 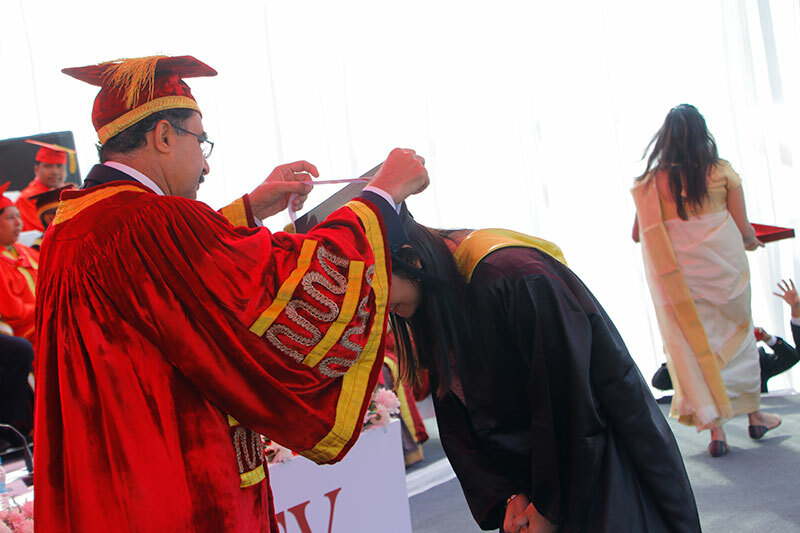 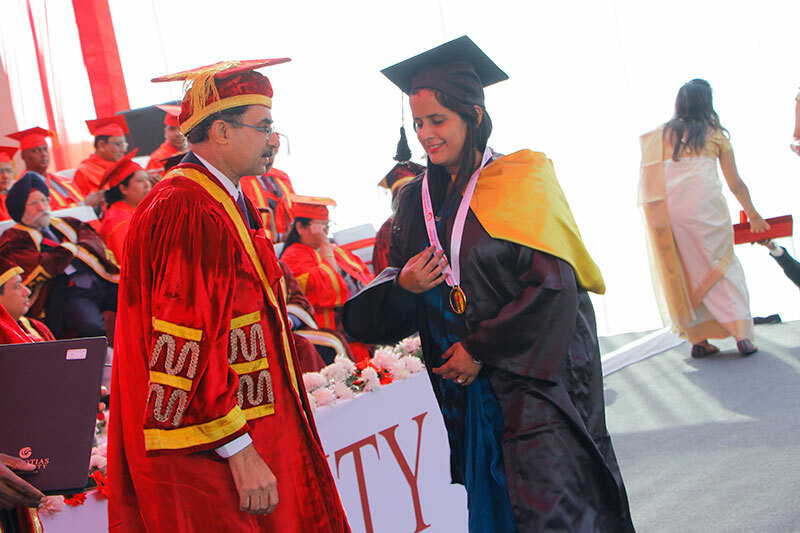 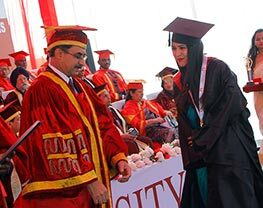 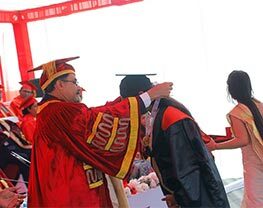 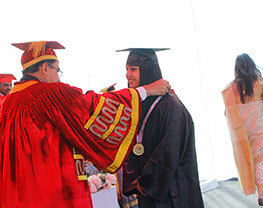 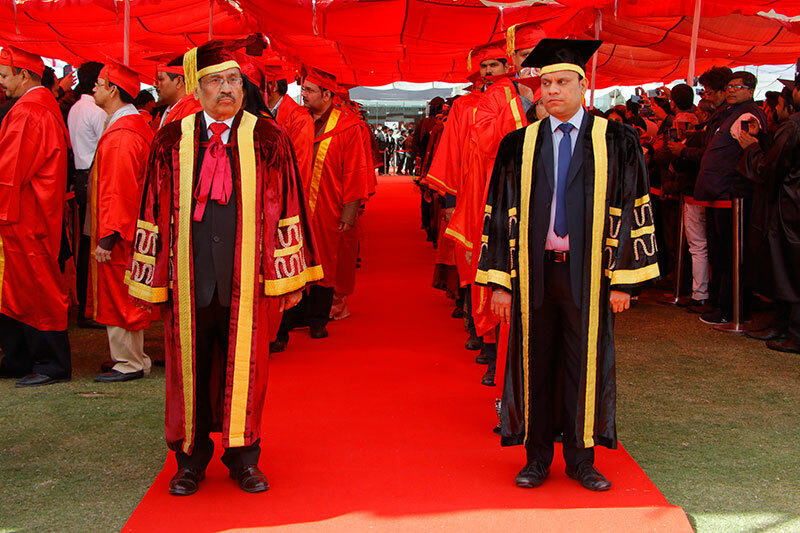 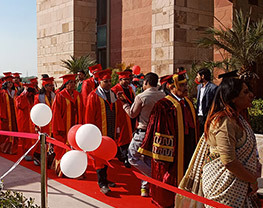 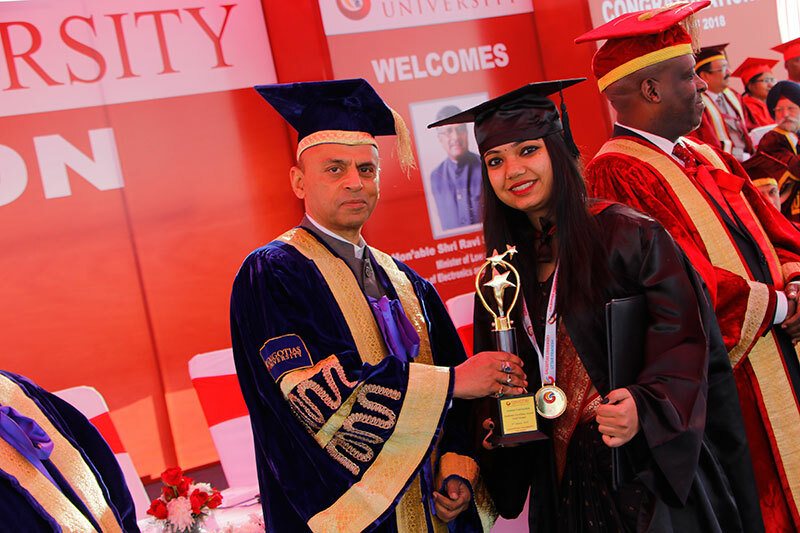 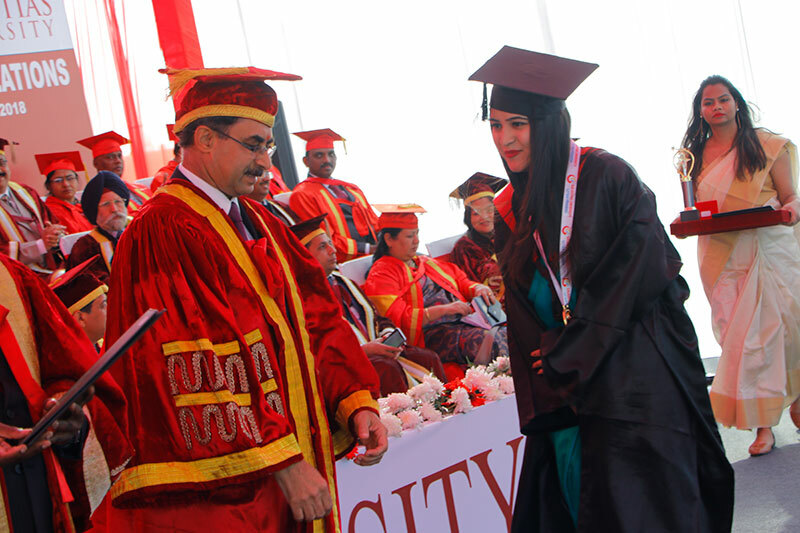 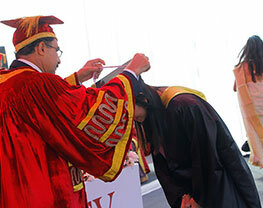 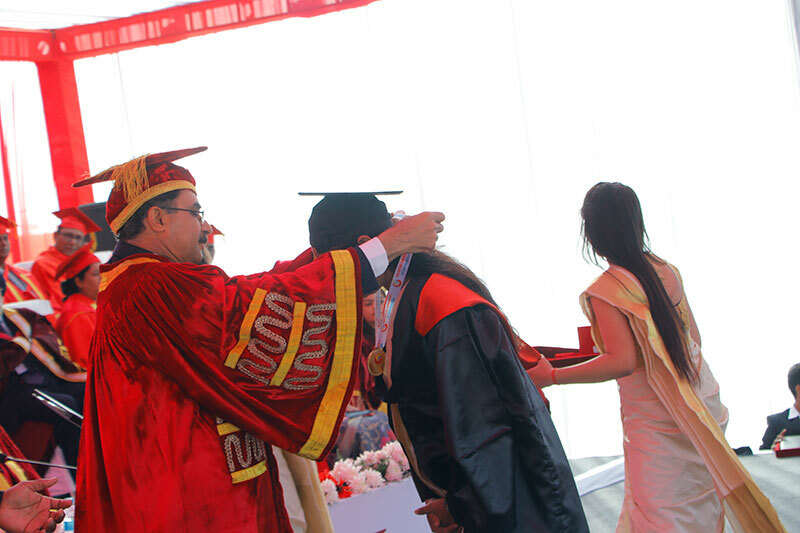 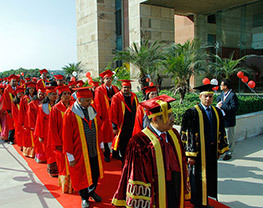 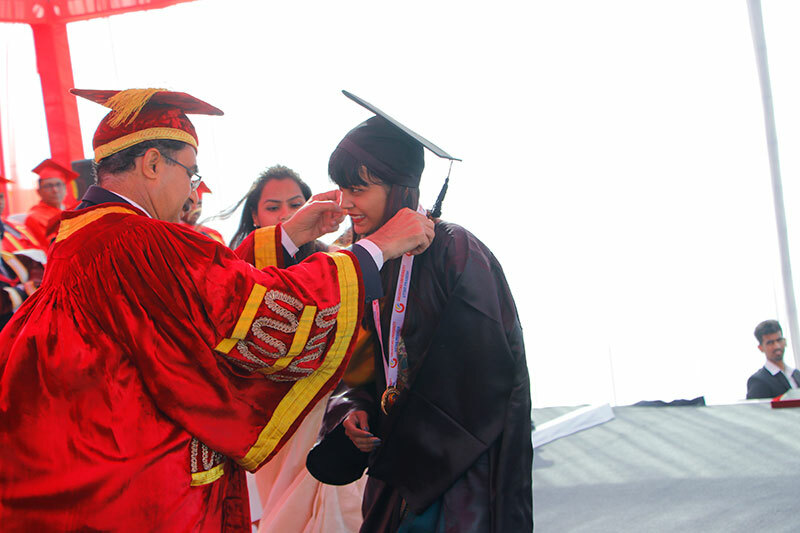 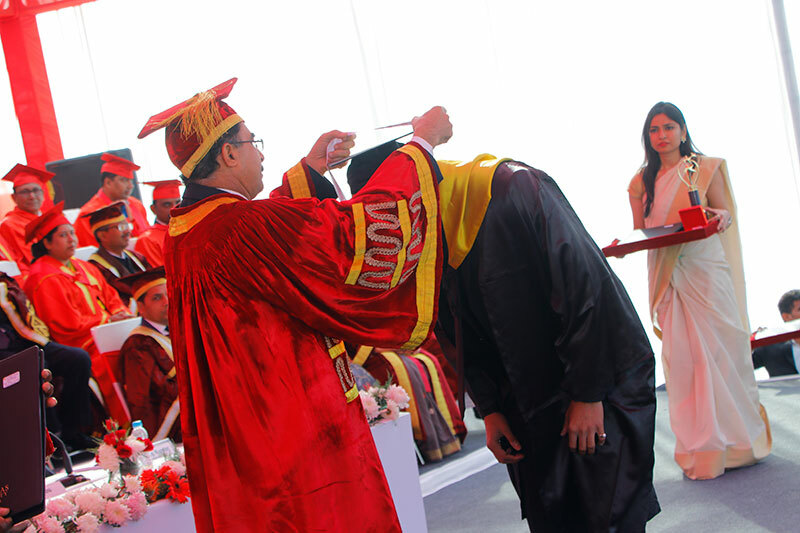 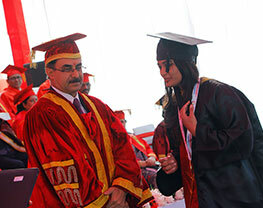 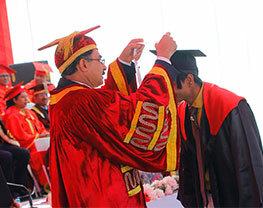 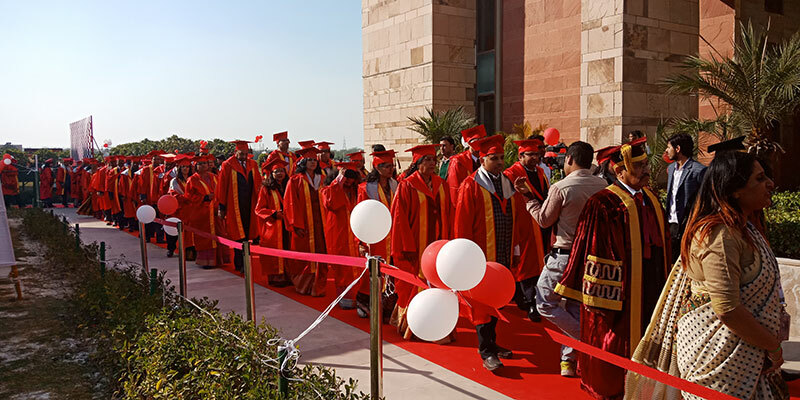 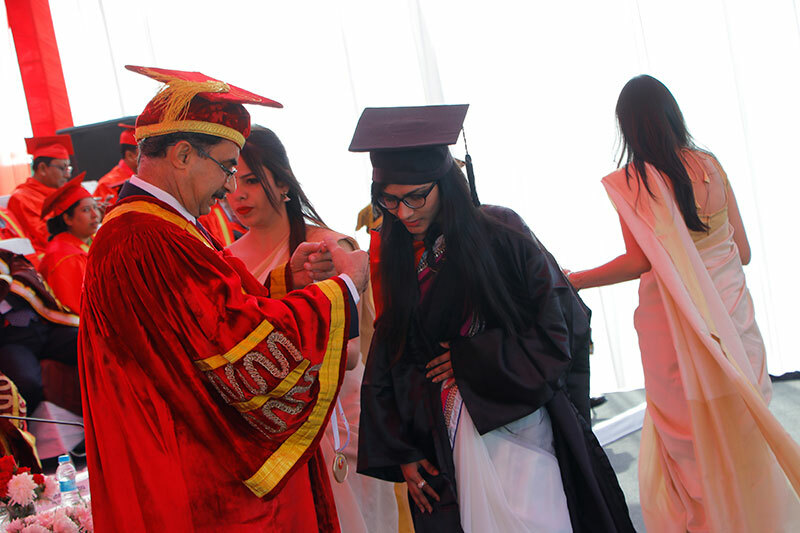 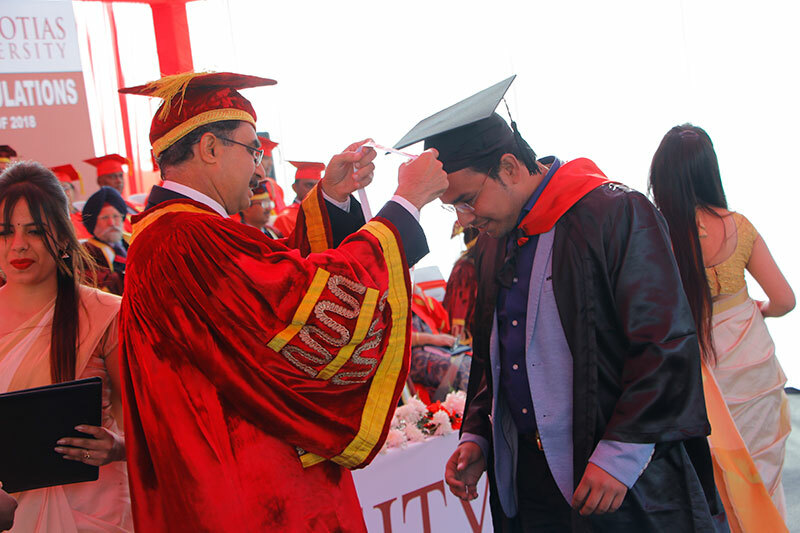 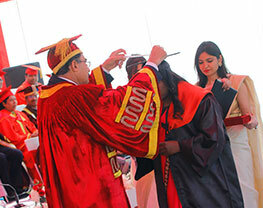 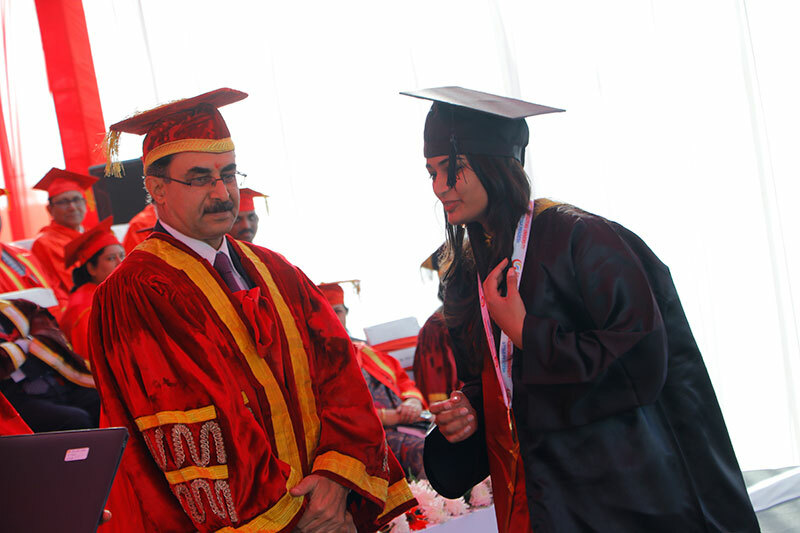 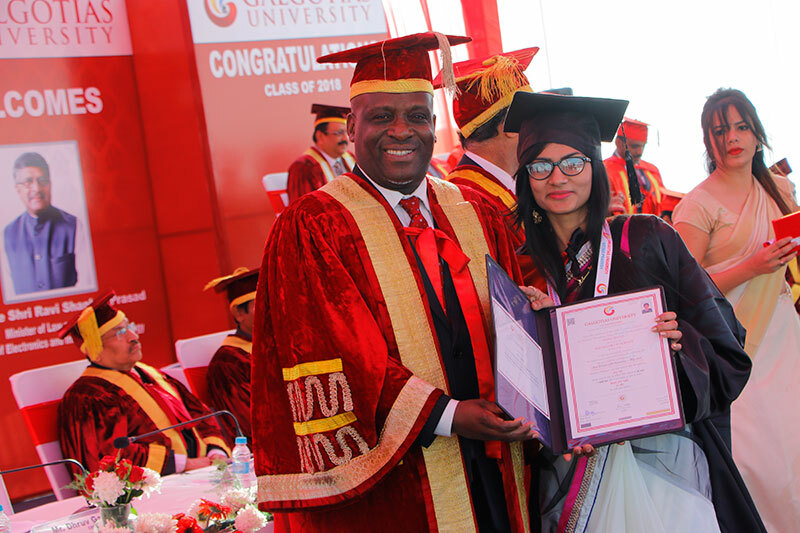 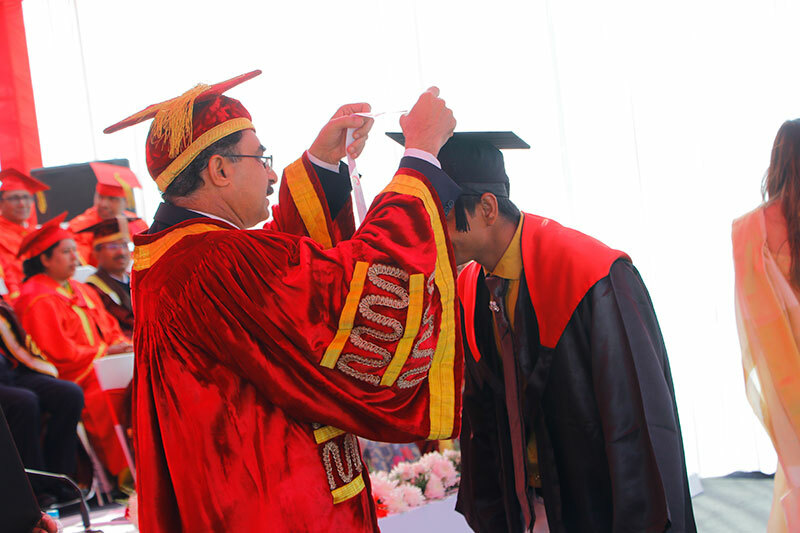 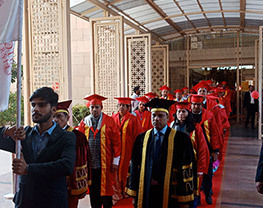 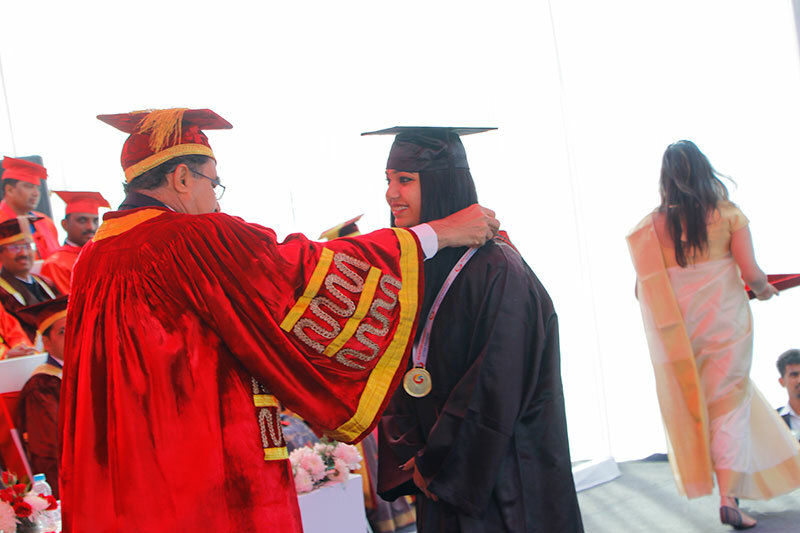 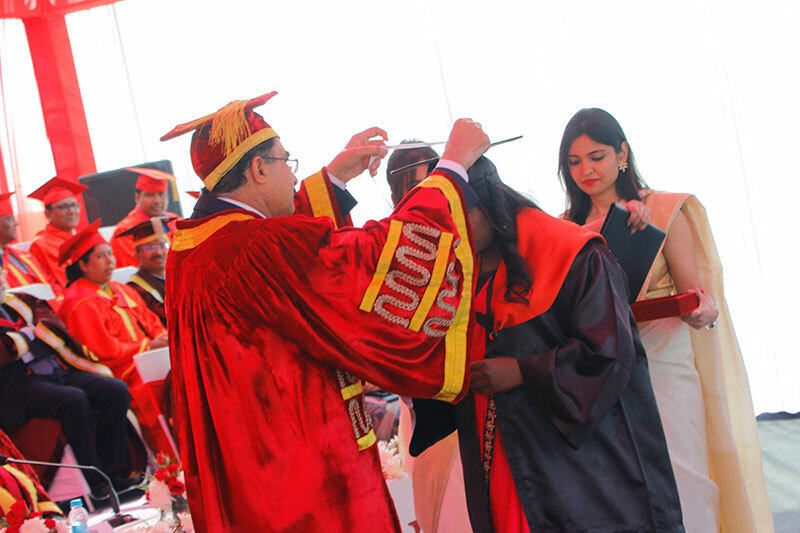 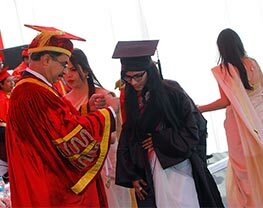 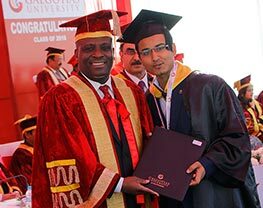 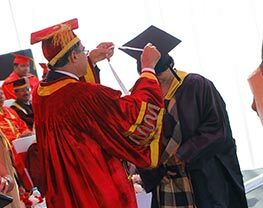 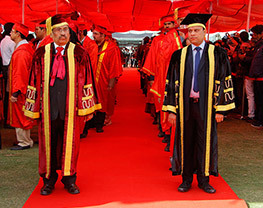 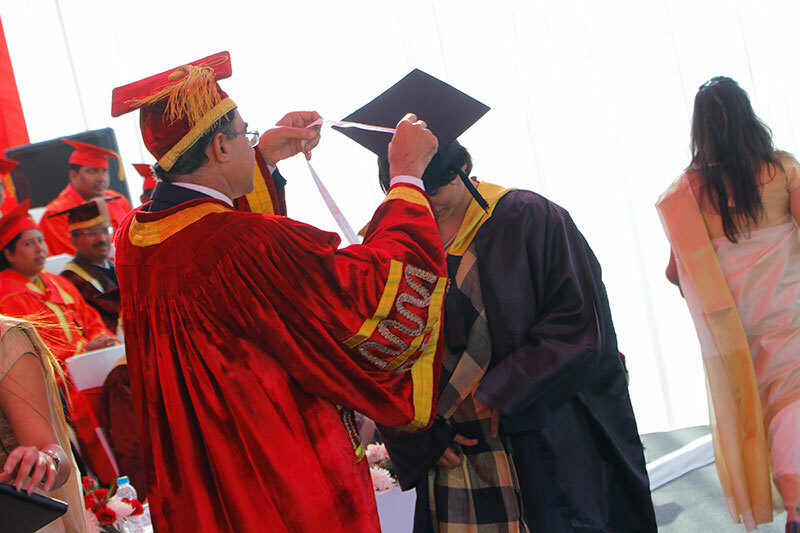 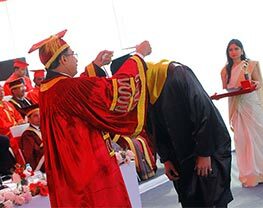 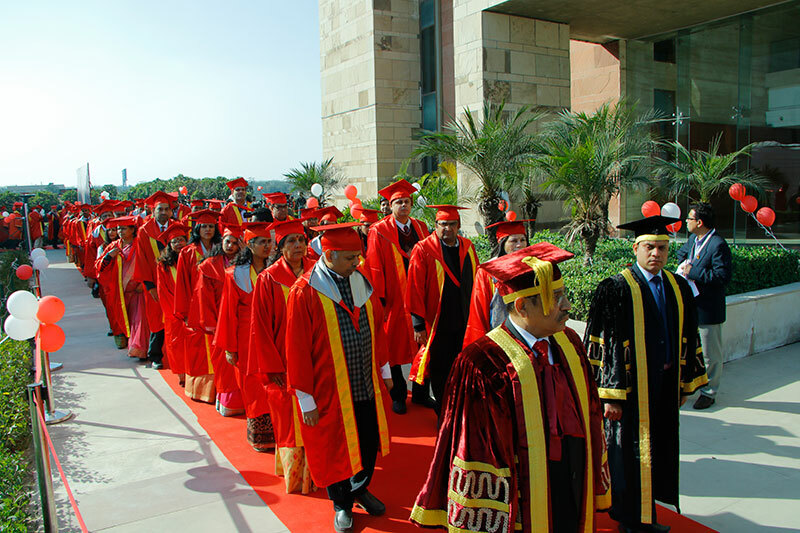 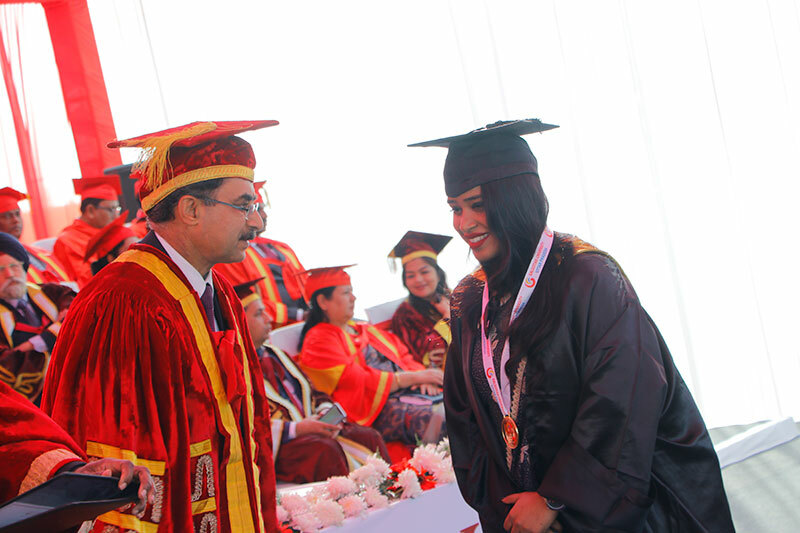 Following the distribution of degrees and medals, students were seen getting photographed in their customary convocation hats and gowns. 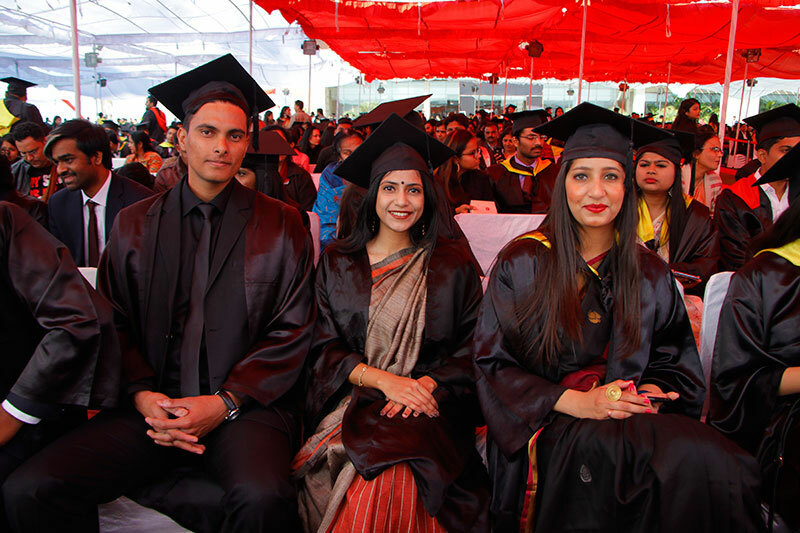 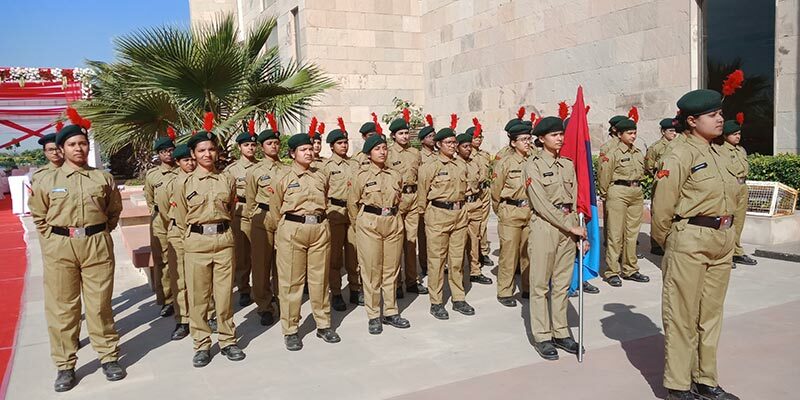 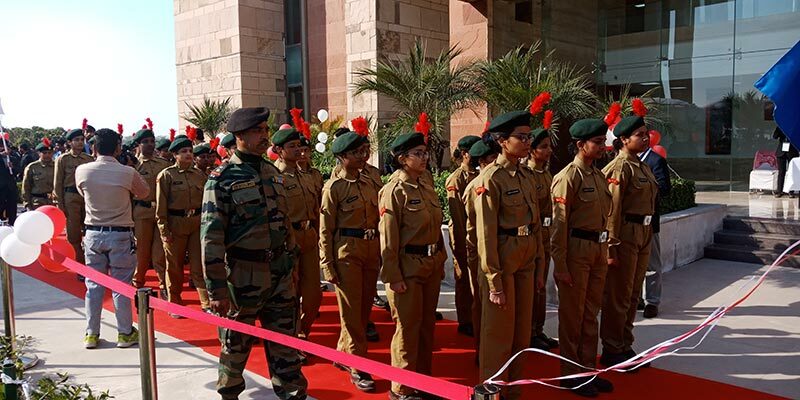 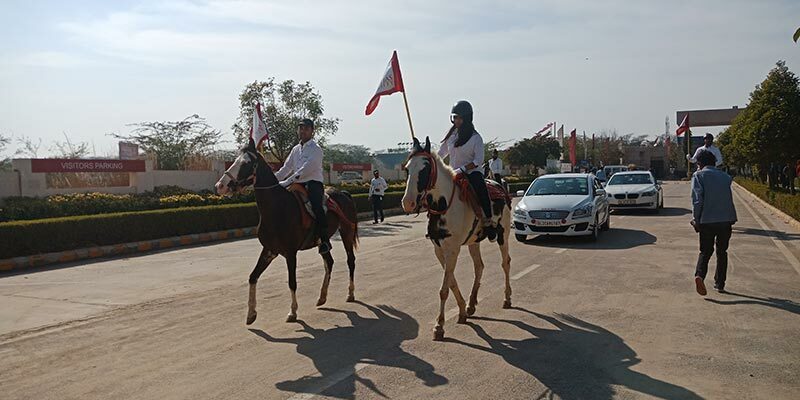 Beaming with smile and pride, every student looked stunning and pumped up to conquer the world.